It’s Thanksgiving Day. The day that Americans post their thoughts on things that they’re grateful for. Two years ago, I wrote an EV Thanksgiving post focused on all the EV choices that we get in California. Since then several other models have been introduced, with the latest one being the Tesla Model X. Another thing I can be thankful for is the safe, little EV that my mom was drving that met its untimely demise when an SUV merged into her. It did its job and protected her through the whole process and reminds me that i have to re-emerge from the cocoon I’ve been in and help her find a new EV to replace little OB-8. I’ve been very busy lately and have started, but not finished a few blog posts that have not seen the light of day. Namely a draft of my Tesla Model S 70D experience (it’s what we drove from SoCal to the Bay Area in September for the Model X Launch party. 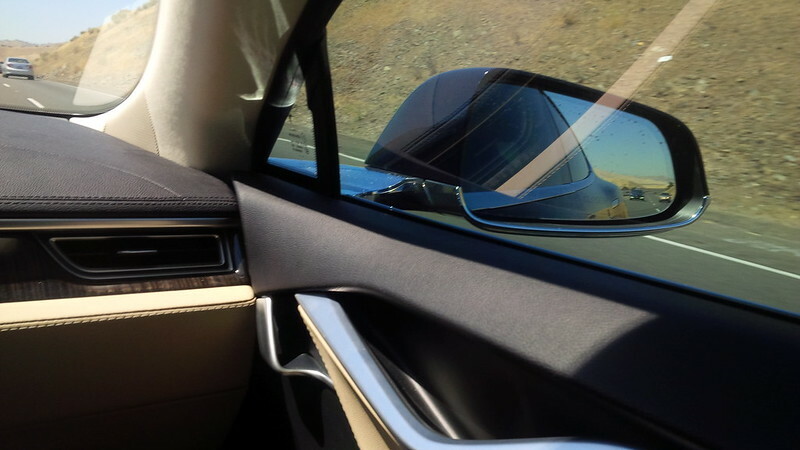 A draft of my month of driving a Tesla Model S P85, P85+, P85D, and 70D in the same month. and so much more… I’ll get to it… eventually. So, loyal readers, what have I been up to? A few months ago, I was approached and engaged by EV Connect, Inc. an EV Charging Solution provider [since I started writing this on Thanksgiving Day, I didn’t get formal approval to release my client’s name, so withheld for now] to assist them to manage and file a submission to design, construct, manage, maintain, analyze, and report on the nine electric charging highway corridors that the State of California, via the California Energy Commission (CEC), has decided to fund in its 2012 agreement with the states of Oregon and Washington, along with the province of British Columbia to create the West Coast Electric Highway. It’s been a fun three months of working in a field that I’ve grown into. These nine corridors had differing distances, budgets, and preferred number of chargers to install. 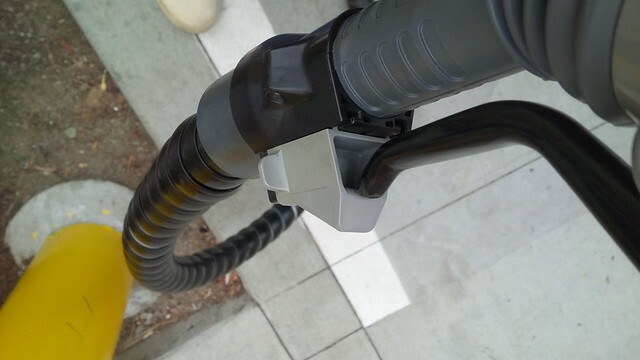 The first seven were required to have both CHAdeMO and CCS for the equipment to be proposed and the last two were secondary and required CHAdeMO only, though preferred a combo CHAdeMO and CCS, but the budgets were also very tight. We had several months to find site sponsors, get equipment quotes, find construction partners, obtain additional funds, start the process to participate in the WCEH, and approach other constituents. 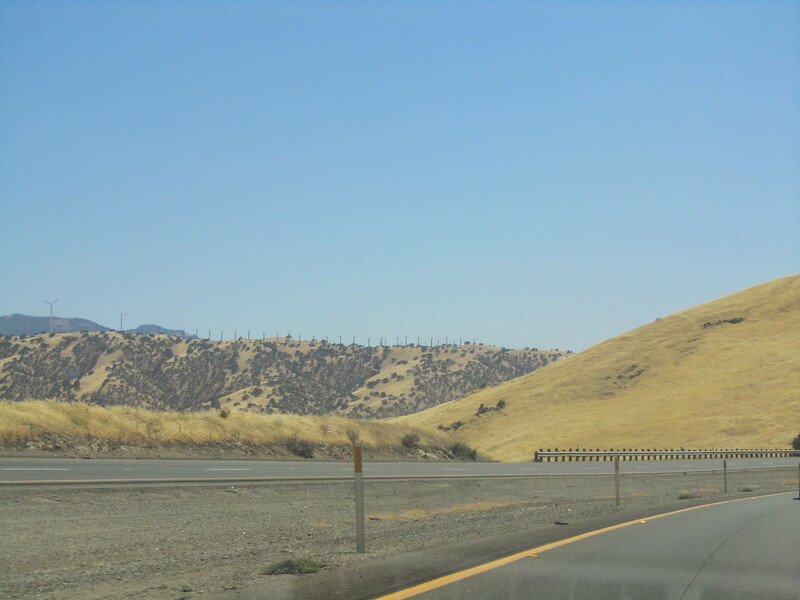 As a rEVolutionary, I am glad to see the expansion of the ability of light duty electric vehicles (your approx 80-100 mile range EVs in the parlance of the CEC proposal) to traverse the North-South corridors of California and eventually connect with Oregon, Washington, and beyond, but as a participant in the process, I’m biased. And hope that EV Connect, Inc. [name retracted for now, the awesome folks who hired me to work with them and get our bid in to fruition] win this bid! I truly am happy and thankful. Hopefully by this time next year, we’re well on our way to having this DC Fast Charge network being completed to get mom in her replacement light duty electric vehicle able to fast charge from the LA Area to wherever North or South she wants to head to… ’cause my input was to ensure that folks like her can travel these distances comfortably without getting stranded… So, fingers crossed. 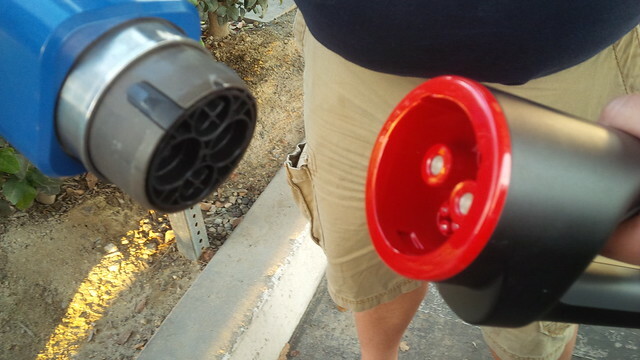 My original instructional post for using CHAdeMO only covered two different CHAdeMO chargers. 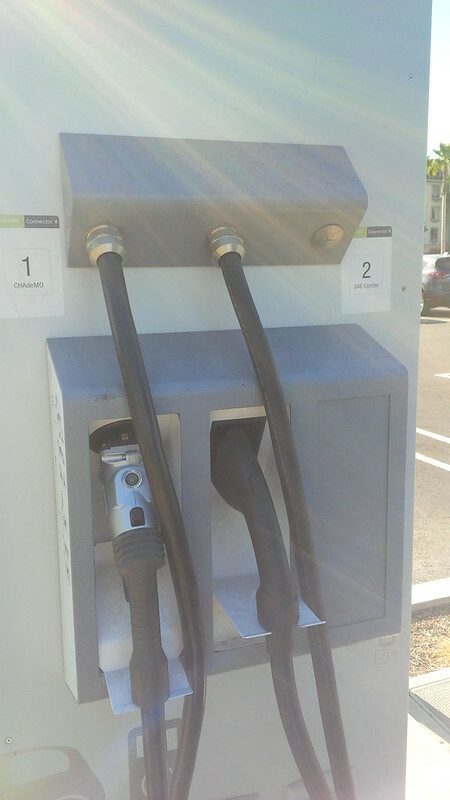 The Eaton and the Nissan CHAdeMO chargers. 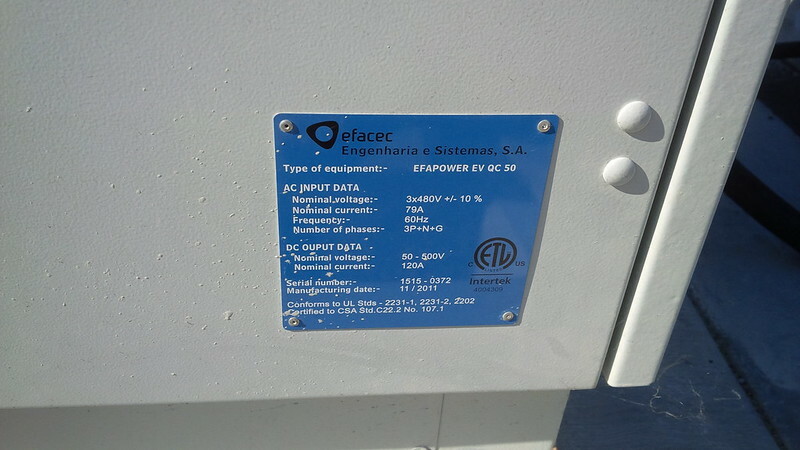 Yesterday, I found a combination CHAdeMO/CCS charger from Efacec (the Evapower EV QC 50) at the ARTIC, the Anaheim Regional Transportation Intermodal Center. 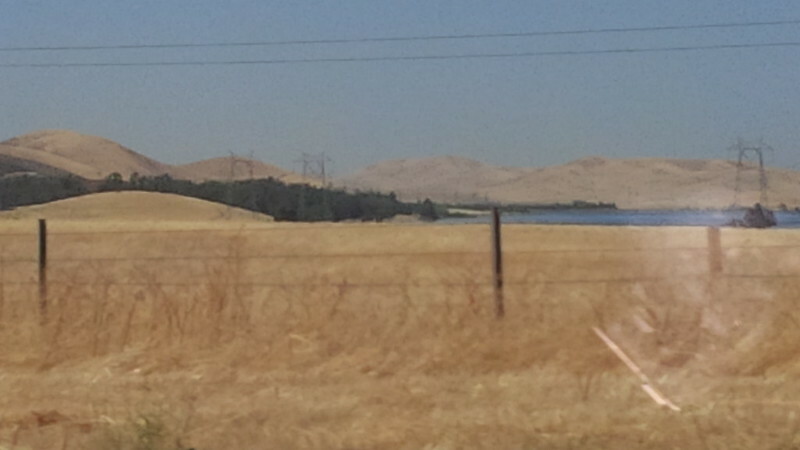 I first noticed the ARTIC from the side of the 57 freeway as I zoomed by on my way home. It is a strangely modern piece of architecture on the same exit as “the Pond” and Angel Stadium. 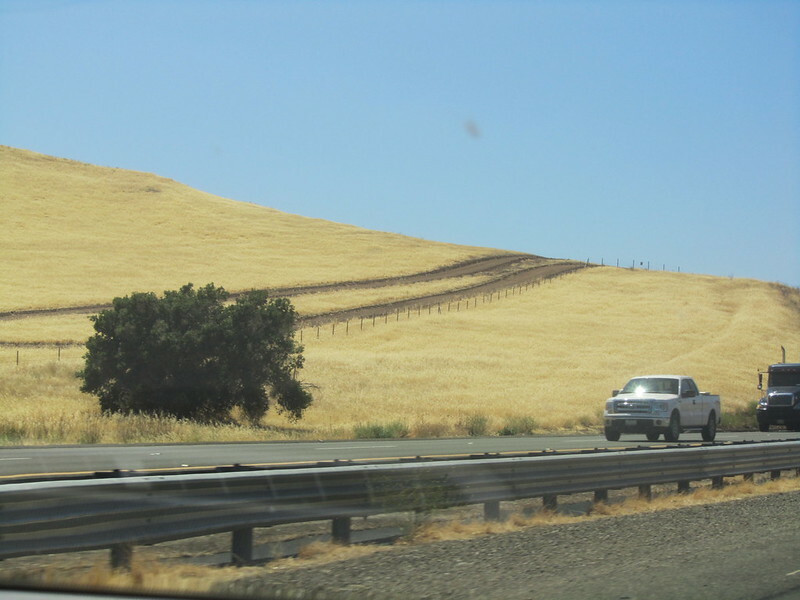 As we passed it on that first drive and on every subsequent drive since then, my wife and I often wondered what it was. It looked like a Disneyland monorail station, except Disneyland was several miles away from the sporting venues in Anaheim. 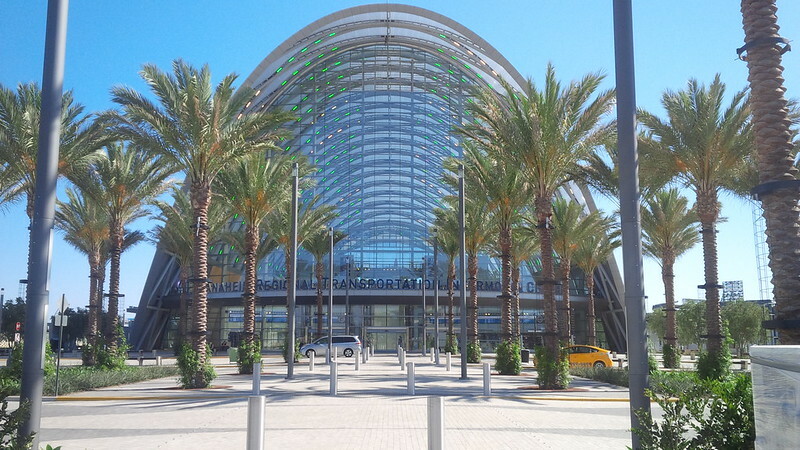 In preparing to write this update on how to charge using the equipment at this location, I ran into several links about the site that was not very positive about this $189 Million Transit hub. From OC Weekly when it first opened. To an LA Times review a week later. 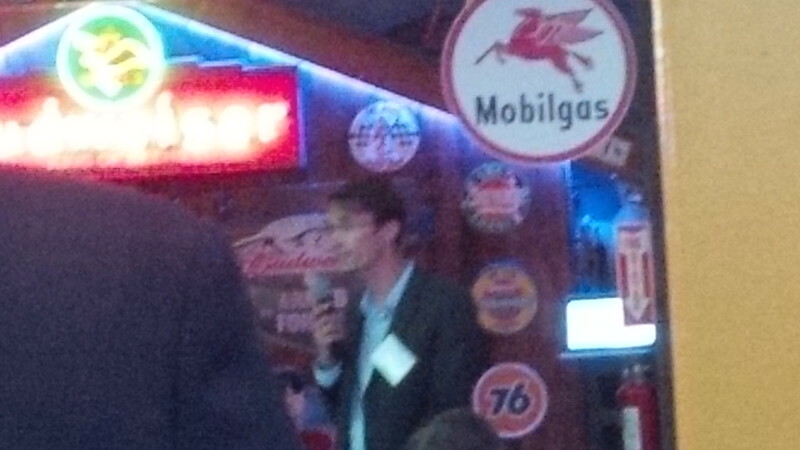 To an update on its operational challenges from the OC Register, half a year later. Regardless of what the critics may say about this location. 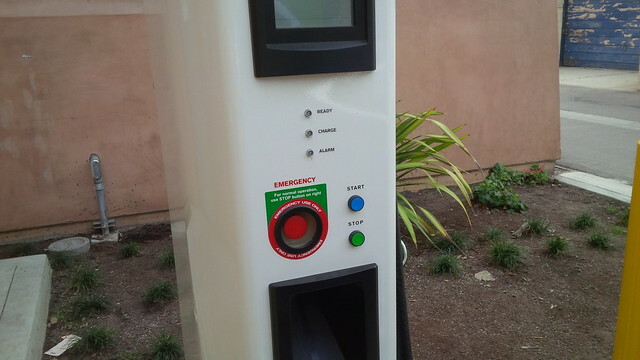 Many of what used to be free to charge CHAdeMO L3 chargers have now been converted to paid use and it is comforting to still have options that currently do not charge for the privilege to charge at higher rates of speed. 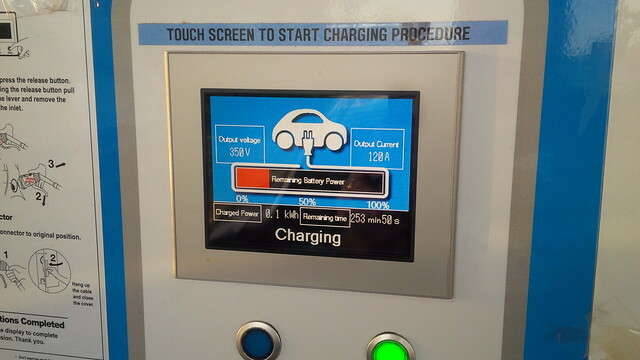 As mentioned, this particular DC Quick Charger is a combination CHAdeMO/CCS charger. What this means is that there are two different “heads” to the Quick Charger, the CHAdeMO one which the Mitsubishi iMiEV , Nissan Leaf, and the Tesla Model S (with an adapter) uses, and a CCS (AKA the “Frankenplug”.) The CCS one is what the BMW i3, Chevy Spark, and others use. The CHAdeMO is the one on the left and CCS is the one on the right. 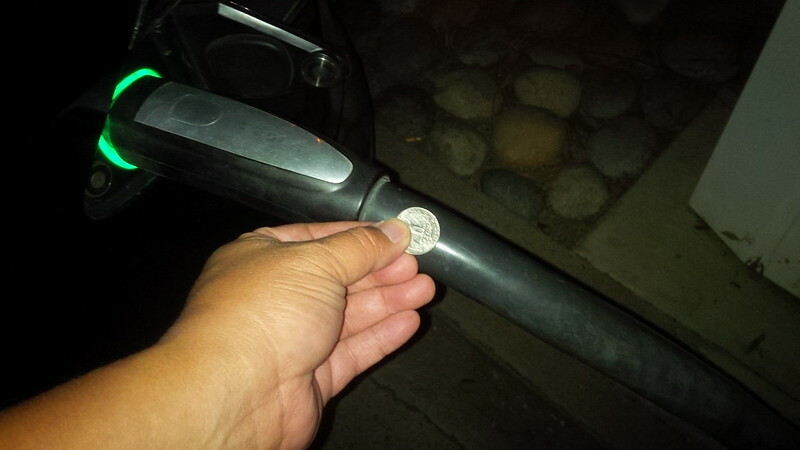 In my original post, I had yet to use a CHAdeMO that has been converted to a pay system. During our trip to Vermont, we actually used a couple of Nissan CHAdeMOs that have been converted to a pay system and require an RFID and payment to charge. 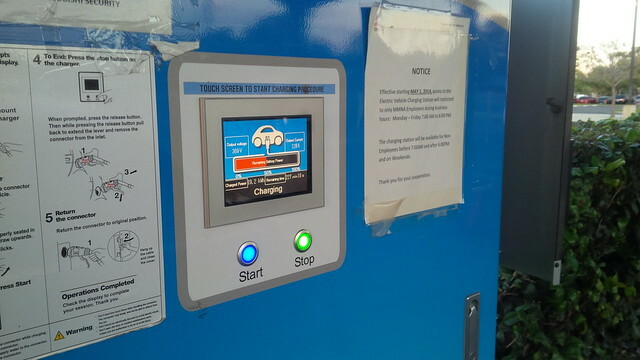 However, we lucked out when the NRG eVgo CHAdeMO was still in its introductory free period. 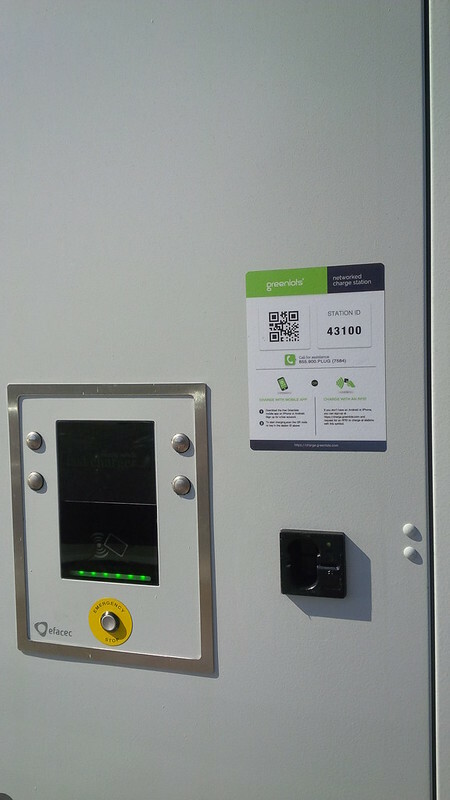 In addition to an RFID Card, the Efacec system at ARTIC also uses the Greenlots App to initiate the charging session. However, there are a few strange things about this particular location. Though there are few Greenlots locations on the map, this particular one does not show up in it. 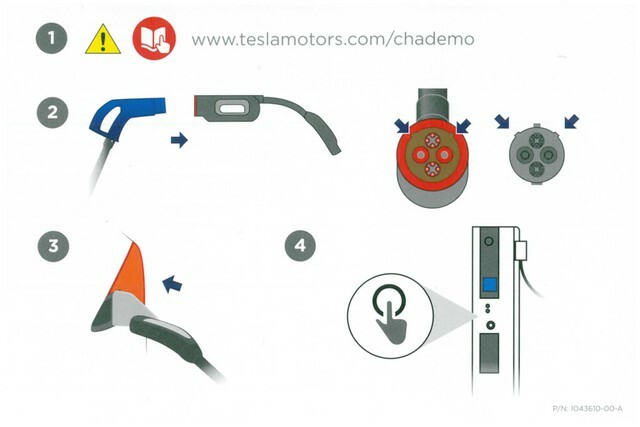 Since the system has two ports, there is a set of CHAdeMO and a set of CCS instructions. We’ll be following the CHAdeMO instructions. So, aside from downloading the App before charging at this location, I went ahead and followed most of the instructions and steps that I wrote in my original guide. We pick up at Step 5, we still need to make sure to follow Step 4 and align the notches appropriately, it won’t fit otherwise. 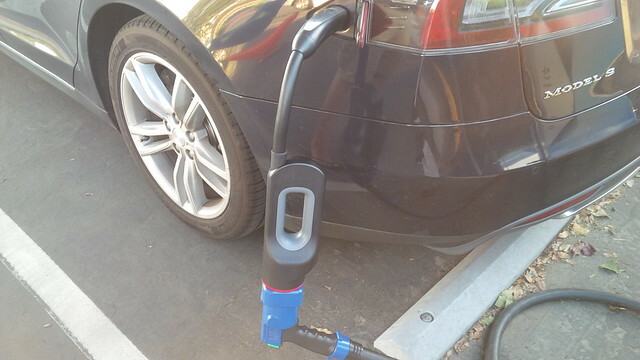 Step 5 is to mate the CHAdeMO to the CHAdeMO to Model S Adapter. So, on the Efacec L3 charger, it looks like this. 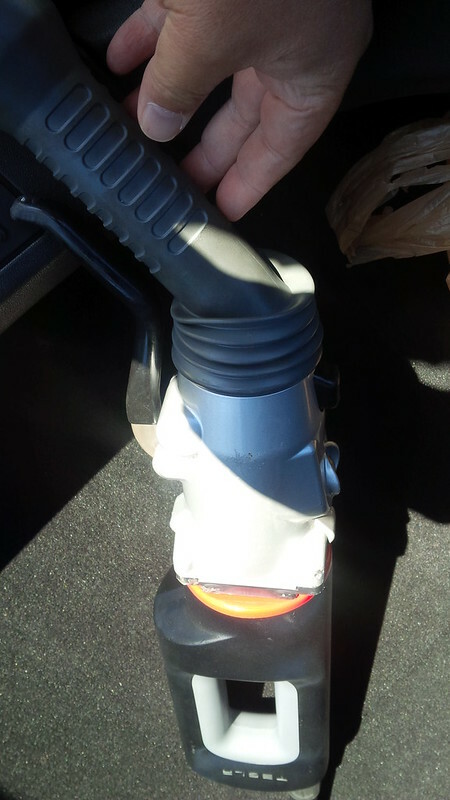 Like the Nissan CHAdeMO adapter, make sure to pull the trigger on the Efacec CHAdeMO to secure the piece to the adapter. Now, with these App initiated. It looks similar to how the Eaton sits on the Model S. I use the cable to push the Model S to CHAdeMO adapter up so that the weight is on the CHAdeMO cable rather than pulling on the Model S port. Now where we differ from the original steps come in a new Step 7. Now with this new step, all the other steps get pushed back one. Step 7 is to authenticate with the charging network. 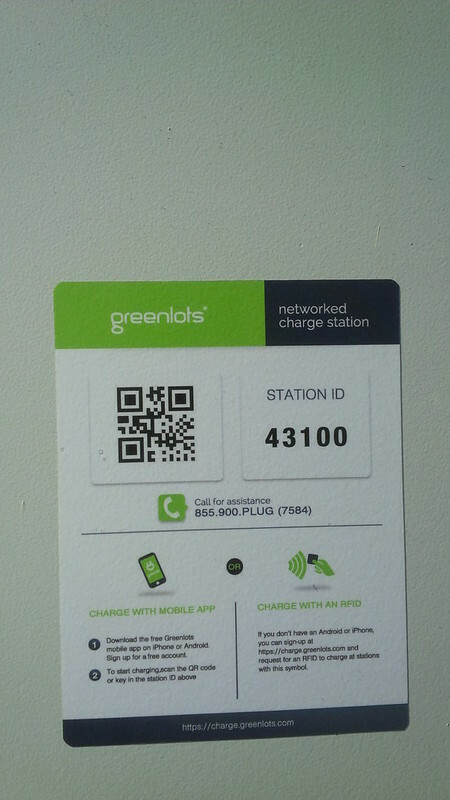 With this Greenlots App, I scanned the QR Code on the charger. If we had the RFID card, you just swipe it. Additionally, it seems that there is also a Credit Card reader built-in to the charger. However, since this location is free, I chose the QR code method. Step 8 is to start the charge. With the method I chose, the Greenlots App shows a virtual button to choose which port to initiate charge with. 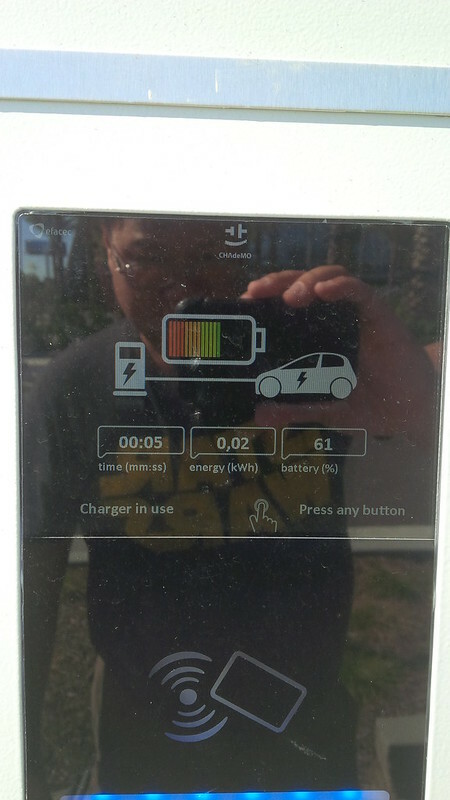 So, I started the charge for the CHAdeMO, which is on Port 1. Aside from starting it from the App, the charger still presents the user with a physical button to complete the charge initiation on the Efacec charger. The soft button on the upper right becomes a START button. Step 9 Go back to the car or go about your business, but put a note on the car if you do leave so that anyone who needs to use the charger can contact you. If you choose a note, let me recommend the EV Card from Plug In America or Jack Brown’s Take Charge and Go tags. Additionally, I would recommend checking into Plugshare so that anyone looking at the location remotely will know that someone is charging, at the moment. On the display of the charger you will notice that the battery capacity and start of charge shows up. 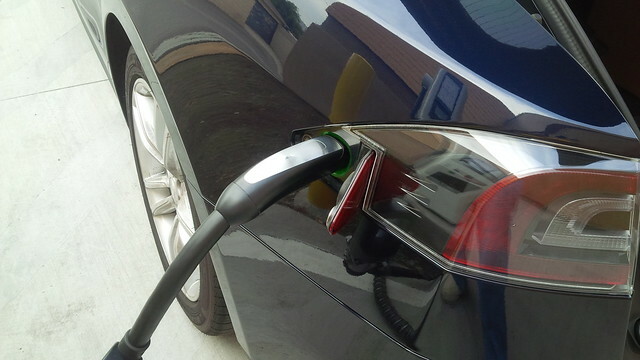 Green light on the Model S chargeport tells you that the car is charging. If you go back to the car, you will notice the charge speed of CHAdeMO. As opposed to the Eaton and Nissan chargers, the Efacec at this location was providing me with 152 to 156 miles per hour. 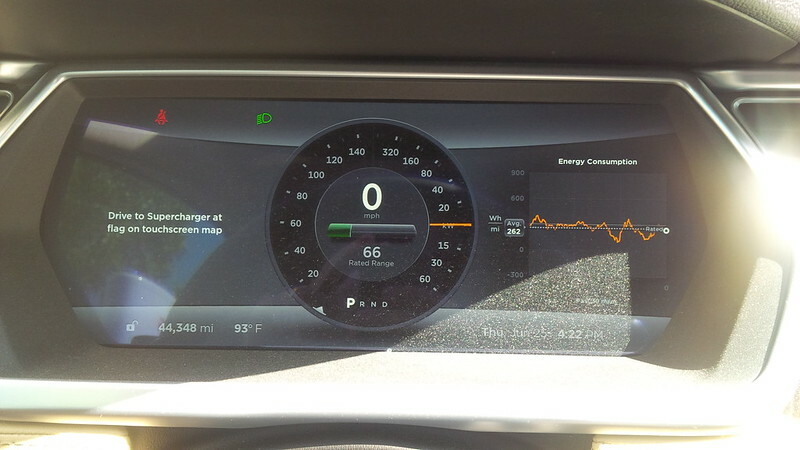 I forgot to photograph the screen on the Model S, but I did take a photograph of the charger display before it completed. There is no estimate of how long the charging will take, but it does show the elapsed time charging, the amount of energy provided to the car and the car battery’s state of charge (SOC) percentage in real time. The Greenlots app does a funny thing somewhere around the 30 minute mark, the app does not provide the status of the current charging session. Before the 30 minute mark, it actually provides a snapshot of the charging session that is anywhere from most current status to as dated as a few minutes (it batch updates). When it does provide this status, I believe that I saw it provide for a method to STOP charging from their app. However, after the 30 minute mark, the session disappears from the app. In order to stop the charging session, one needs to press any of the buttons on the charger directly. Since no one was waiting, and I was just hanging out at the car, I figured to get it close to full. When I press one of the buttons and the stop is displayed, the screen goes from black to white. I figured to wait until I got to 47 minutes of charging. Then press the Stop button (the upper left soft-key). If you press that button the screen updates itself, first with the following “Ending Process message”. Then the charge ended by user message. Since I registered for an account, I actually receive an email and text message with the charging sessions statistics, cost, kWh, and time at charger. Your vehicle has stopped charging at 43100, ARTIC. You have used 29.61 kWh for 0 hour(s) 47 minute(s). Step 11 Detach the Adapter from the charger’s CHAdeMO cable. 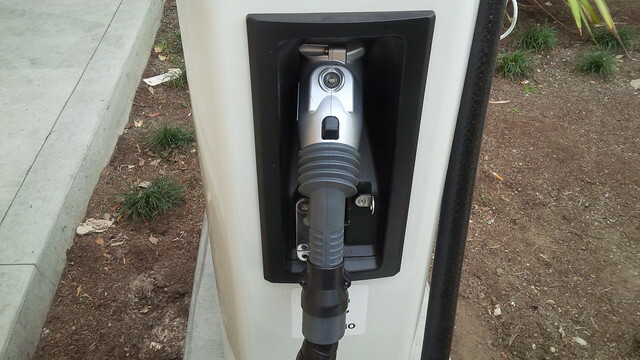 The Efacec CHAdeMO is similar to the Nissan charger in that there is a button on top to detach it from the Model S cable. Step 12 Return the cable back to its proper location. 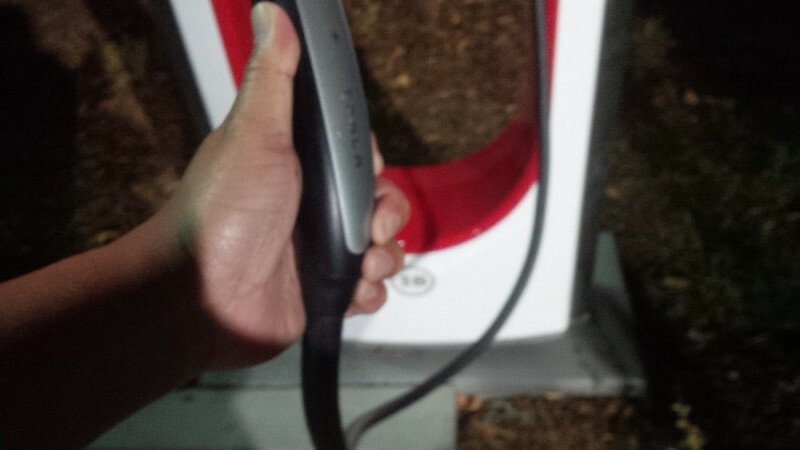 Step 13 Return your CHAdeMO to Model S Adapter back to your car and drive off. 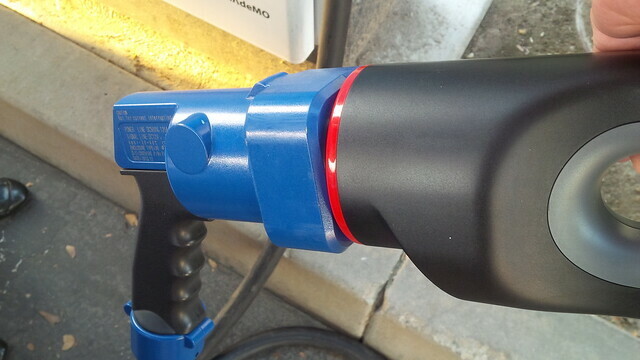 If you’re interested in more pictures of the CHAdeMO to Model S Adapter, here’s my flickr stream. 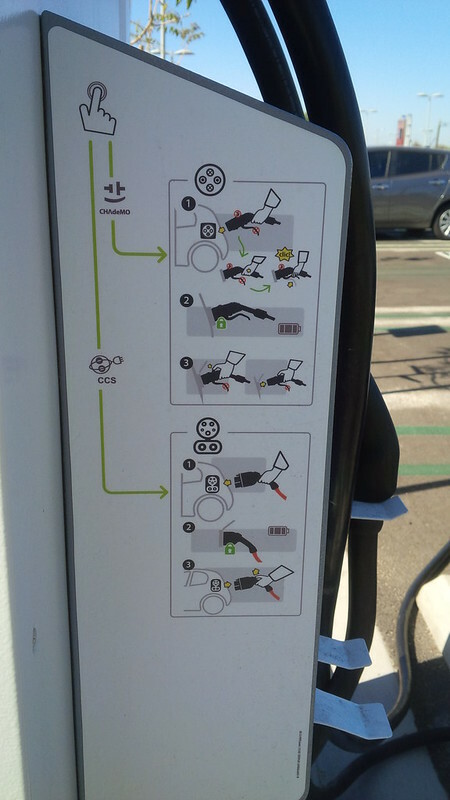 And if you’re looking for the instructions of the same things on a Nissan or Eaton Charger, here is the link to the original instructional post for using CHAdeMO that I wrote a few months back. We started our trip on Thursday morning after an overnight charge in our garage. 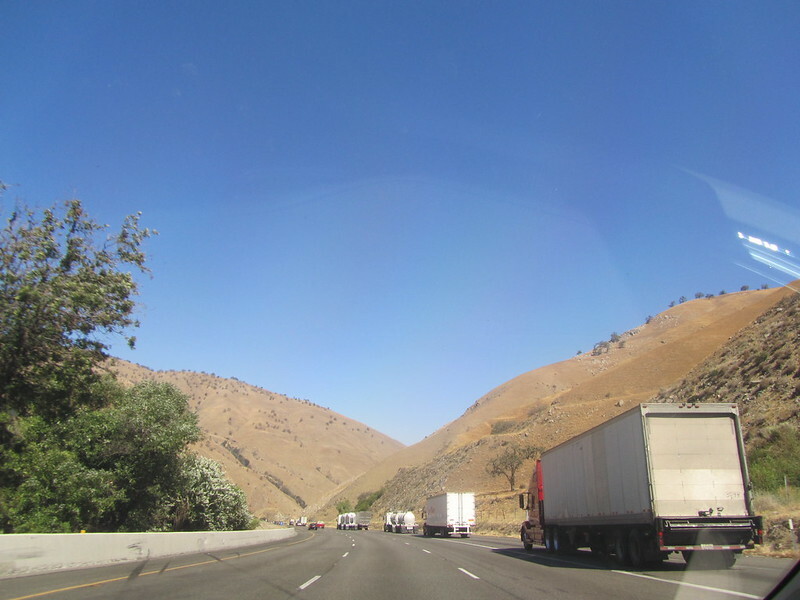 Figuring to head to the Bay Area using the I-5 route means driving through the Grapevine and since I haven’t driven that route in years, I didn’t remember if the climb was both ways or if it was just one way, so we range charged. 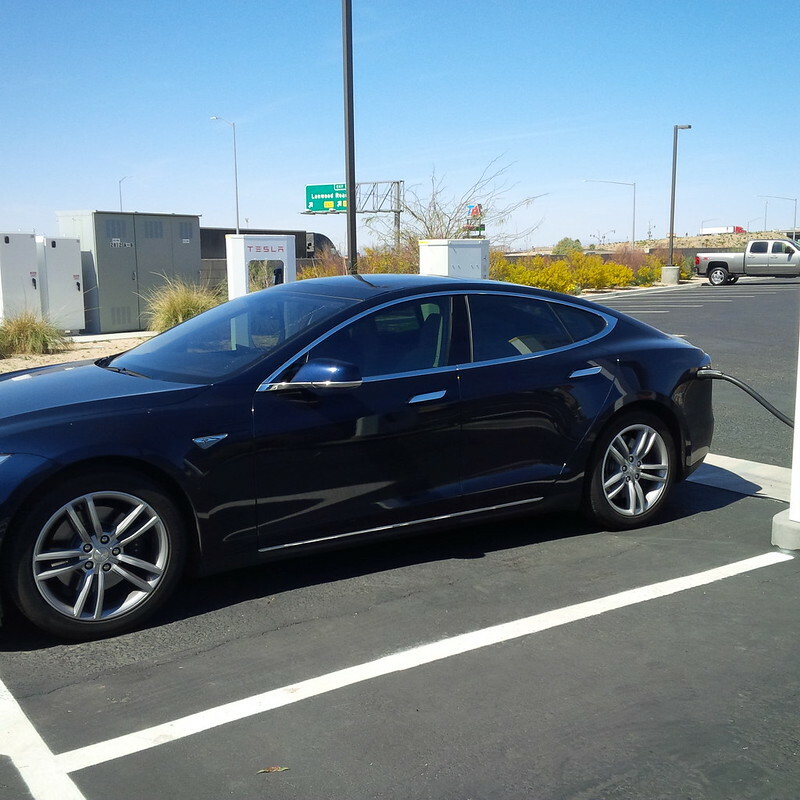 One question that is often asked by folks waiting for delivery of their Model S is whether to purchase the HPWC and dual chargers. 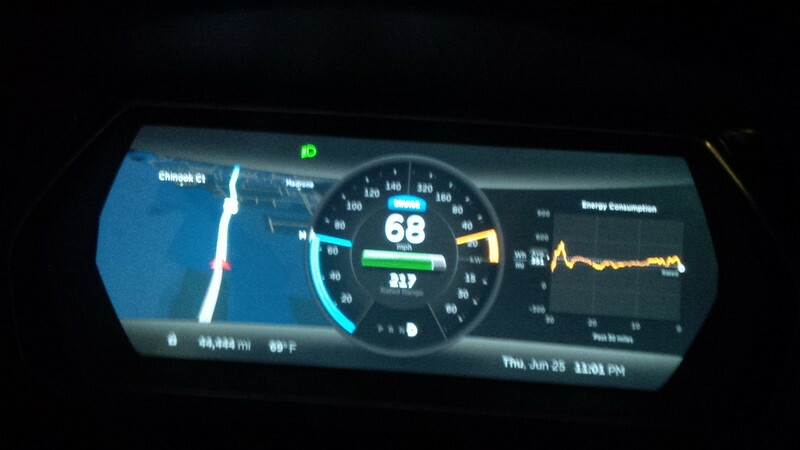 As you can see below, the Model S was drawing 20 miles per hour on 30A. At the time we were faced with that decision the HPWC was over $1000 (was it $1500? I don’t remember) for the device alone. Additionally, because our garage is the furthest point from our Main Electrical Panel, a 100A circuit was prohibitively expensive. 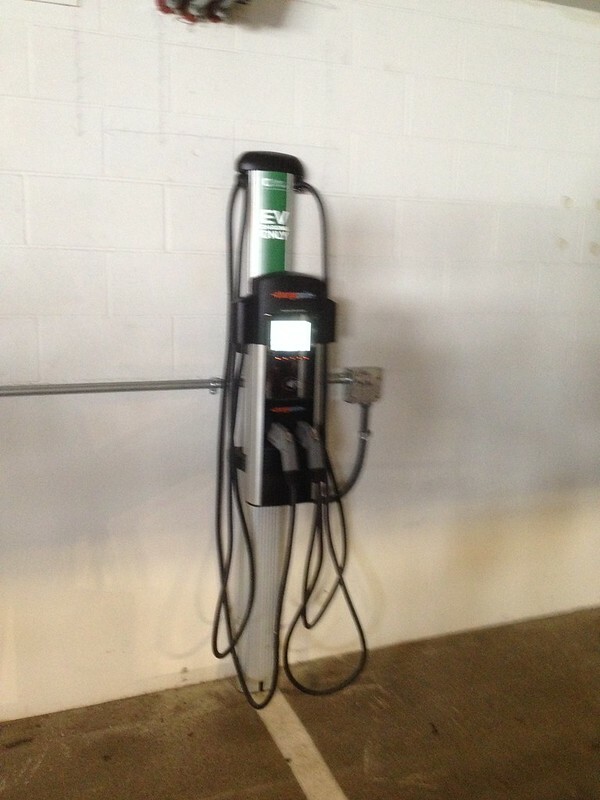 So, we opted to use an existing Chargepoint EVSE that I had installed for the Active E. We opted to install 2 NEMA 14-50s and a NEMA 6-50 throughout the garage and outside to accomodate up to 4 EVs charging at the same time. 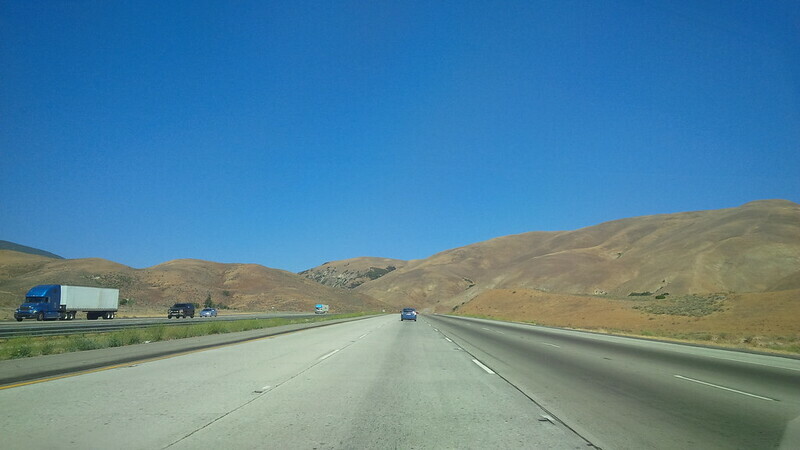 We rolled out of the garage just a tad under “full” but with enough range to tackle the drive from home to Tejon Ranch. Moving the car out of the garage requires a bit of a maneuver and takes a lot of going back and forth. One of the challenges of leaving Southern California during the rush hour is the amount of time spent in traffic. 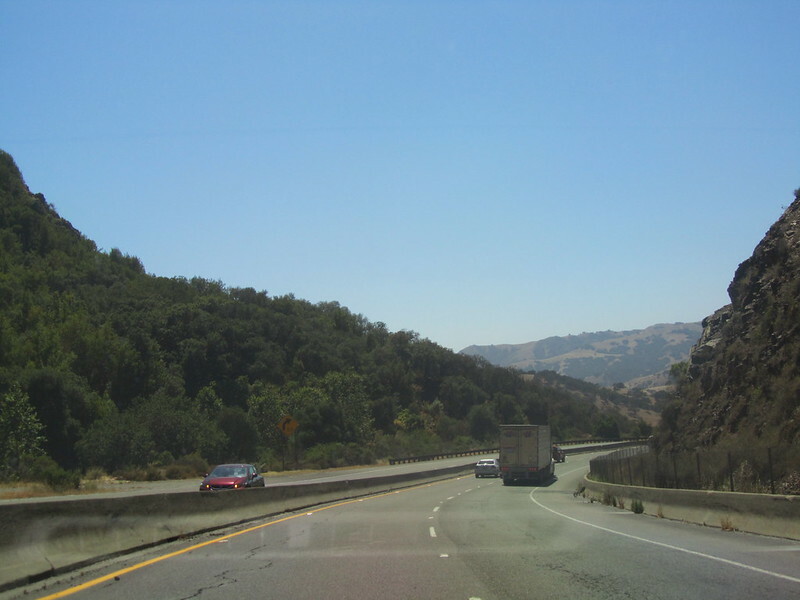 The navigation does an adequate job of routing us through traffic, but it doesn’t calculate “potential frustration” with certain routes and though I-5 is the most direct route to Tejon Ranch, we opted to go I-605 to I-210 (less immediate traffic) and more. Note the estimate below of a 10:31 AM arrival to the destination through the original route. 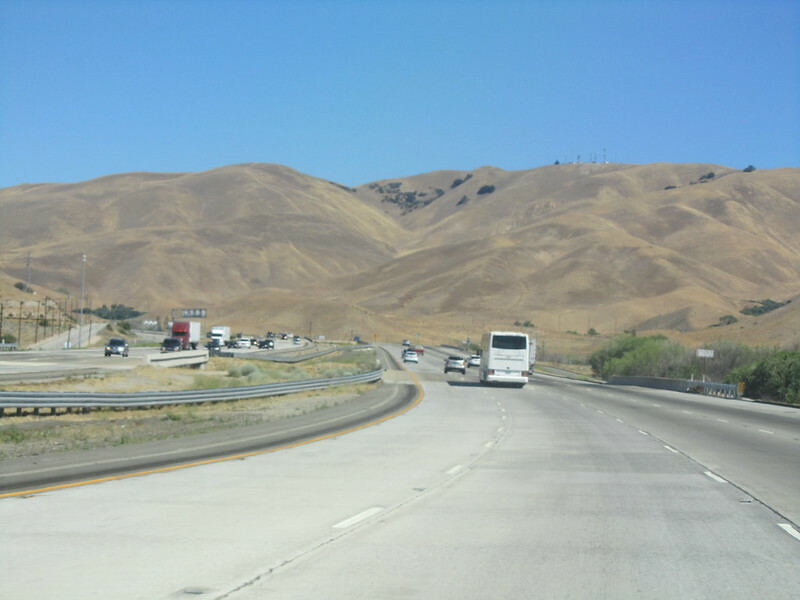 The other benefit of the longer route that we took was access to the HOV (High Occupancy Vehicle or carpool) lanes. 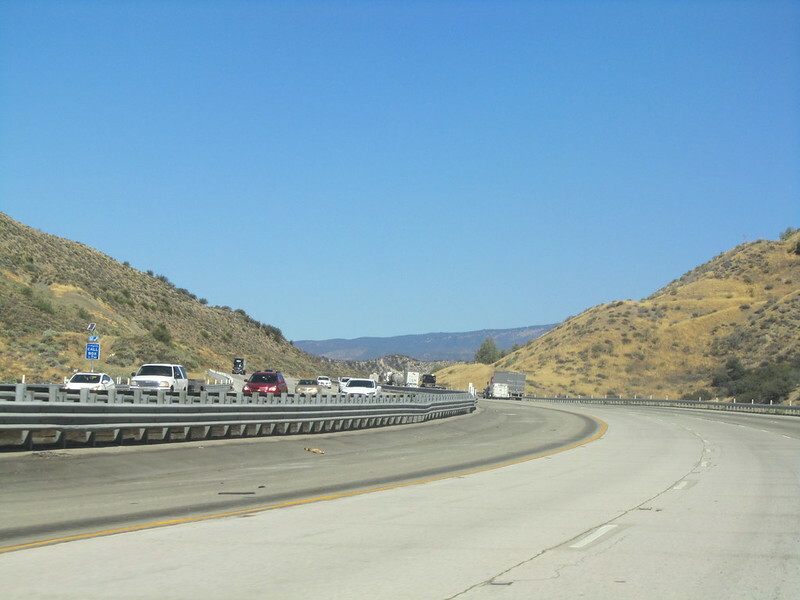 In some parts these lanes can be as congested as other lanes, whereas in many they are still beneficial for drivers. In many of the routes, an HOV only requires two passengers or an HOV eligible vehicle with a sticker (such as an EV, PHEV, Hydrogen, or CNG.) Though I have some opinions on PHEV eligibility, unfortunately the legislature is fairly lenient about that. 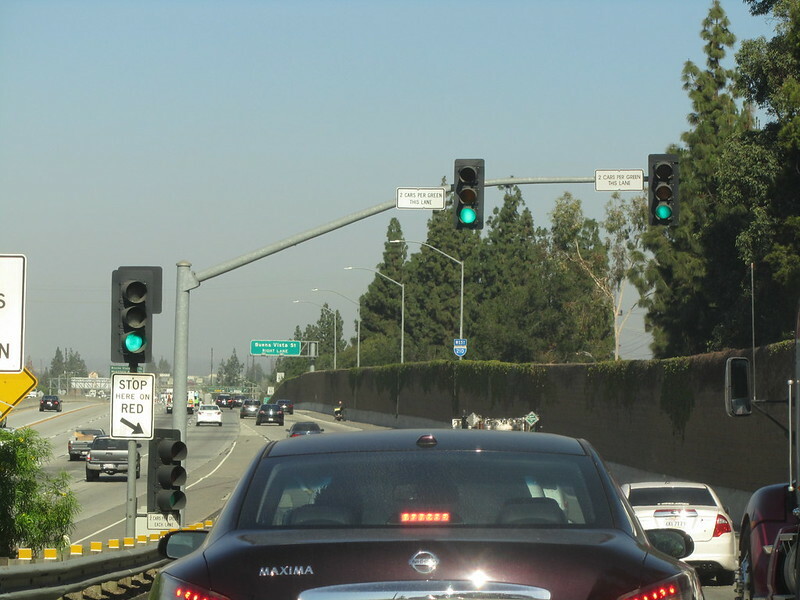 Visitors to Southern California freeways might get confused by the on ramp stoplights. 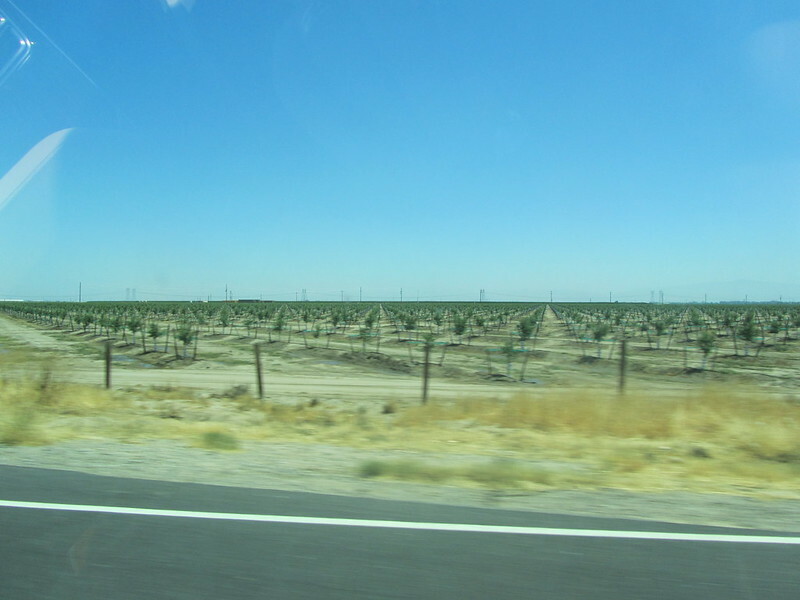 One of my close friends, who is British and was visiting from England, was pulled over when he just passed through one of these many years ago. 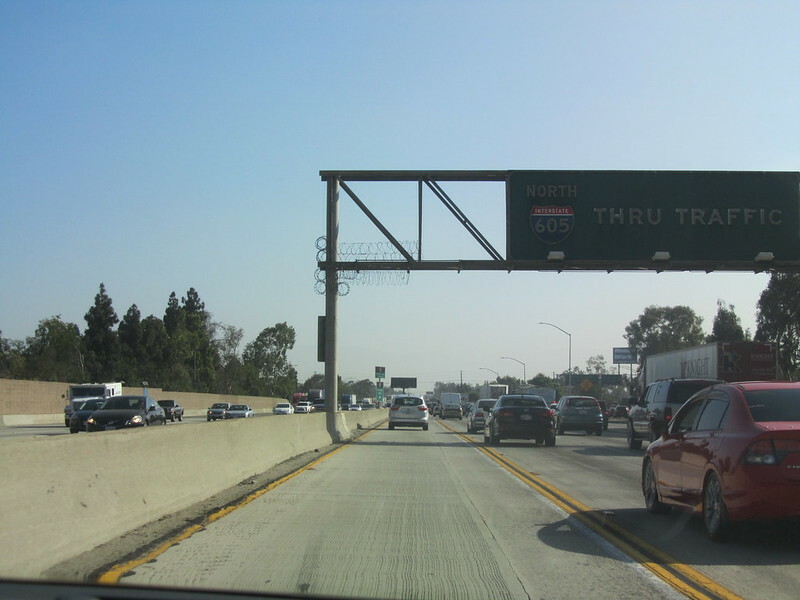 The one in the photograph is between I-605 and I-210 and requires all lanes to stop and proceed with 2 cars per green. 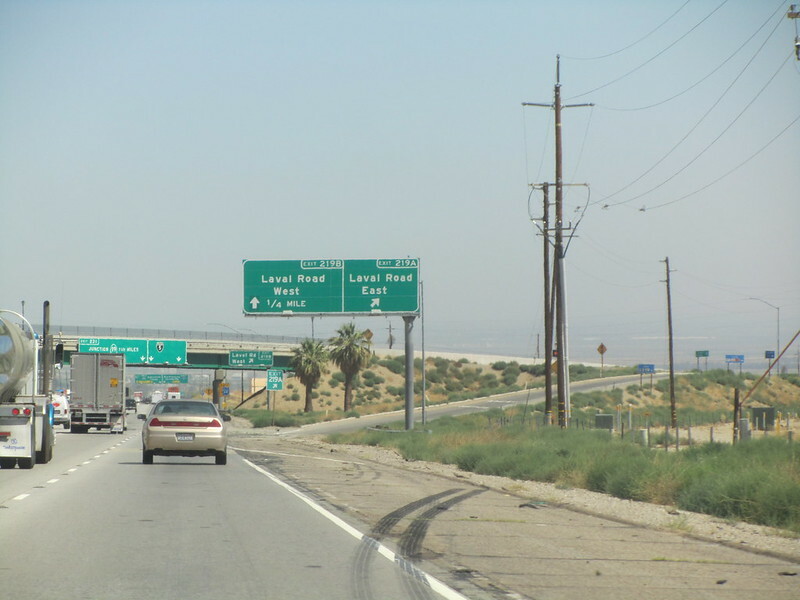 There are many on ramps in the Los Angeles area that actually only uses the on ramp stoplight for one of the lanes, the other lane is an HOV lane and does not use the stoplight. This is not the case in the one below. 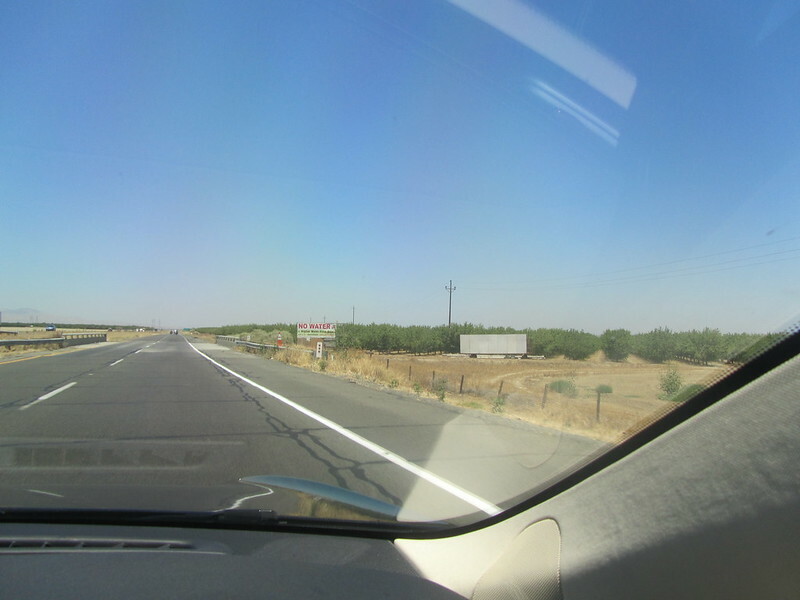 As we were driving along, I noticed that we passed 44,000 miles early on this drive, 44,008 miles. 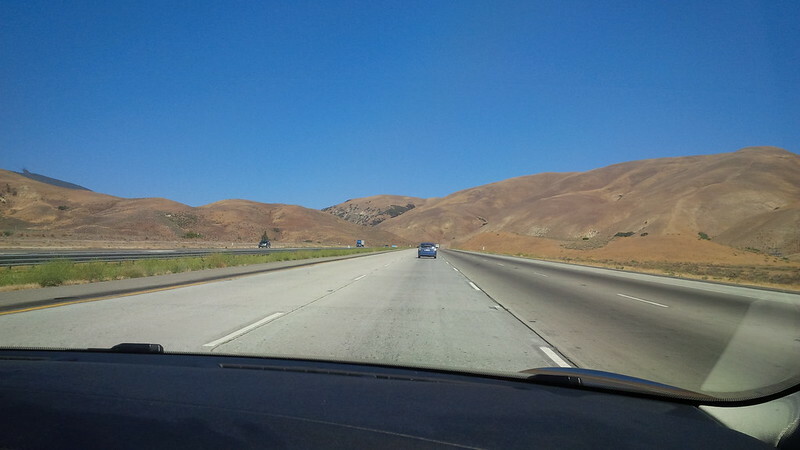 And we are thankfully out of SoCal traffic. The folks going the other direction, however, are heading into it. 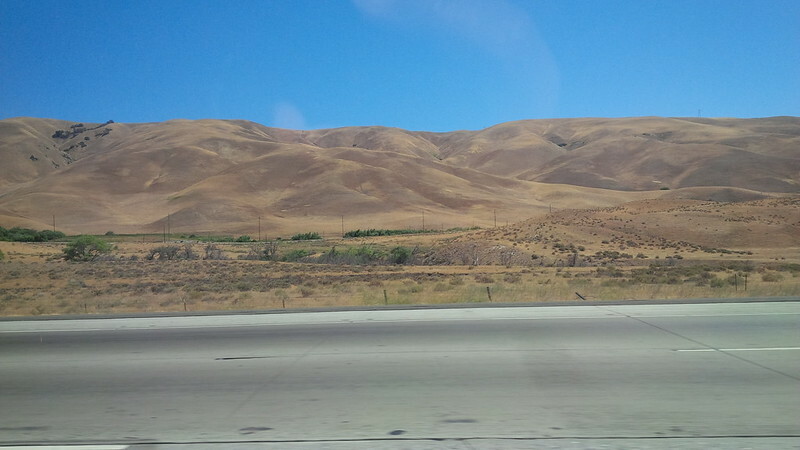 There is a reason that California is called the Golden State. 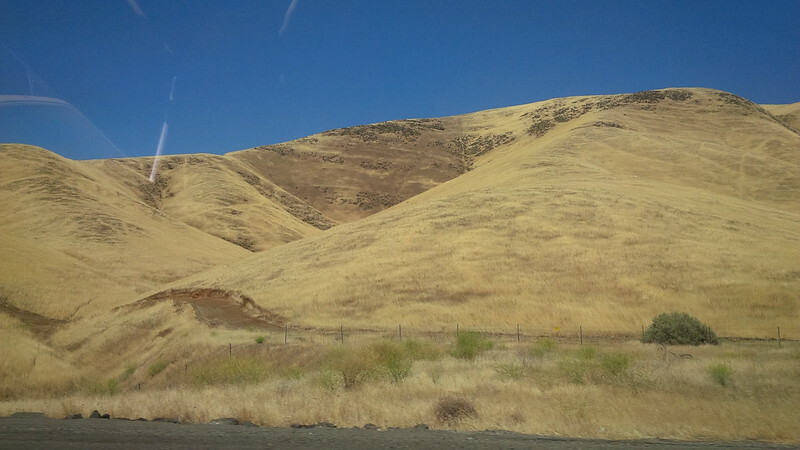 And part of me wonders if that’s more because of the Golden Brown that the hills take rather than the “Gold Rush” of the 1800s. In the Winter, this route can be closed to traffic when it snows. Which happens occasionally. But, we’re in a drought and it’s Summer, so, that’s not a worry. Ooh a water tower. 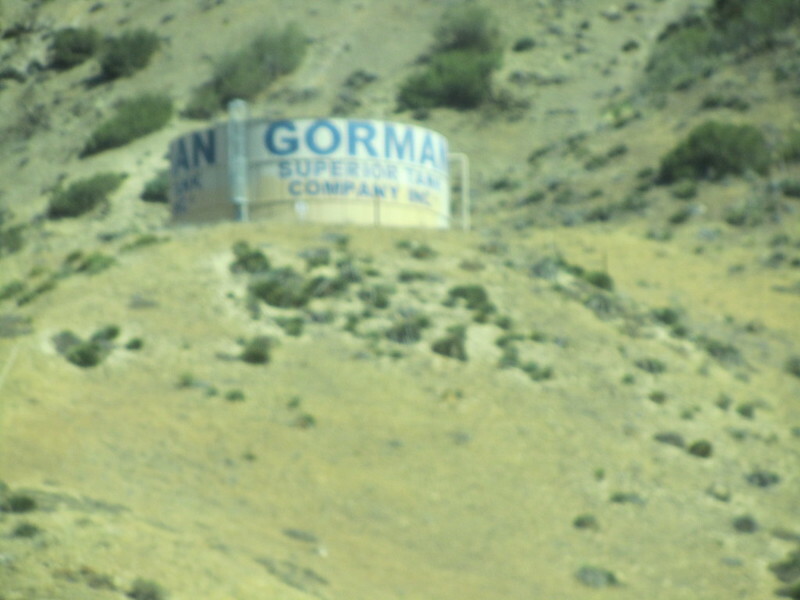 We have to build them lower to the ground in “earthquake country.” I do wonder how much water Gorman actually has in that water tower, we’re in the fourth year of the drought, after all. 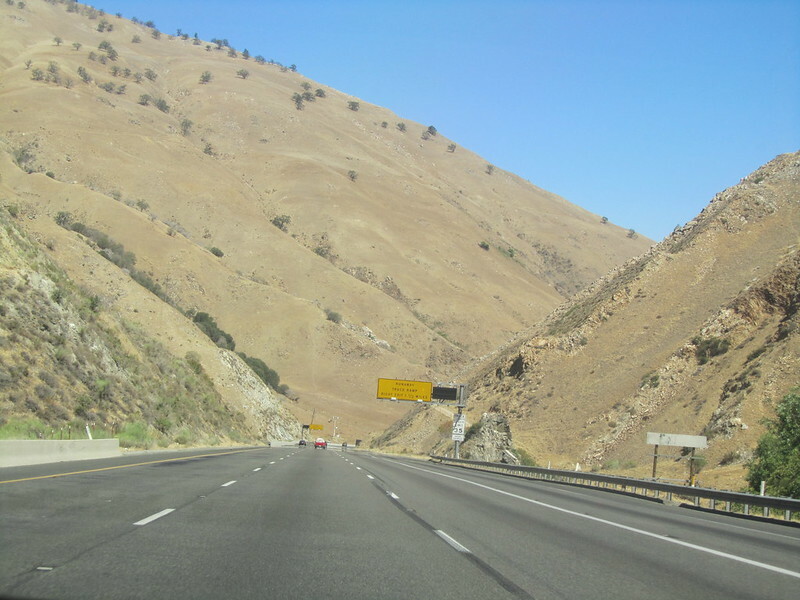 Apparently, the Grapevine drive is downhill when heading North. So, I guess we’ll have to pay attention to what we charge on the way back for that climb. Peering West from the car during the descent we capture this view with our camera. The landscape scene is quite stunning and in looking at the picture now, we wonder whether we can pass it off as a painting. 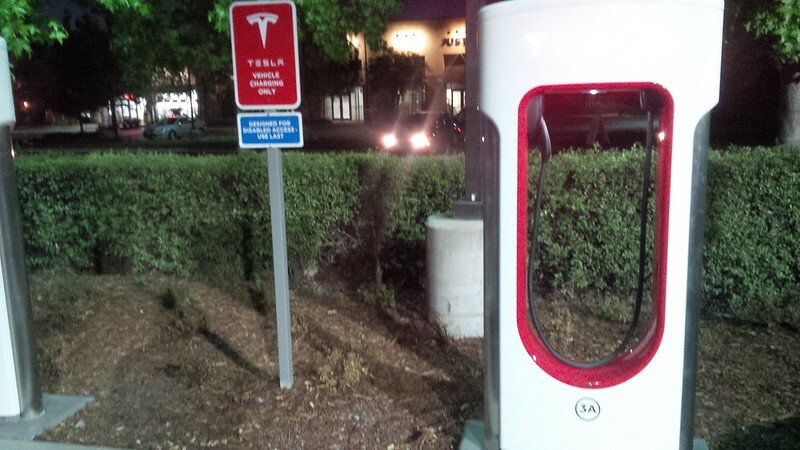 The exit for the Tejon Ranch Supercharger is ahead, away from the outlet mall on the East Side of the road. Take the West exit from the Northbound 5. 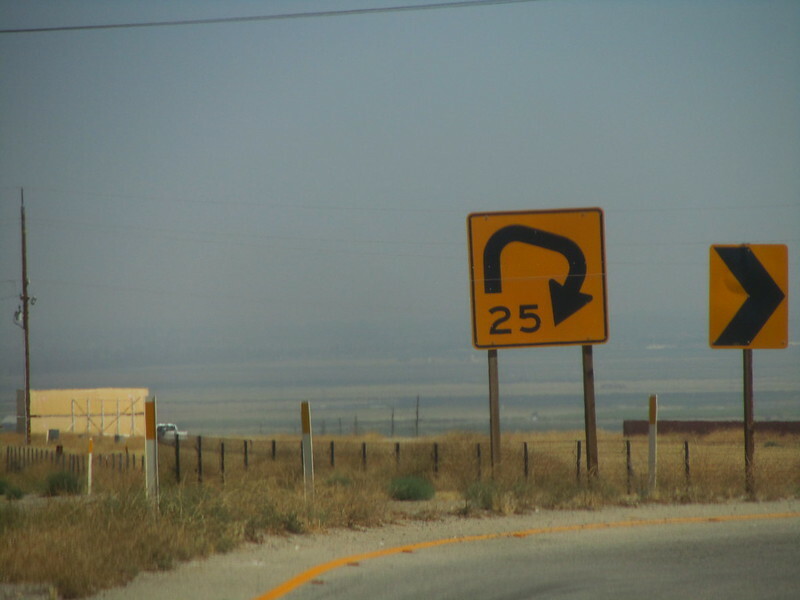 Believe the sign, that’s one weird curve coming up. There looks to be two Starbucks in this exit, one East (probably in the mall) and one West, a free standing one with a drive through. We opted for the one up the street from the superchargers on the East side. We futilely waited in the drive through, but the line was just too long (wasted 20 minutes and gave up.) I figured that we would probably see another one on the I-5 drive. We would have actually beat the original estimate to arrive at the charger by at least five minutes had we not decided to waste time at the Starbucks line. 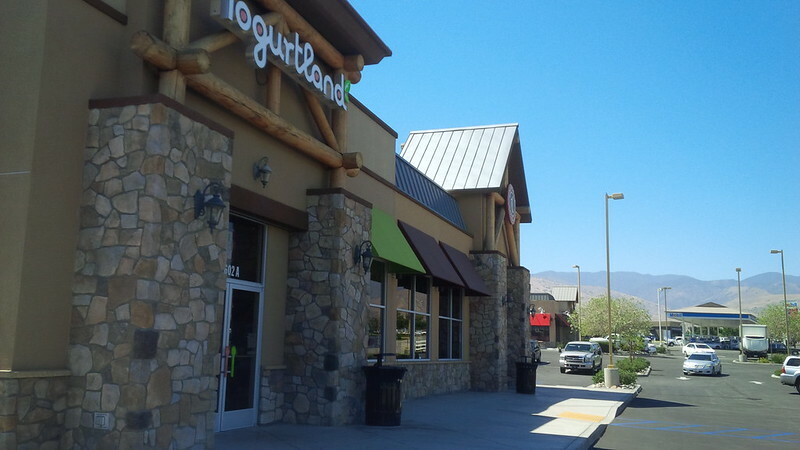 Sharing the same parking lot as the chargers is a Yogurtland and Chipotle. I went to see about using their “facilities” the Yogurtland doesn’t open until 11:00 am, but the Chipotle was open. These guys in the pickup truck did ICE the SC, but only for a few minutes. They were so excited to see us charging and had questions that he drove right up, jumped out and started to fire away. We had a good conversation and they drove off soon after we were done talking. 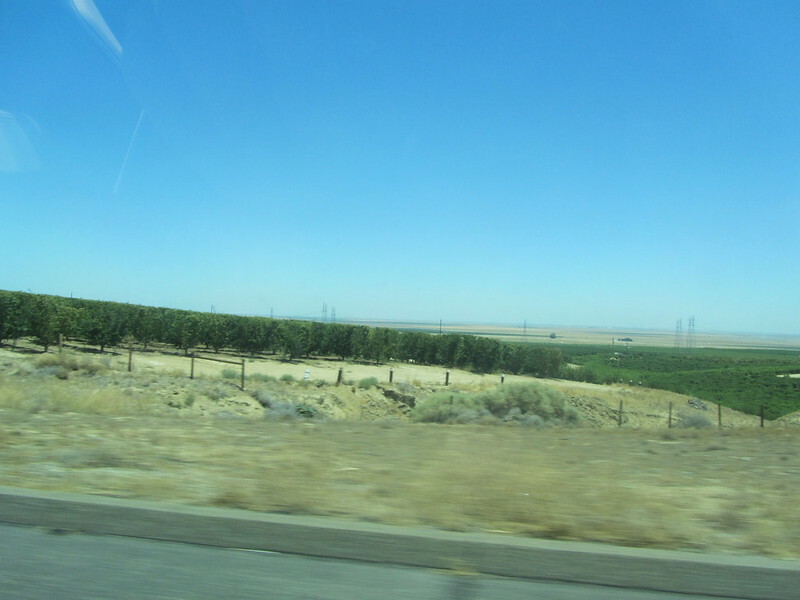 On the next leg of the drive to Harris Ranch, we swapped drivers, so it was my turn to take pictures of the view outside. 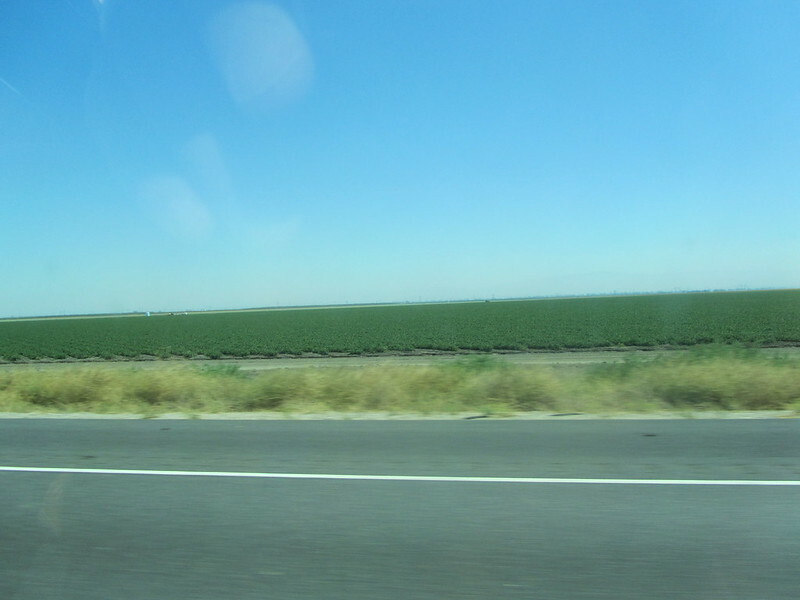 It’s amazing what farmers in the Central Valley are able to grow in such an arid place. Not really sure what they’re planting and my wife and I spent the time guessing what they are. 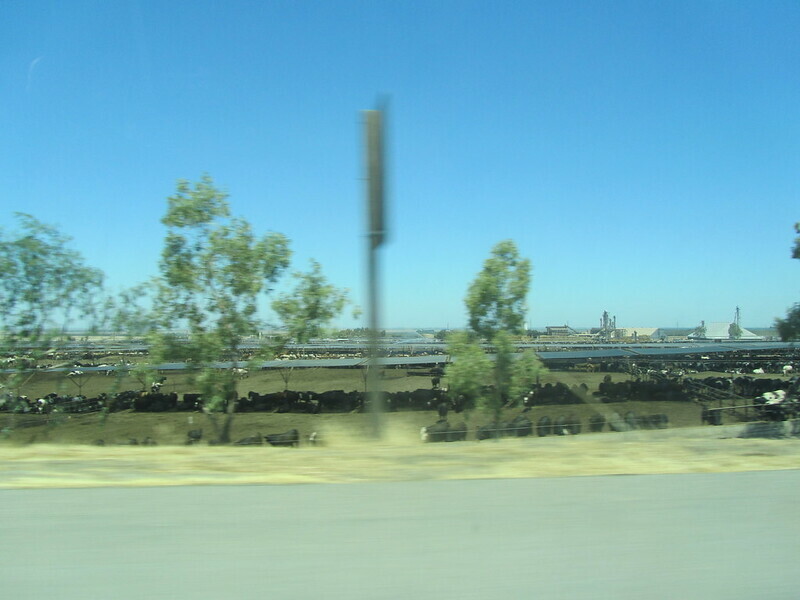 The cows that we saw on this drive were all penned up and had shade that were installed over them. They were carport like structures. Since I wasn’t driving, I took the opportunity to play with Periscope and Twitter again. The first attempt at Periscope was about a minute. The second video was a little longer, I didn’t get to archive the questions that folks were asking on the drive. Is that Corn being planted outside of our window? 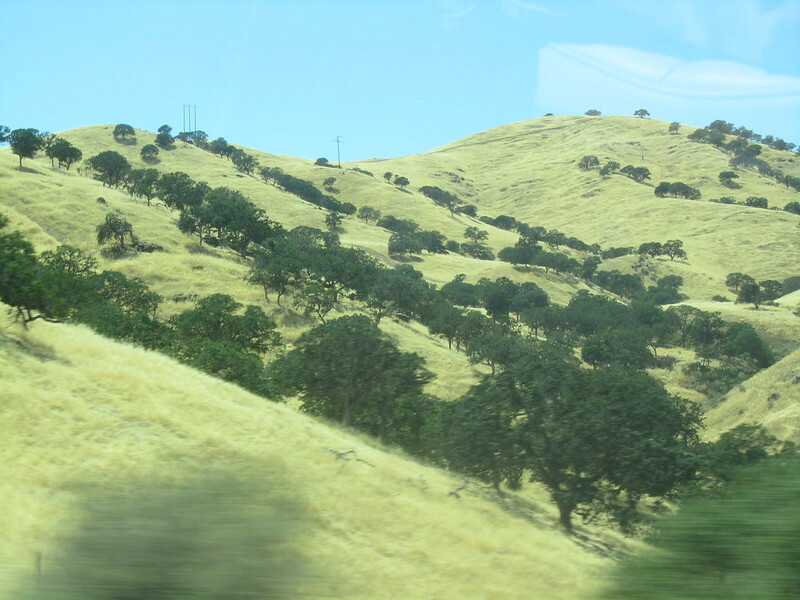 I wonder what those trees are? I was guessing almonds for some reason. I’m not really very attuned to farms and such. 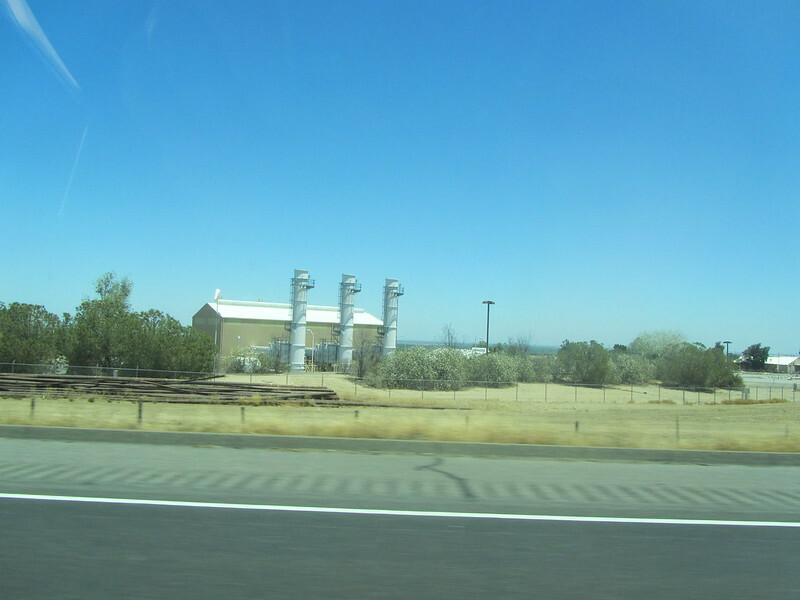 We passed some kind of processing plant, I was guessing for the trees that we just passed. 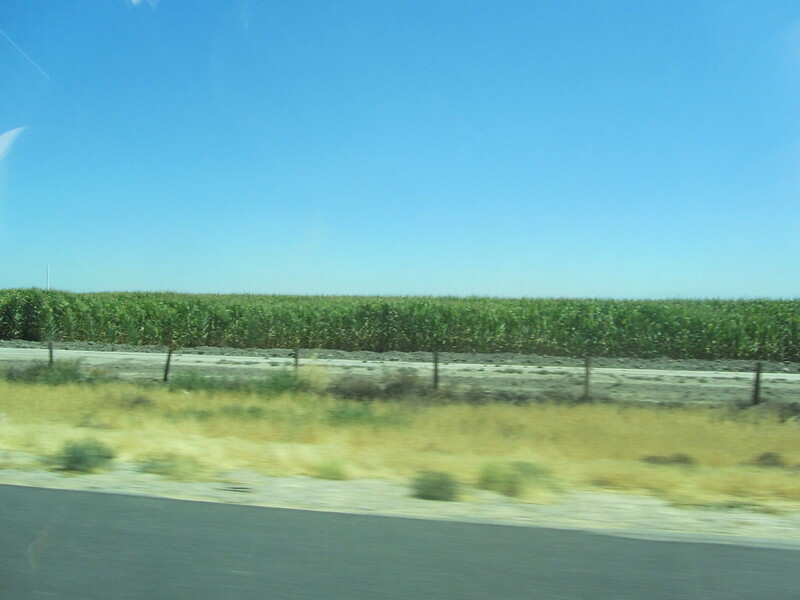 It would seem that farming in California is a lot of water politics. 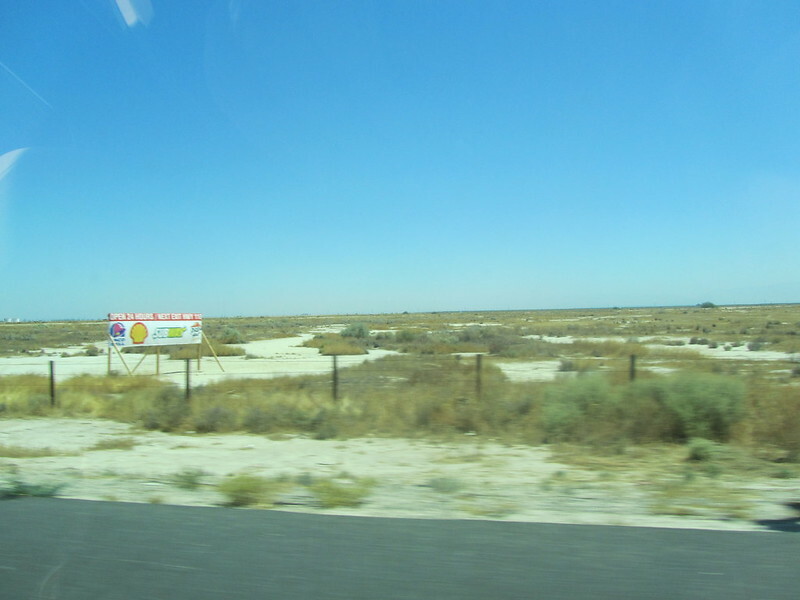 I can’t verify it, but I think these signs have been around before the current drought. 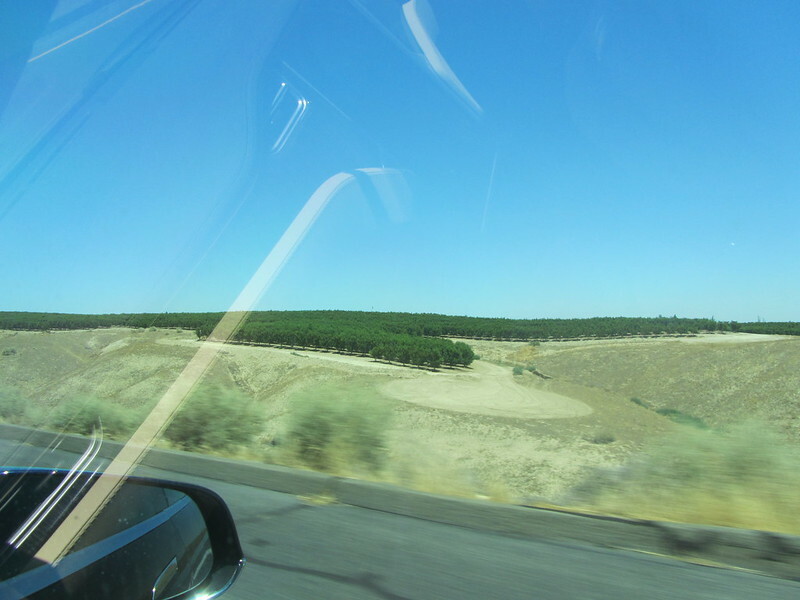 I swear that these were here the last time I did this drive on I-5, which is longer than the current drought. I really wonder how old those signs are. 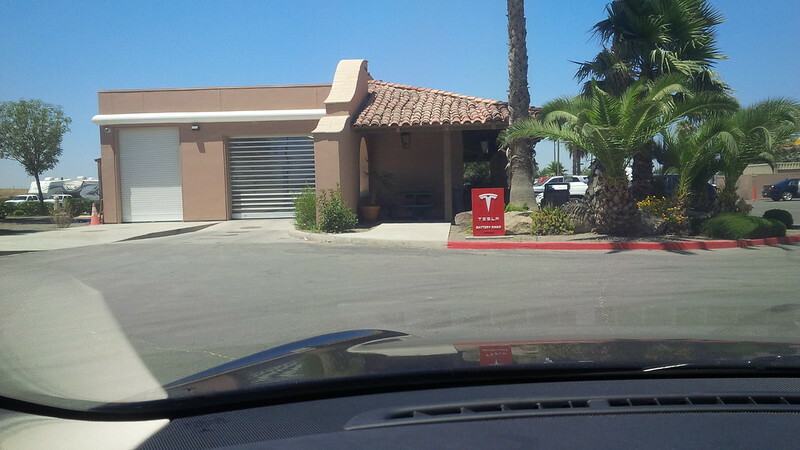 And just like that we’re at the Harris Ranch Supercharger. 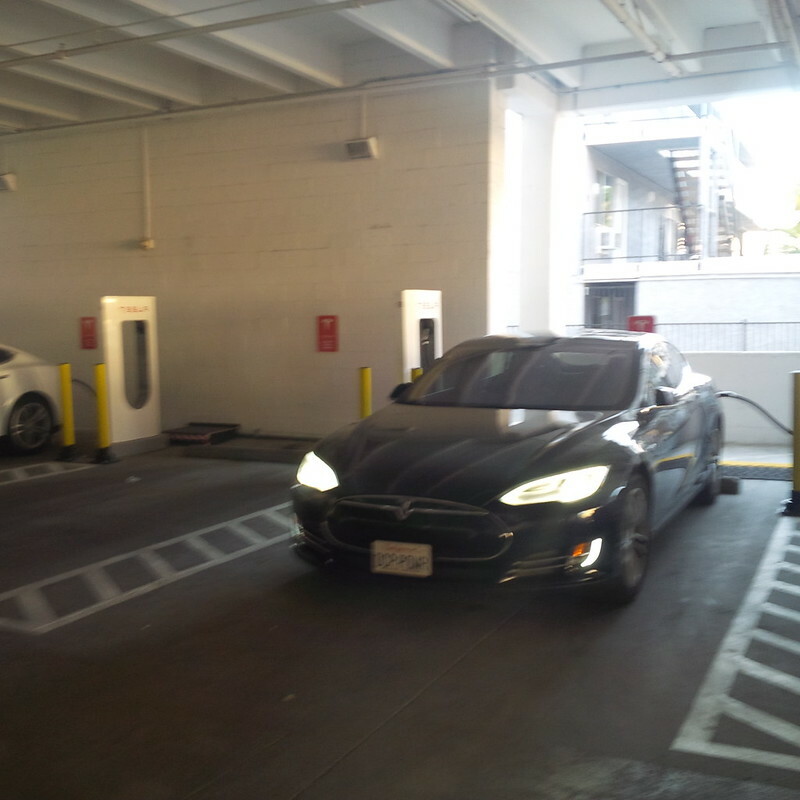 There were already two other Model S parked and charging when we got there. 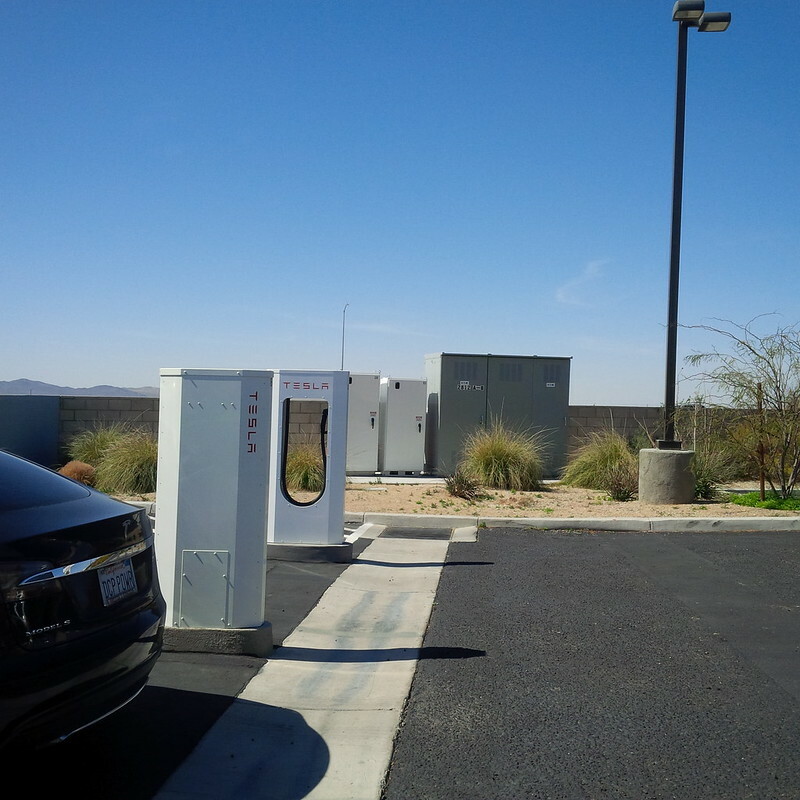 Luckily there are six stalls and we took one of the ones that was not paired with either of the other two Model S.
Each Model S at the Harris Ranch Supercharger was charging at one of the pairs. 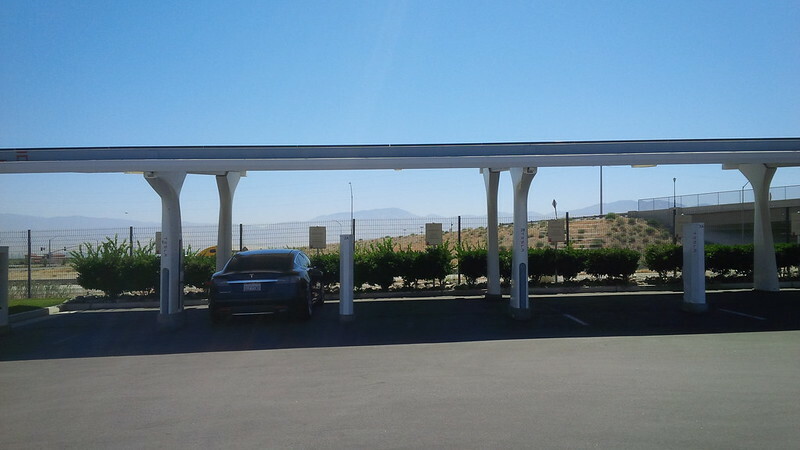 Reading the notes on this location, apparently we were very lucky because these stalls are often full of other Model S with many waiting for a charge. The view in front of the superchargers is a restaurant that we ended up skipping. 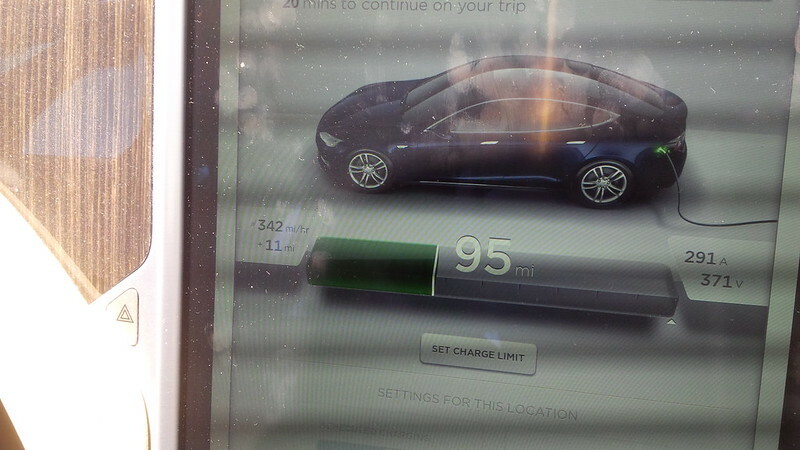 We were getting quite a fast charge at the location. 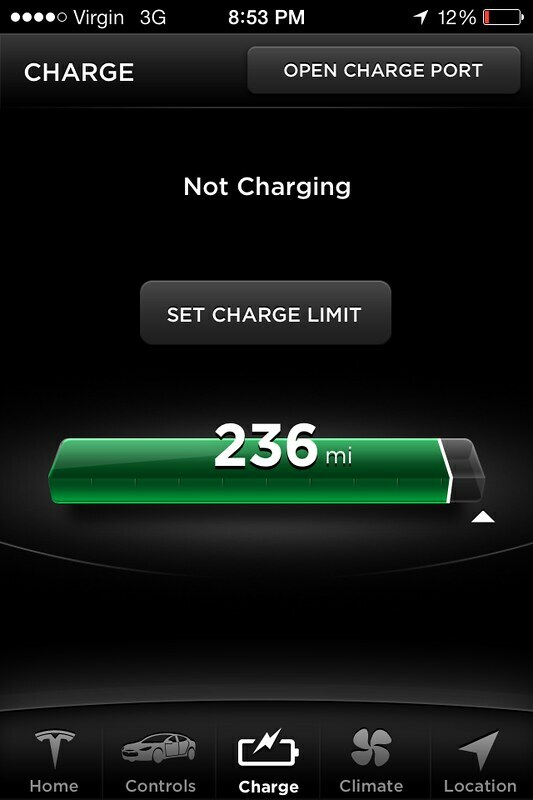 When one doesn’t have to share the feed with another Model S, the speed of charge is even greater than when it is split. 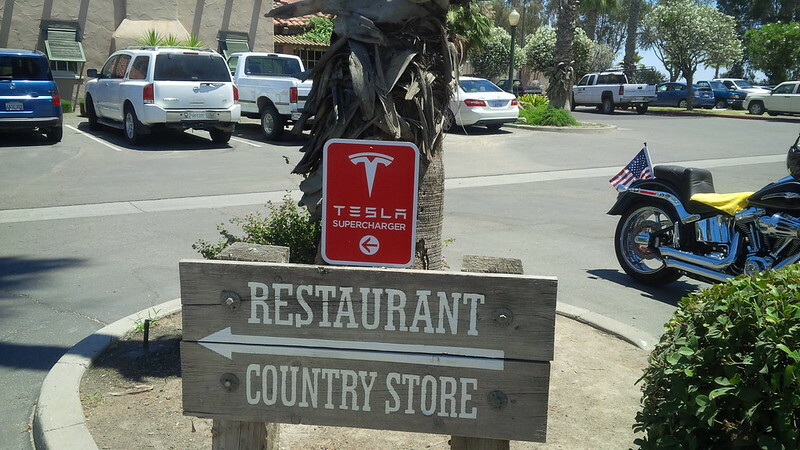 Harris Ranch is also the site of the Tesla Battery Swap Station. I tried contacting the station to see if we can get an invite to use it early. At $80 for the roundtrip, it’s not cheap, but it will also help save time for a very boring stop in Harris Ranch. Unfortunately I was told that there was no way to get an invite early and that I would just have to wait. So, I took pictures of the signage for the swap station instead. 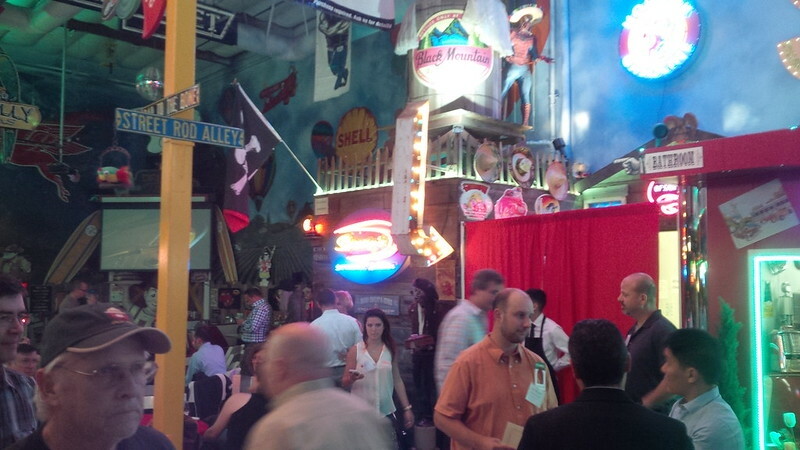 Here’s a picture of the entrance or is it the exit of the Swap station. We enviously took a picture and drove off. Maybe next time. 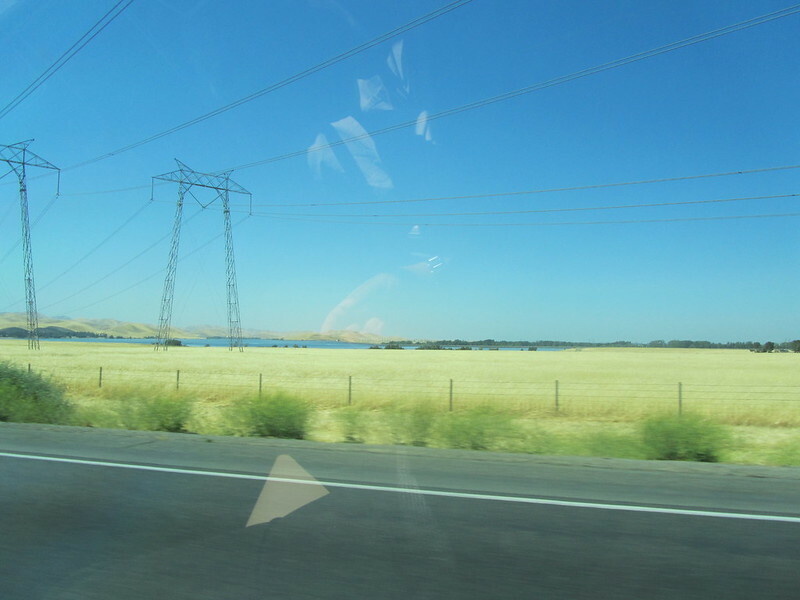 We got enough charge to skip Gilroy and head to the Tesla Motors Fremont Factory as our first stop in the Bay Area was in Oakland. 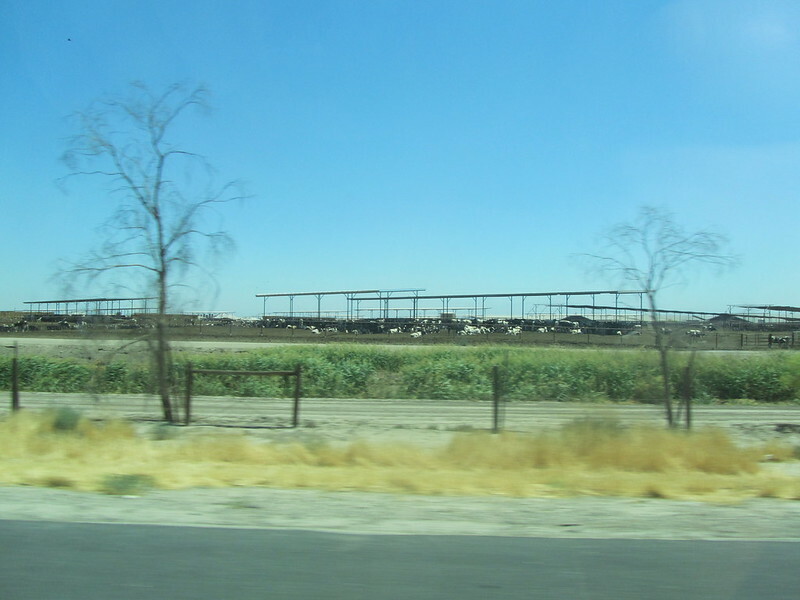 One of the things about the Harris Ranch location is its proximity to a lot of cattle. If the wind blows a particular way, you will smell the cows from miles away. We were somewhat fortunate at Harris Ranch in the daytime as the winds were in our favor. Unfortunately, it doesn’t matter because the drive through I-5 will have you pass by these cattle pens. And the cabin air filter on the Model S is no match for the smell of cow just North of the Harris Ranch supercharger. 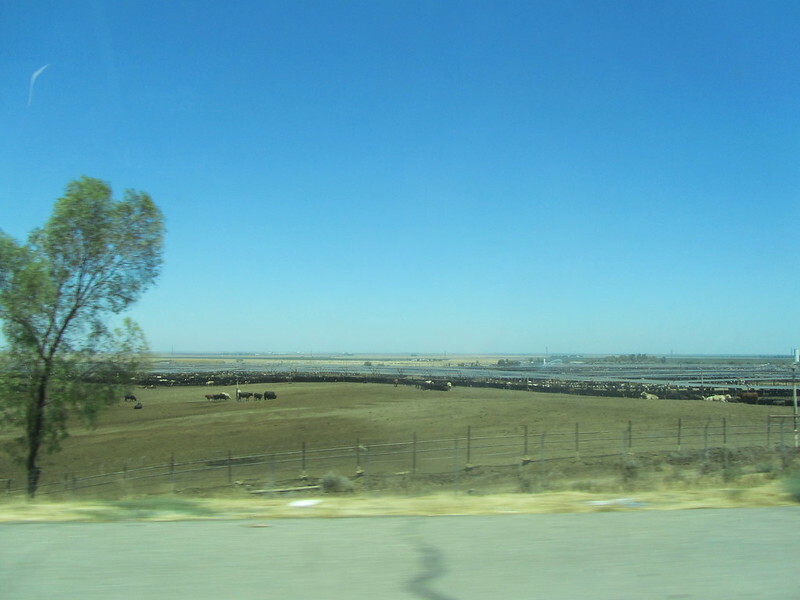 There were lots of cows for miles. 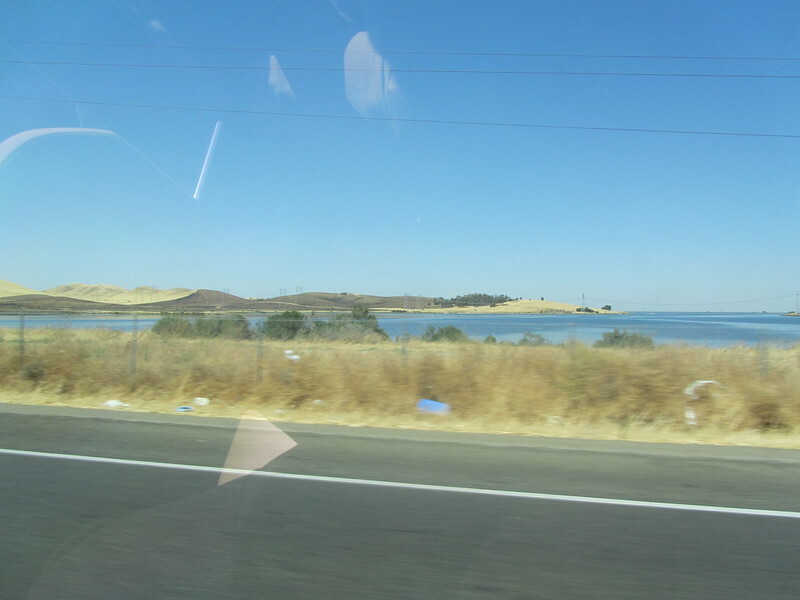 The drive toward Gilroy has us go through a reservoir area that truly reflects the sorry state of the California drought. The Golden hue of the dry brush is quite stunning. 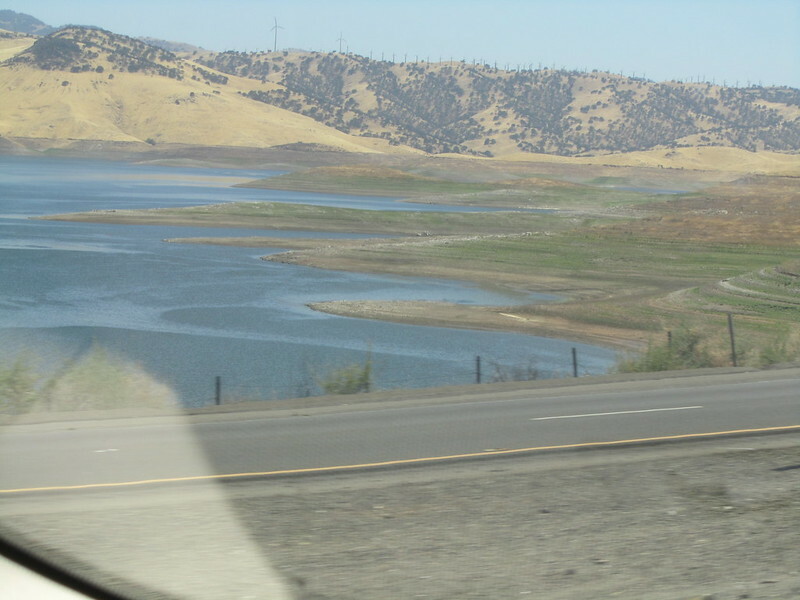 The reservoir on the other side of the hill climb shows how really low the water levels have gotten. If you look at the striations on the shore-side, you will notice rings. Those rings are where the water should be. 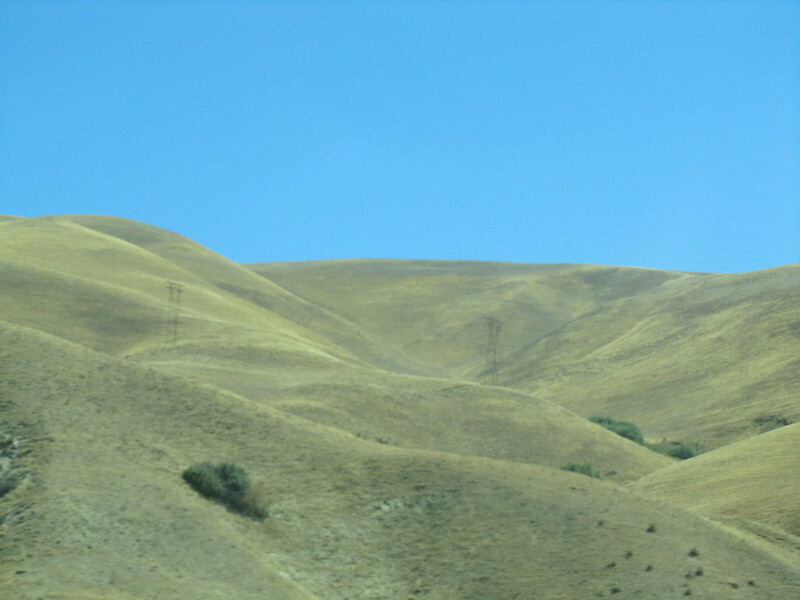 On a positive note, there seems to be an abundance of windmils on that mountain ridge. 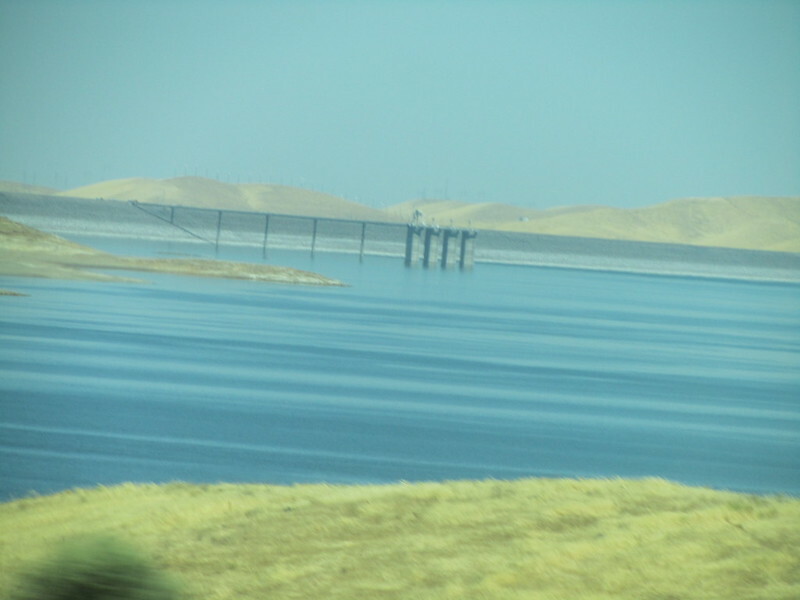 This shot shows the water as it buttresses up on the dam on the other side. 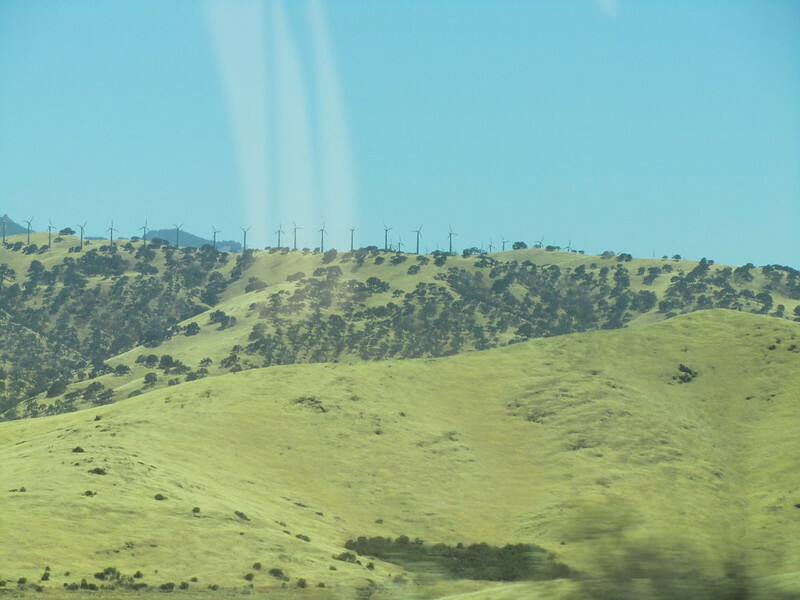 Better shots of the windmills, why don’t we also have a solar farm out there California? Readers from our Here, There, and EVerywhere series will note a change of tone here. Since I’m a California resident, I have higher expectations of my own state. So, there. This route is pretty well traveled. 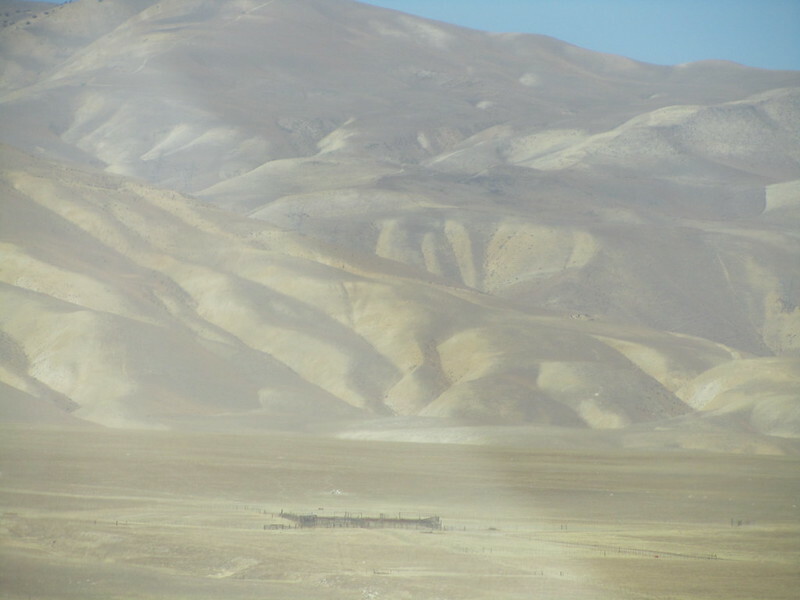 My wife captured the scene below and it’s another that leads us to wonder, photograph or painting. We arrived at the supercharger at the Tesla Fremont Factory at 4:25 pm, a few minutes passed eight hours from our departure. All stalls were full when we arrived and we had to wait about two minutes before one freed up. 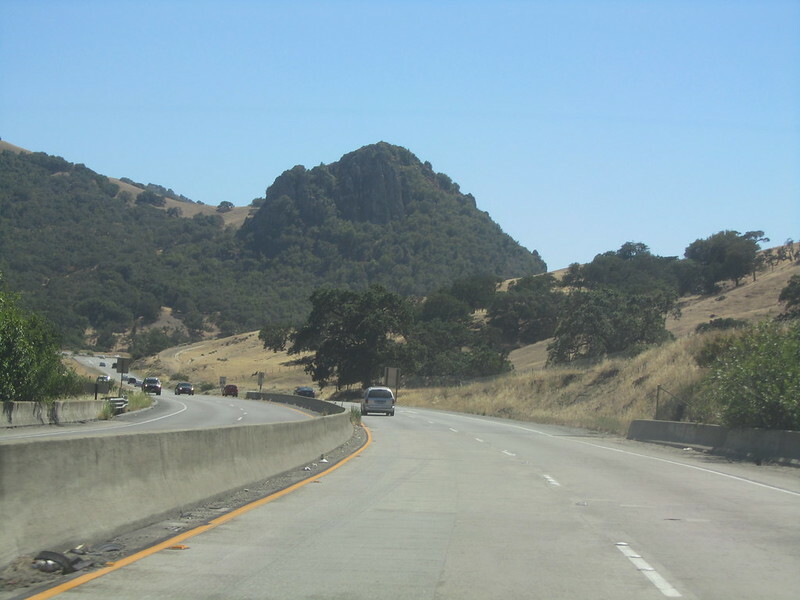 At this point of the drive, we’ve driven about 400 miles and have to drive another 20 miles North and then back across the Bay to make it to Sparky’s Garage in San Carlos, CA for the party this evening. It was on the drive that we decided to see if we can just make this drive a “day” trip and head back home today as well. 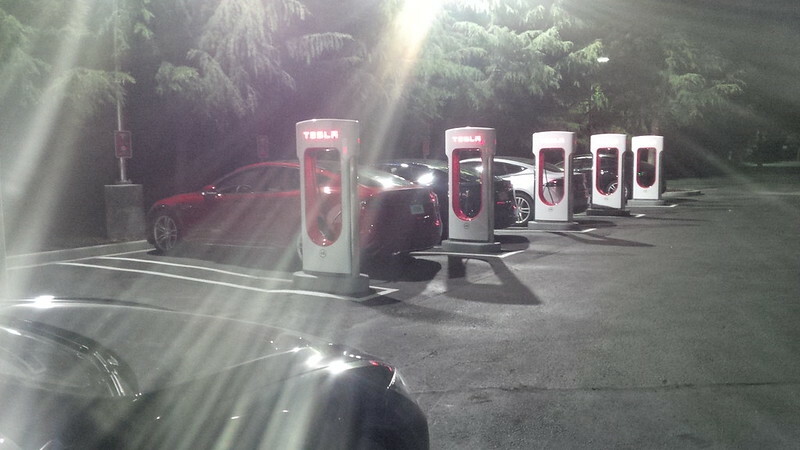 Our decision was solidified by the very expensive options for lodging in the Bay Area that we were seeing as we looked for places to stay while charging at the Tesla Motors Fremont Factory, so we figured to skip any alcoholic refreshments at the party. 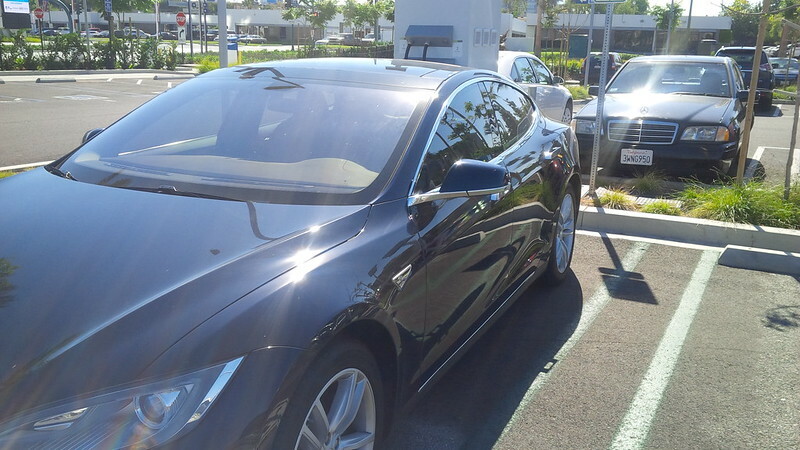 I attached the car to the open Tesla Supercharger network that I saw while charging, the result was a strong signal, but no connection. Had to reboot the main display again and disconnect from that network. We made it to our destination in Oakland. Turned back around and headed to the party in San Carlos. 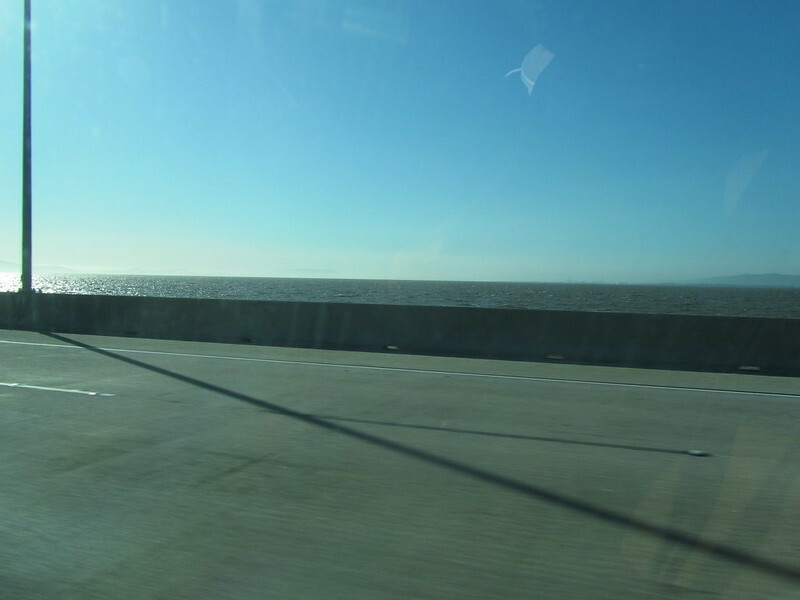 Since we were on the other side of the bay, we decided to take the San Mateo Bridge (CA-92) across the bay. One thing about traveling in our own state is we are able to use the same transponder as we do at home, so it was a lot more convenient to cross the bridge. Additionally, it seems that the bridge toll of $5.00 is half-price for carpools, so we were only charged $2.50 for this crossing. 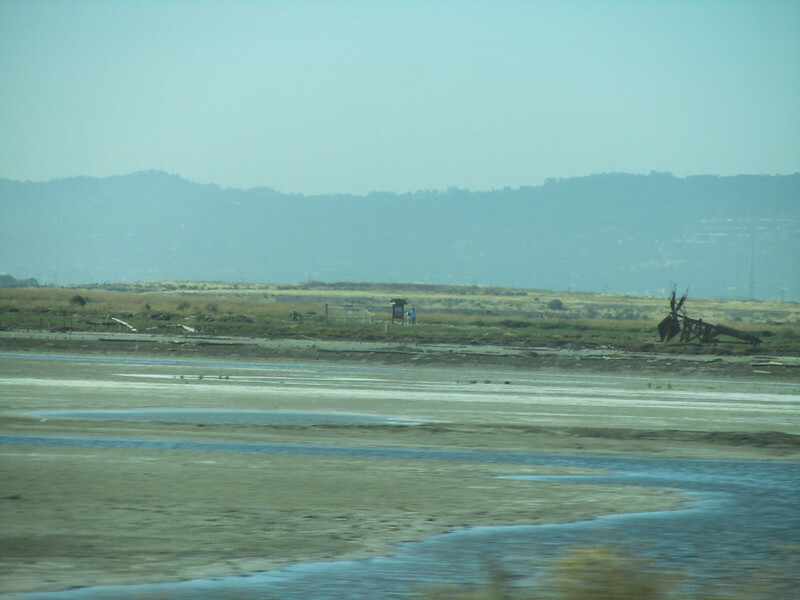 My wife took a photo of what looks to be “old windmills” on the side of the low-tide entering the bay. I wonder if that’s what they are. It is wildly disconcerting to have water on both sides of us at such a low point. It felt as if it won’t take that much for the water to go over the side of the San Mateo Bridge. So, the trip up to the Bay Area was two-fold. 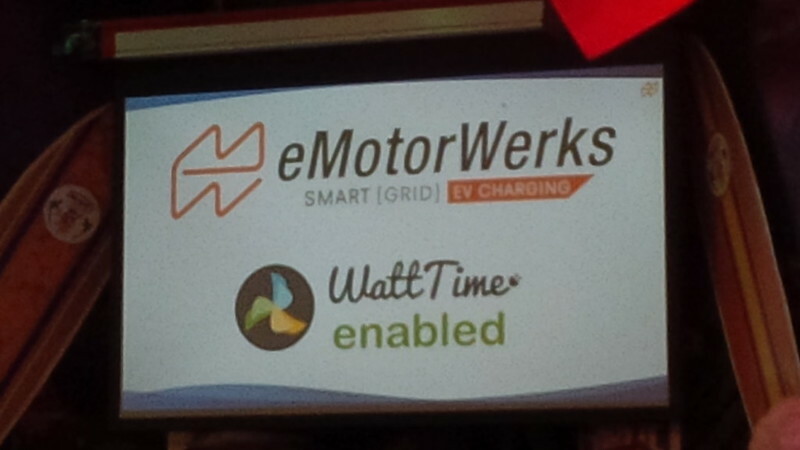 The first part involved our quick stop at Oakland, and the second was to attend a party that eMotorwerks and Wattime.org was holding to announce the launch of the first EVSE that plans its charge based upon “cleaner” energy supply. Jack’s Take Charge and Go tags were the giveaway at the party and it’s a great improvement over the free Plug In America EV Card that I usually use. 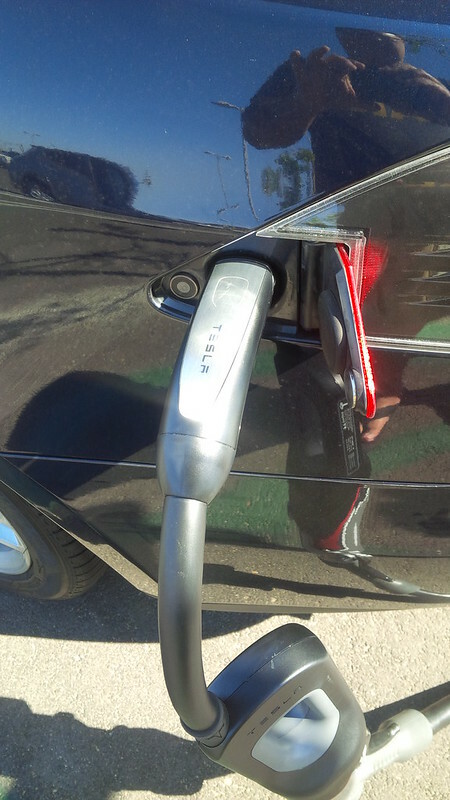 The hang tags are attached to the charging nozzle with a red and green side to say whether it’s “ok” to unplug the car, provide the operator’s contact information, and an estimate of the time that the operator would be done charging (provided the operator carries a dry-erase pen with them). 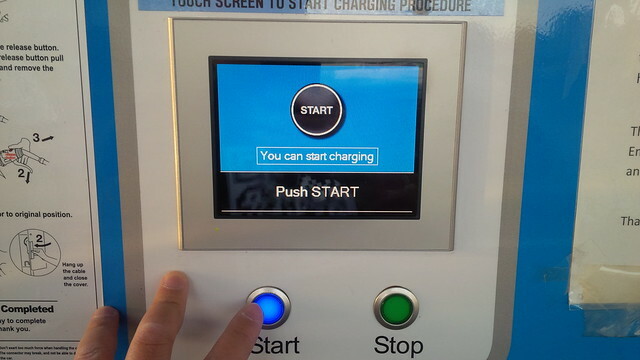 I think that I will probably be moving toward this method at charging stations, as soon as I get a dry-erase pen. The product announcement itself was quite interesting. 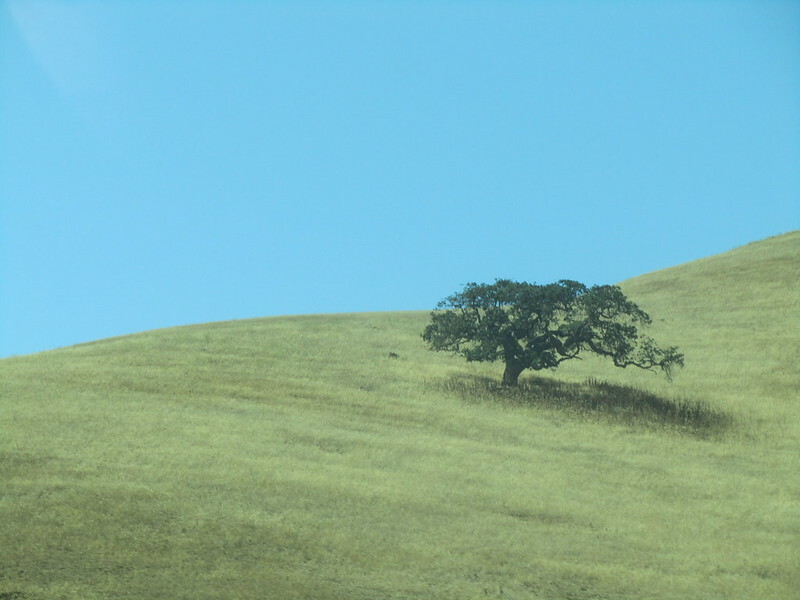 As the title of the blog is quick to point out, I am accidentally environmental. We didn’t join the rEVolution to be green, we just ended up being environmental as we became more involved in electric vehicles. I am sure there are more things that we can do to be better and we’ll get there. The folks at Green Car Reports had a good write-up on the product launch and I suppose that it’s a good compromise for those that don’t have solar panels or their own windmill to try to minimize their use of “dirtier” sources of electricity. Wattime’s Executive Director, Gavin McCormick can be seen on the shot below discussing what it is that Wattime is doing. They provide manufacturers with a method to enable the device to know whether drawing power at a certain time will force the utility to source power from power plants that were not using renewable energy. He was saying that a five minute delay could be the difference between dirty or clean power sources being on or offline. I suppose the next step for the manufacturer is to allow users of this algorithm to set guidelines of how much they are willing to subsidize others in order to delay their charge for “cleaner” grid power. As with most things, it’s a complicated decision and it’s at least commendable to have this information available to those that wish to make use of it. I wonder how many people will take them up on it. We have enough EVSE and plugs at home to charge four vehicles at the same time, so I wasn’t really in the market for another one. So, after enjoying the company of fellow EV enthusiasts, and many Electronuts (former BMW Active E Electronauts), who were at the party. We headed South toward home. Our first stop was to supercharge again at Mountain View so that we can check out the new liquid cooled superchargers and range charge to skip Gilroy, again. 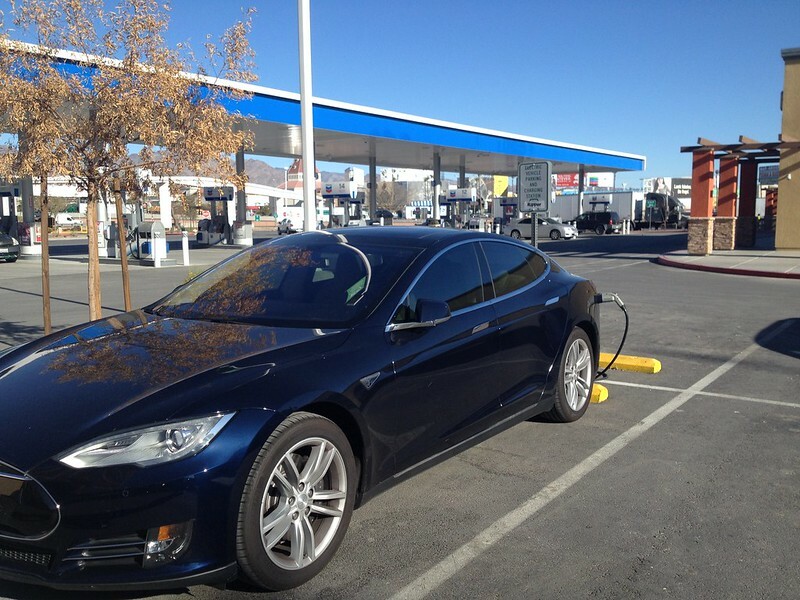 The Mountain View Supercharger is the first new supercharger with the liquid cooled cables. 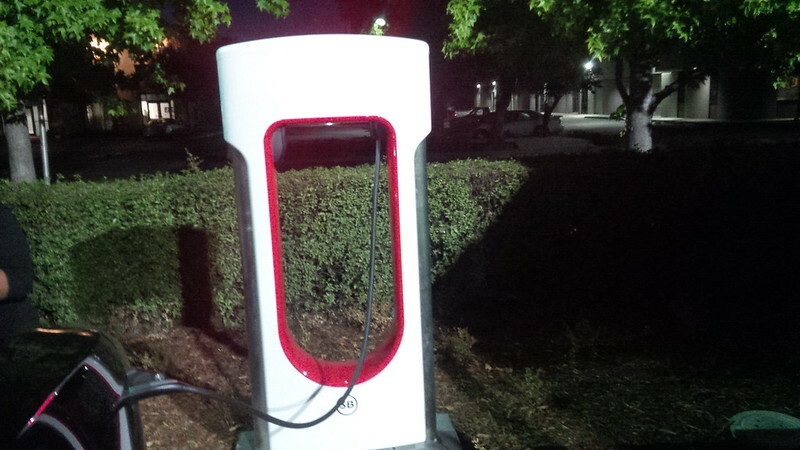 Tesla announced this improvement in supercharger technology during the 2014 Annual shareholder meeting the previous month. Transport Evolved wrote an article and covered a video that was filmed at the location by another Tesla owner and I wanted to see it first-hand. 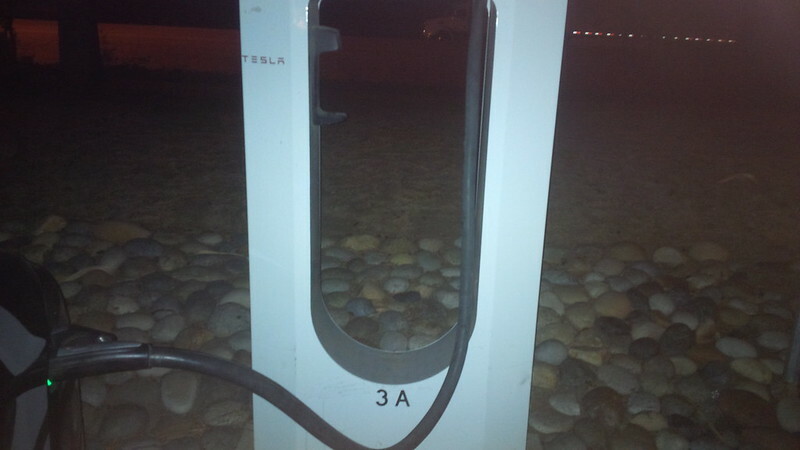 We initially picked stall 3A to charge because it and its partner stall 3B were open. However, we saw that stall 3A had a blue note saying that it was designed for disabled access and to use it last. So we moved. Now, to ensure that we get the fastest charge, we moved to 3B, the stall paired with this one, figuring that it we were supposed to use it last, then it should stay free the longest, and thus not need to split its feed with another car until all other paired stalls were full. I took photos of the other stalls around us. I wanted to capture photos of the thinner/liquid-cooled charging cables. Has the new circular proximity button for charge door and cable release. 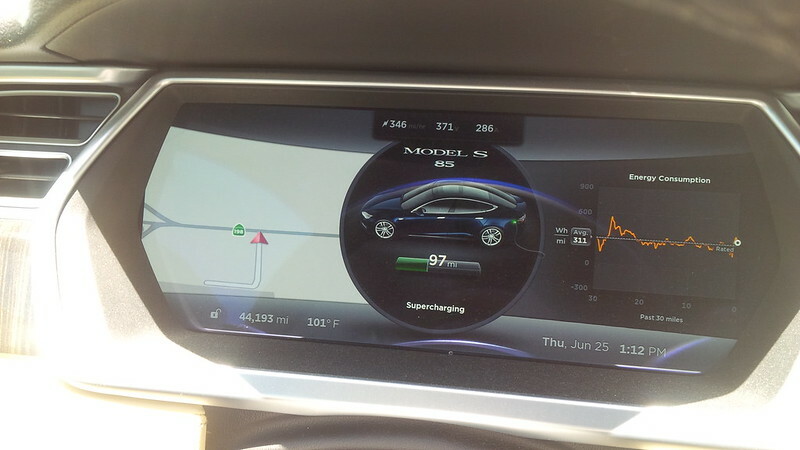 Since the cable is thinner, it is more flexible than previous generations of superchargers. Though the first photograph of the charging showed a 197 mile per hour rate, this actually sped up to close to 340 miles per hour. It would seem that the chargers in Mountain View are faster than others and we were planning on skipping Gilroy again to get to Harris Ranch directly, we decided to range charge the car again. So, while waiting for the charge to complete, I did another Periscope session that we archived on Youtube. As I continue to note, Periscope doesn’t do a good job of saving the chat comments from folks, so I transcribed it below. @Tim61588: Is that an Eaton supercharger? @Legibly: How long does that last on full? 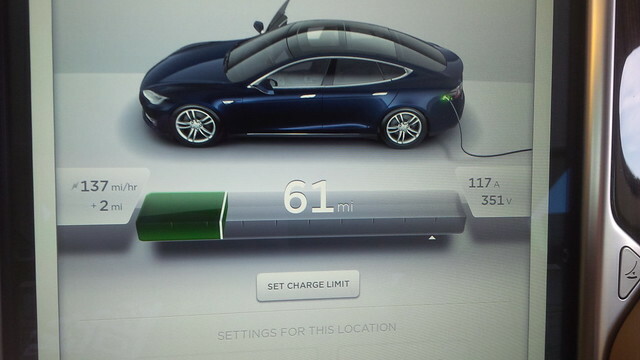 @Tim61588: how long to charge from near empty? [Unknown]: Is that the new P85D? @torfn: and your happy with it? 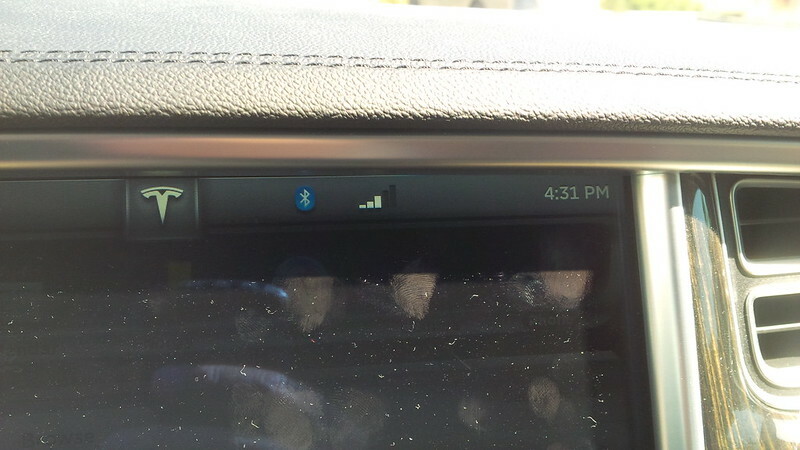 @JeremyHolleb: Does A/C use really destroy battery life??? @BradlyBurgundy: This thing have insane mode? @DspkMsn: Does it get 400 mi range? 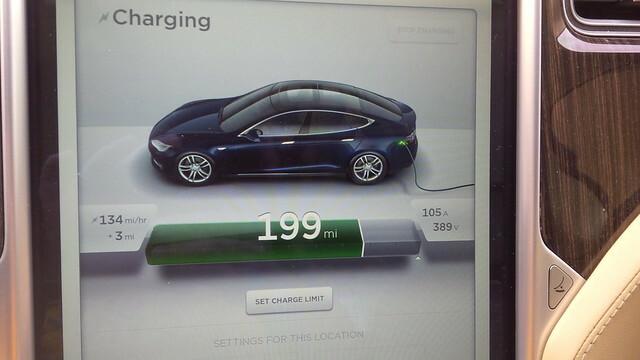 @BradlyBurgundy: How long to charge? 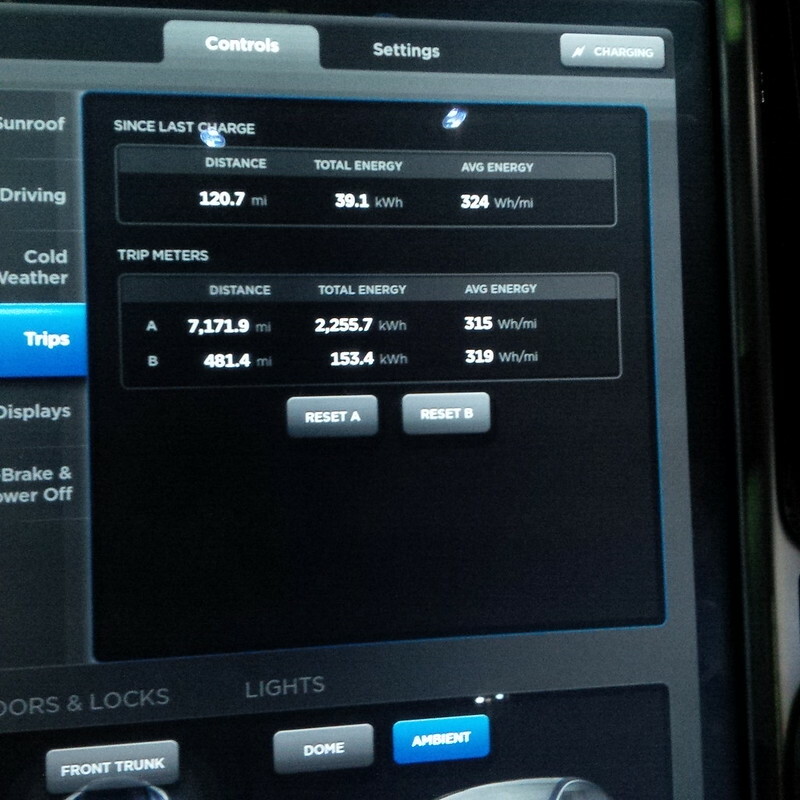 @STenczynski: Doesn’t one of the tesla model drive by itself? @Legibly: Does it take gas too? 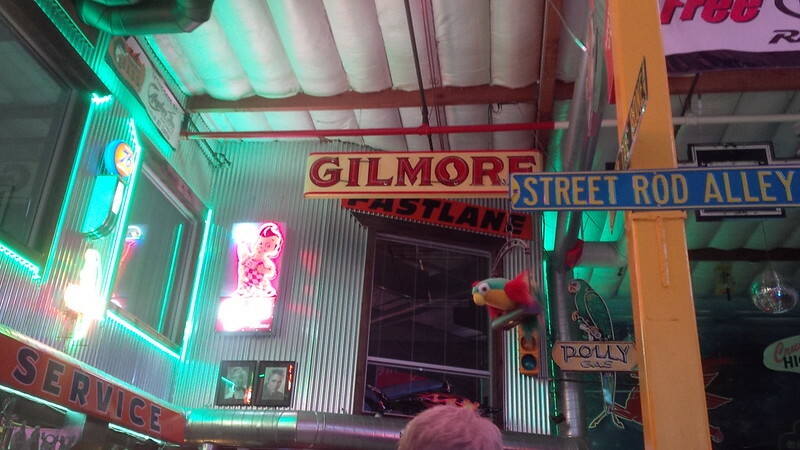 @ThaddiusT: There should be a burger joint there too. Make a killing. 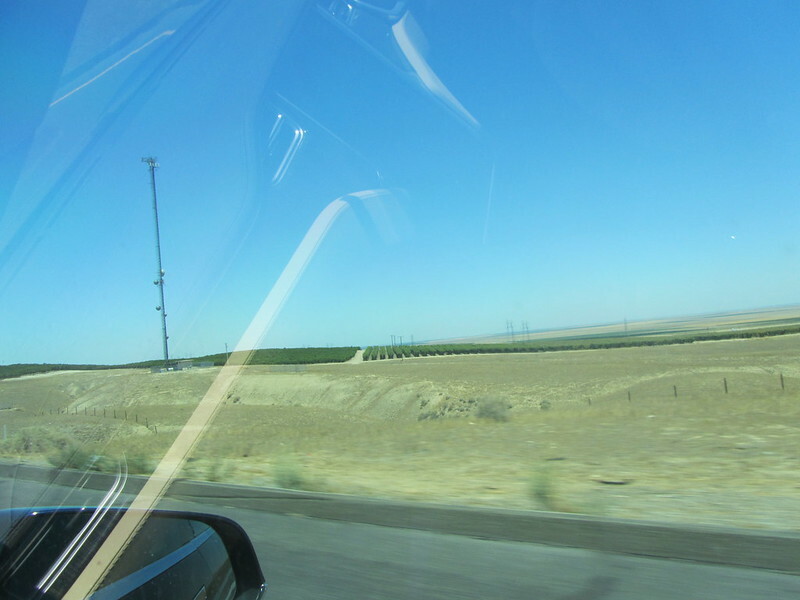 @Legibly: So if you were to go for a cross country drive you’d have to find a charger station? @ThaddiusT: Meh. Starbucks. All about Philz. @ThaddiusT: You from around here? @ThaddiusT: You check out the plant while your here today? @Legibly: How long have you had it? @tprevett: Any problems with it? @ThaddiusT: Mind if I ask the final cost? @Legibly: He said any problems with it? [Unknown]: What’s your opinion on the bmw i8? @ArguablyDefined: Talk about the gaskets. Please. 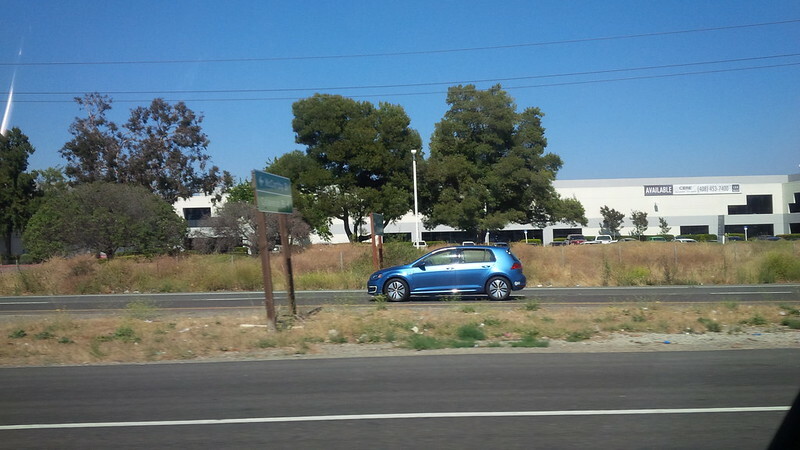 @Legibly: Can you show us outside the car please? We got a full charge and left Mountain View to head to Harris Ranch directly. 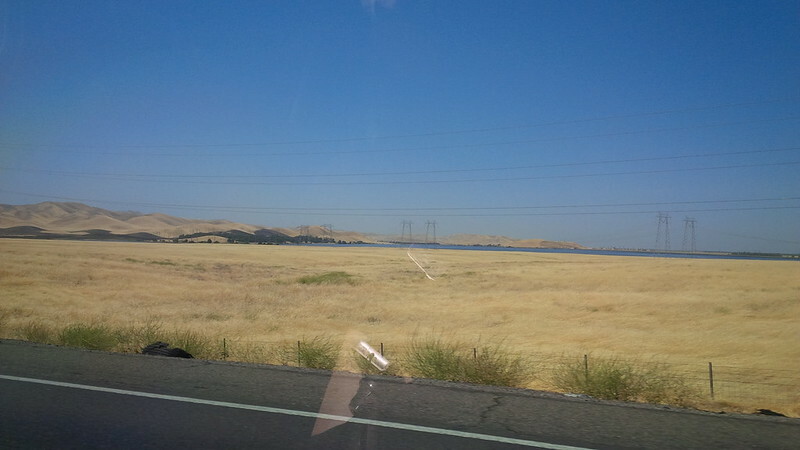 Seeing that we were planning on making it all the way home from the Bay Area, my wife, and co-driver, went to take a nap as I drove us to the next supercharger. 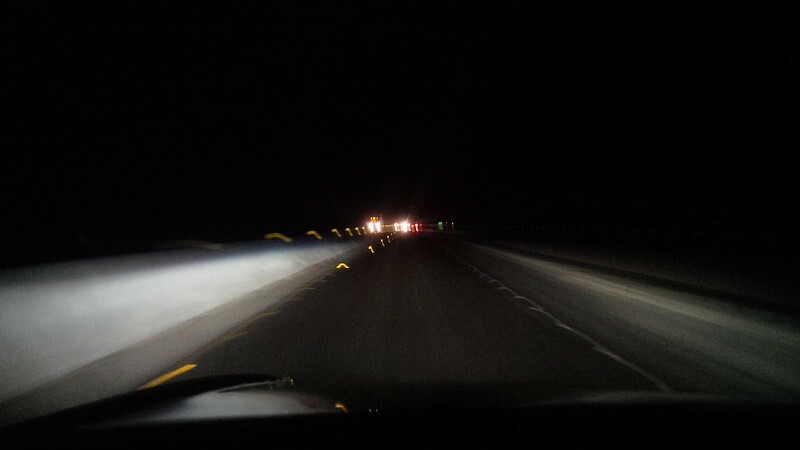 After passing the Gilroy superchargers and on the way to Harris Ranch, crews were doing overnight construction with only one lane open on a two-lane road. So we found ourselves stopped for what I would estimate to be 20 to 30 minutes. We were parked on our side of the road waiting for the other side to complete their drive through the construction zone. 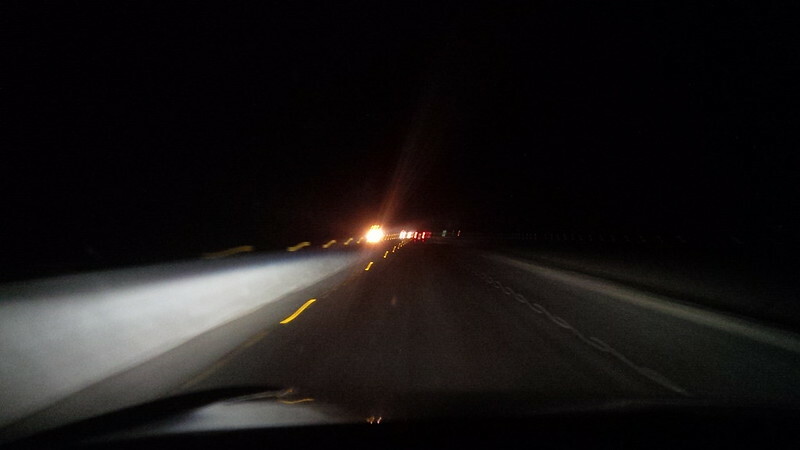 When it became our turn to go ahead, we were led through the construction site slowly by a pilot vehicle. 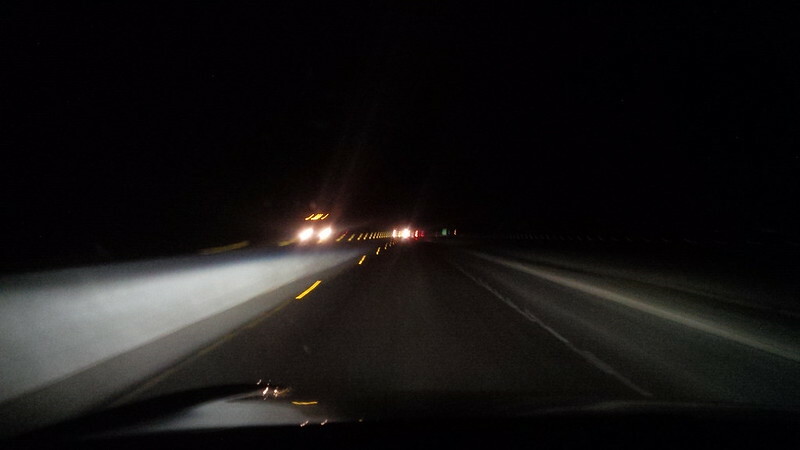 It was a dark drive, but still not as dark as what we encountered in other parts of the country. Additionally, there were no “Deer Crossing” signs to worry about. 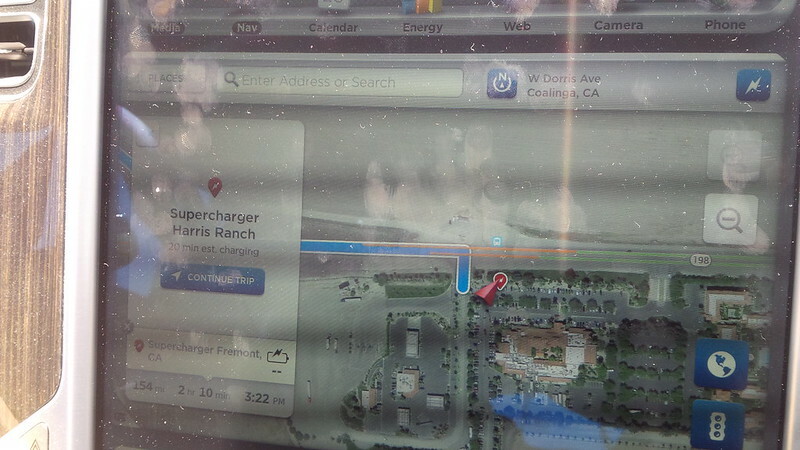 And a few hours later, we find ourselves back in Harris Ranch Supercharger again. 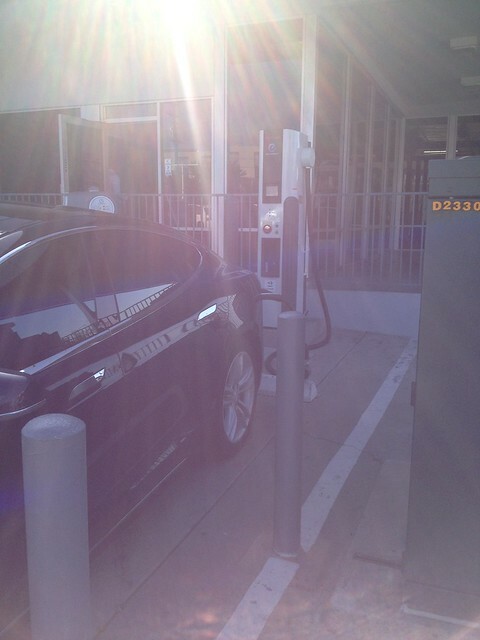 We joined another Model S charging here. 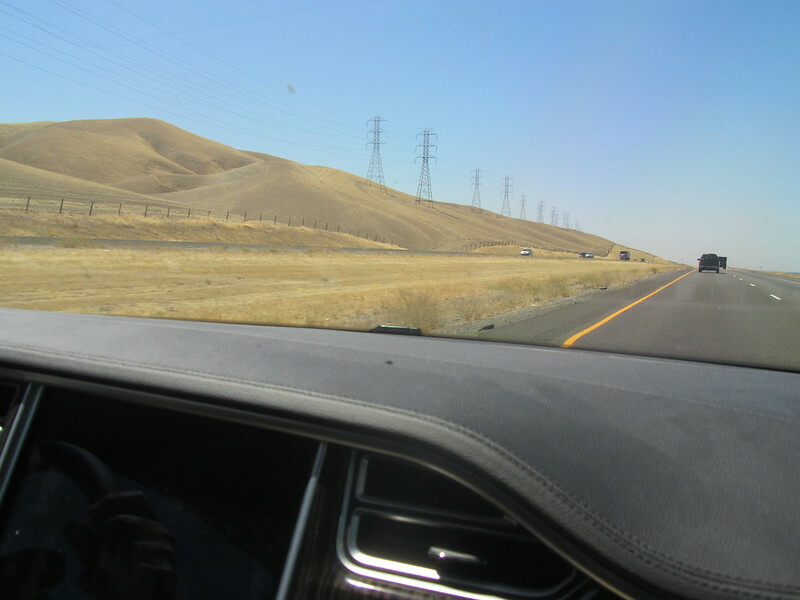 The Model S was a family from Napa on the way to San Diego for vacation. They told us of pending overnight construction and possible detour. They had spoken with the CHP earlier. So, we decided to fill up the car with at least 40 miles additional rated range. When not sharing a charger, the rates can get really fast. The one in Harris Ranch was going around 315 miles per hour. 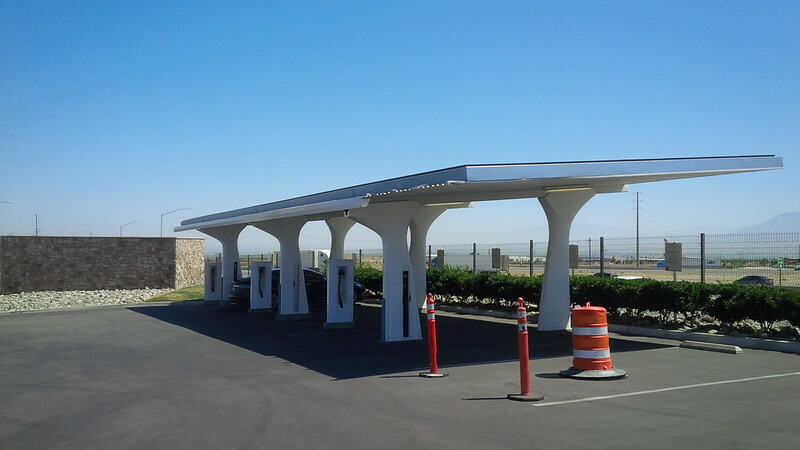 The Tesla battery swap station is closed and only available from 9 am to 5 pm local time, so that would not have helped on the return journey this evening. I wanted to compare the Mountain View supercharger cable that we photographed earlier, so, here is the Harris Ranch one. 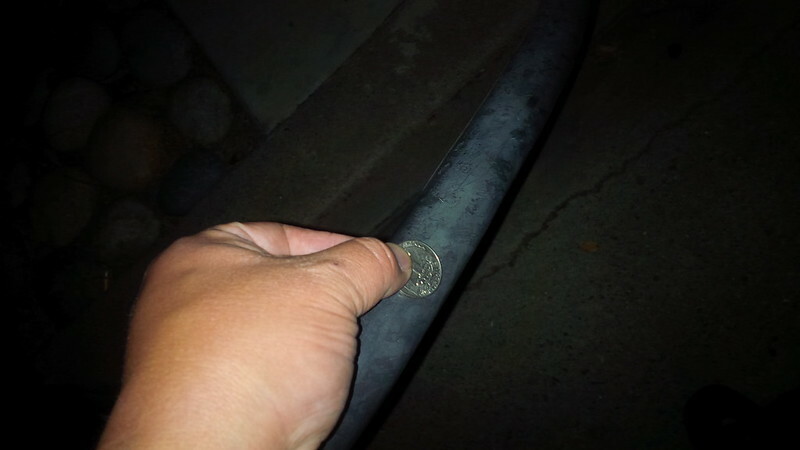 I wanted to give two views of the cable with the quarter, so the older cables really are that much thicker than the new ones at Mountain View. I wonder how much faster the liquid cooled cables will be able to charge. 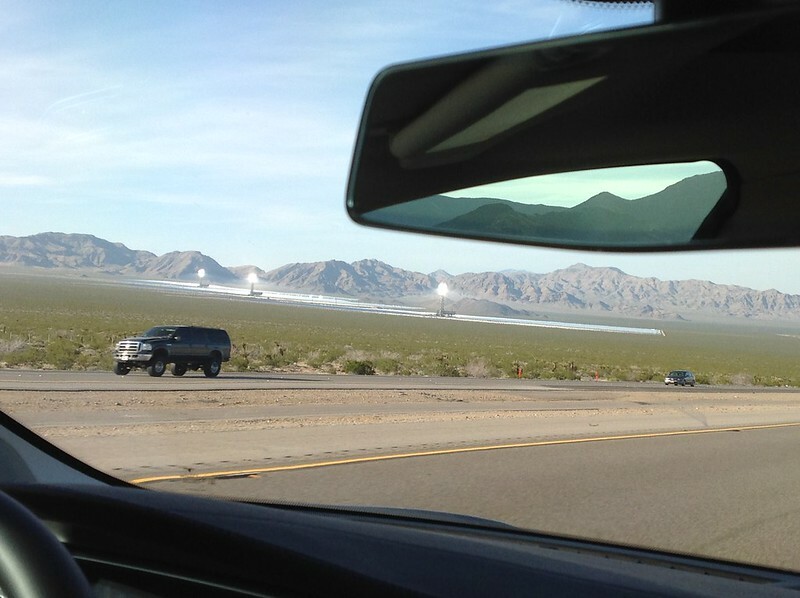 I saw it them peak around 340 miles per hour when I was charging. The original cables are quite bulky and others have found them harder to work with. 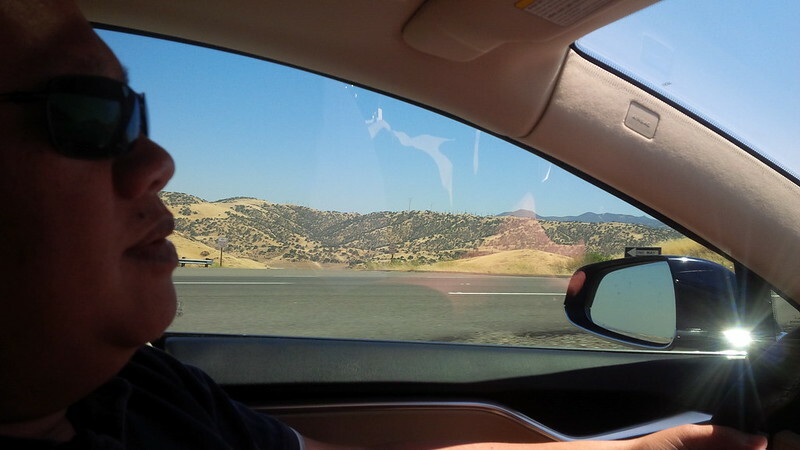 Had my wife continue to rest while I went over to grab some “gas station coffee” from the station close to the supercharger and proceeded South to Tejon Ranch. 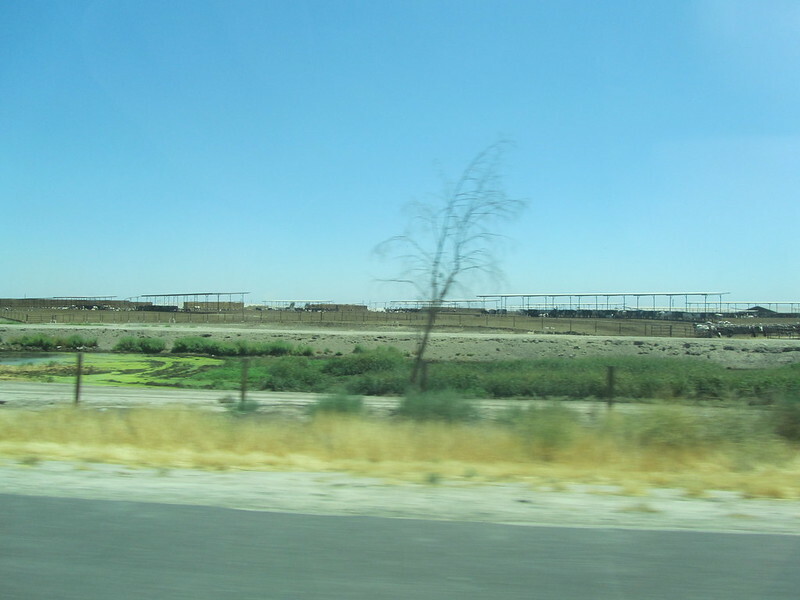 The construction zone that we were warned about ended up being a non-event, though at times, we found ourselves on the “other” side of I-5 at times as they were working on the Southbound side of the freeway. You know what happens when we show blurry pictures. 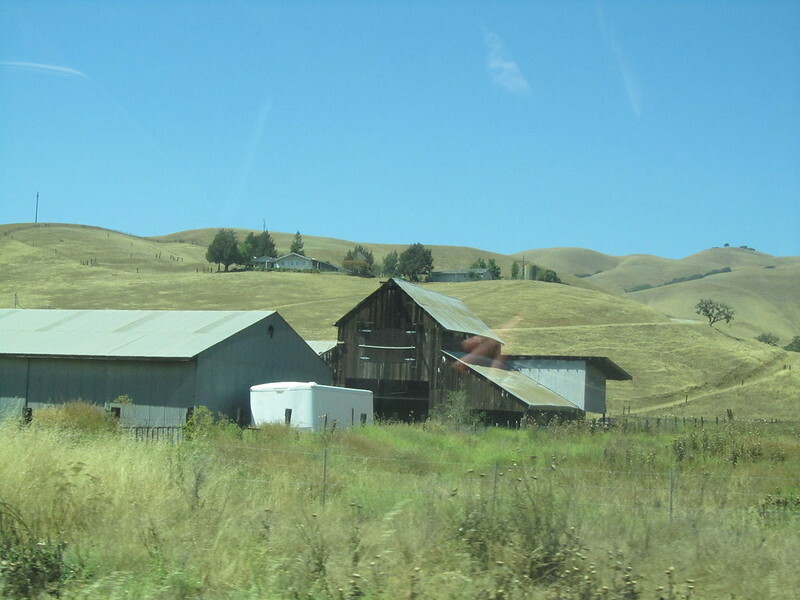 Normally, it’s time to stop and find a place to sleep for the night, but we were so close to home from Tejon Ranch. We plugged in and charged up. We only need to go a little under 120 miles to home. 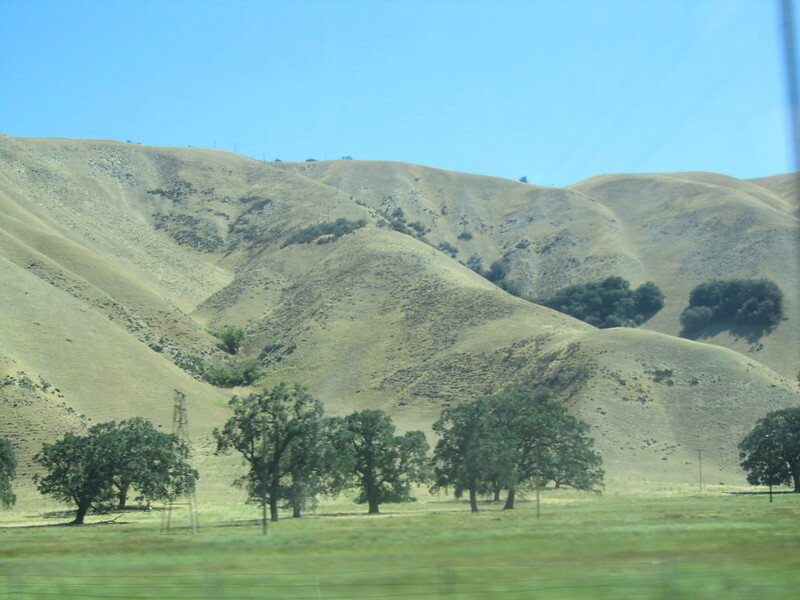 My wife felt rested from our drive from Mountain View to Tejon Ranch, so we swapped drivers and she proceeded to take us home, after we got a charge. She took the tough climb up the Grapevine and decided to just drive all the way home, skipping all three superchargers on the West Side, Culver City, Hawthorne, and Redondo Beach. 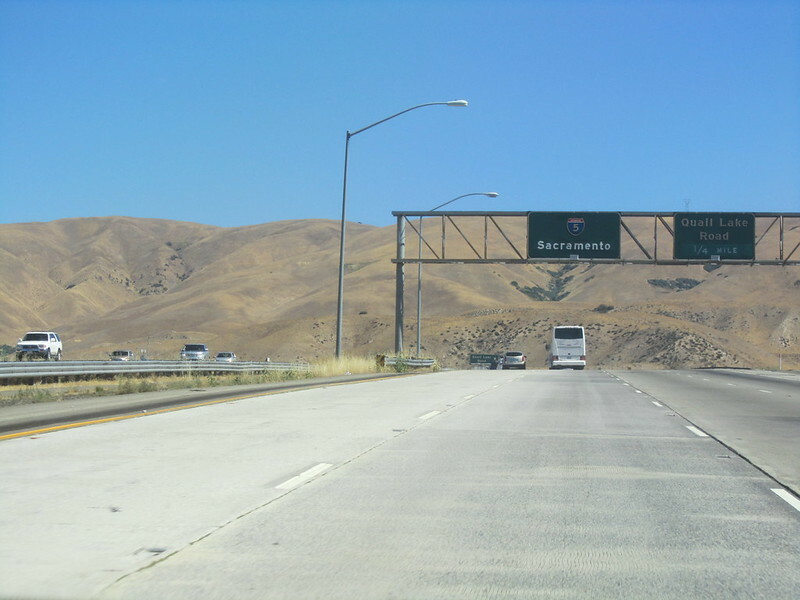 At that time of the morning, if we had stopped at any of the superchargers, we could have gotten stuck in traffic on the freeway, besides our bed was calling us home. After nearly 22 hours on the road, we were home. That was a LONG DAY. 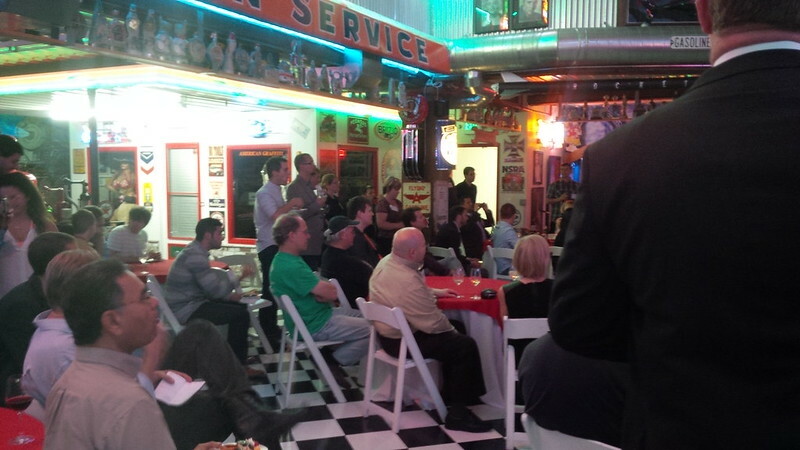 Of course, we did do a few things, attended a party, and such. 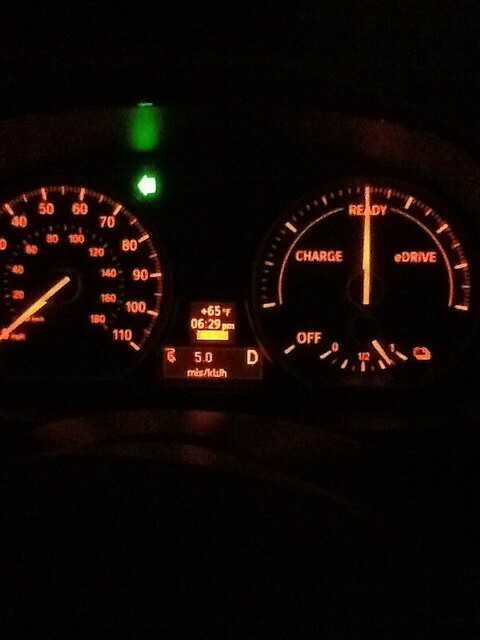 And another interesting mileage pattern in our garage – 44,800 miles. The 852.9 mile journey actually felt shorter than Day One of our Here, There, and EVerywhere trip, perhaps it was the long break in between each half of the drive. Either way, it’s good preparation for next week’s TMC Connect 2015. Elon Musk’s tweet (“@elonmusk – Tesla press conf at 9am on Thurs. About to end range anxiety … via OTA software update. 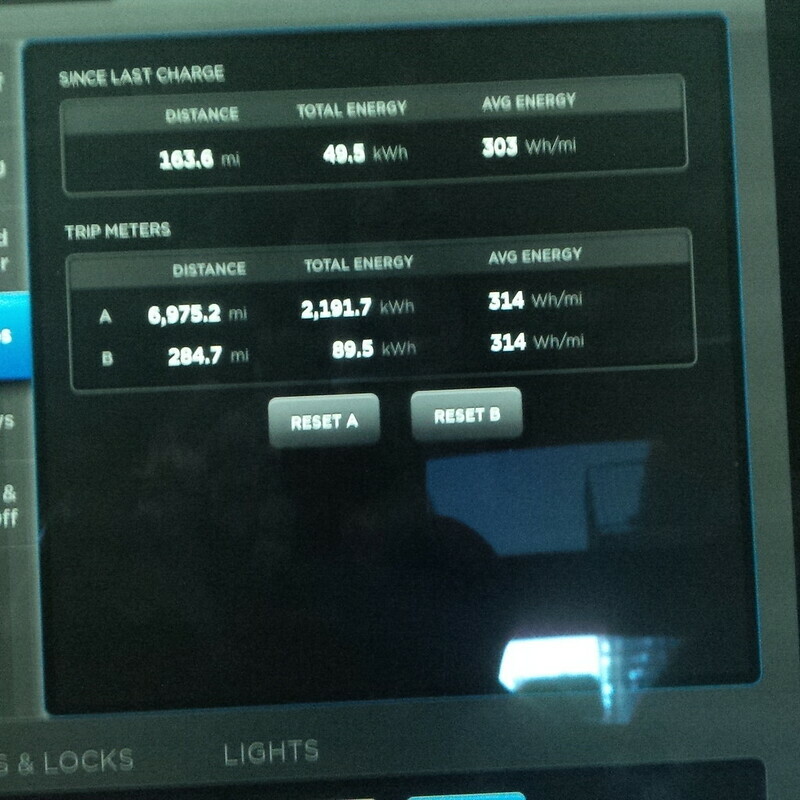 Affects entire Model S fleet. March 15, 2015“) to end “range anxiety” which has since been deleted, had me thinking not about the disappointing announcements regarding the 6.2 software patches, but about when the last time was that I’ve actually experienced range anxiety. I must admit that it’s been a while for me. 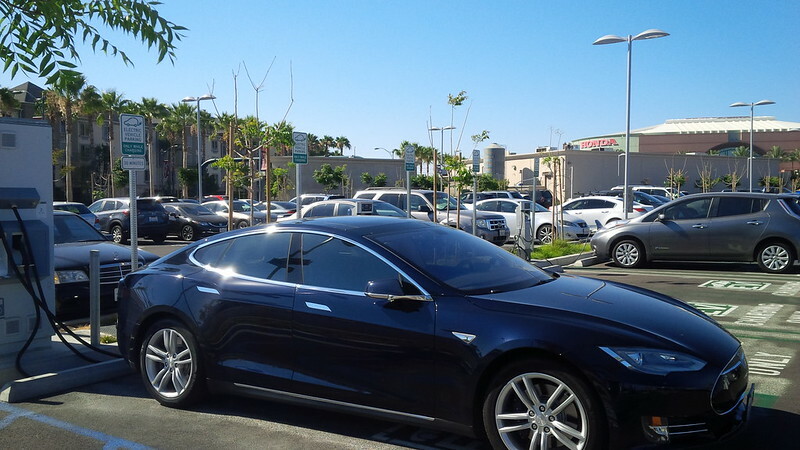 We decided to move to Tesla Motors electric vehicles because we didn’t want to have to worry about range. 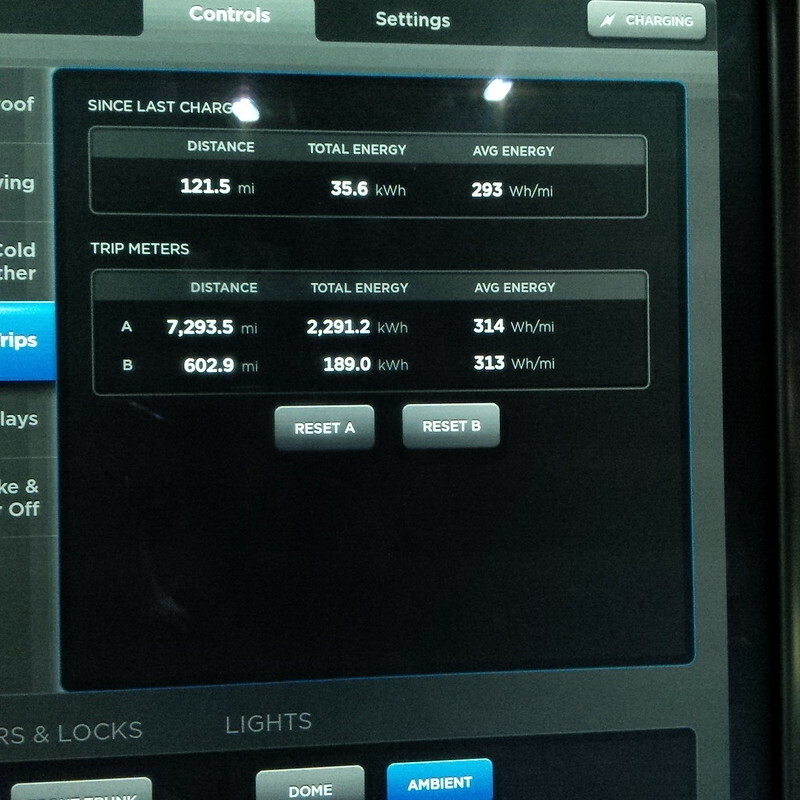 Both the Model S and Roadster have a range of at least 170 miles. 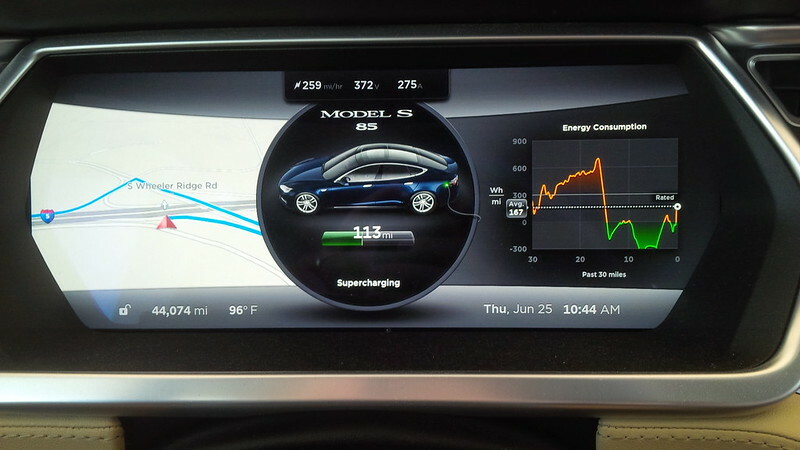 As for recharging, using DC Charging, the Model S can Supercharge at over 300 miles per hour or quick charge using CHAdeMO over 130 miles per hour. 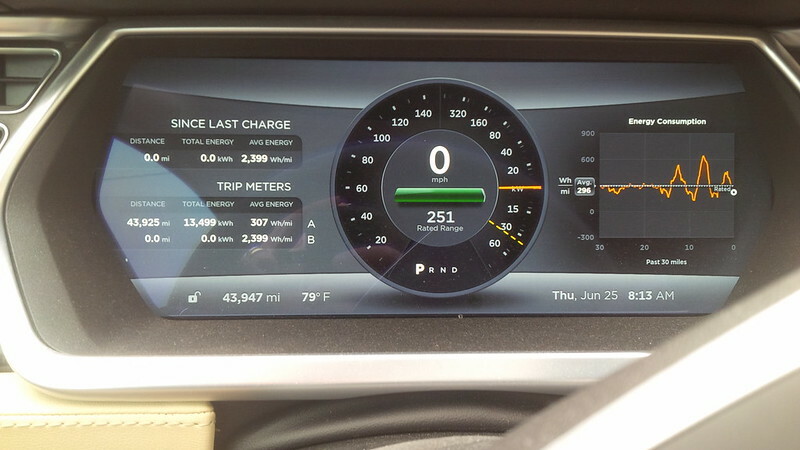 Over AC charging, our Model S can go up to 80A (or approximately 58-62 miles per hour) and the Roadster can go up to 70A (or approximately 56 miles per hour). That’s plenty fast recharging. Besides, if you charge overnight, it’s time you’re spending sleeping anyway. When we first started our adventure with electric vehicles with the Active E, range anxiety was a byproduct of moving from a nearly limitless range to one where each full charge lasted 80-100 miles. However, it wasn’t long that I was making the statement that the range of the Active E was limitless, as long as you can get charge and have the time to wait for a charge. If a charger was available, I plugged in, even at 110V when no L2 was available. 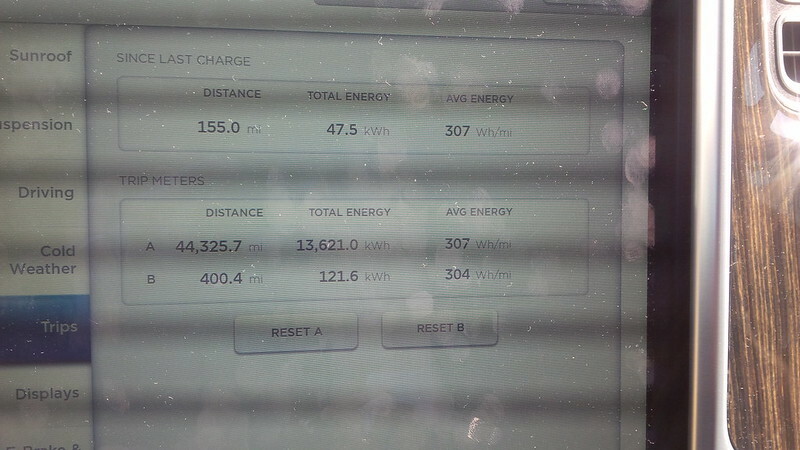 It was not uncommon for me to do 140 mile days in the Active E. It required charging at multiple places, but L2 at 6.6 kW and later at 5.2 kW is not exactly speedy, but it isn’t slow either, at least at the time. 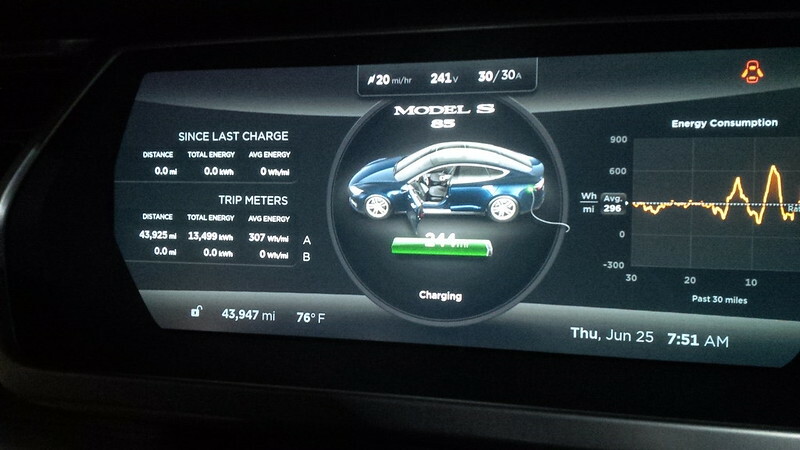 Now that I’m used to Supercharging, quick charging, 40 Amp/10kW charging over a NEMA 14-50 or 6-50 connector, it seems that approximately 20 miles per hour seems so slow. 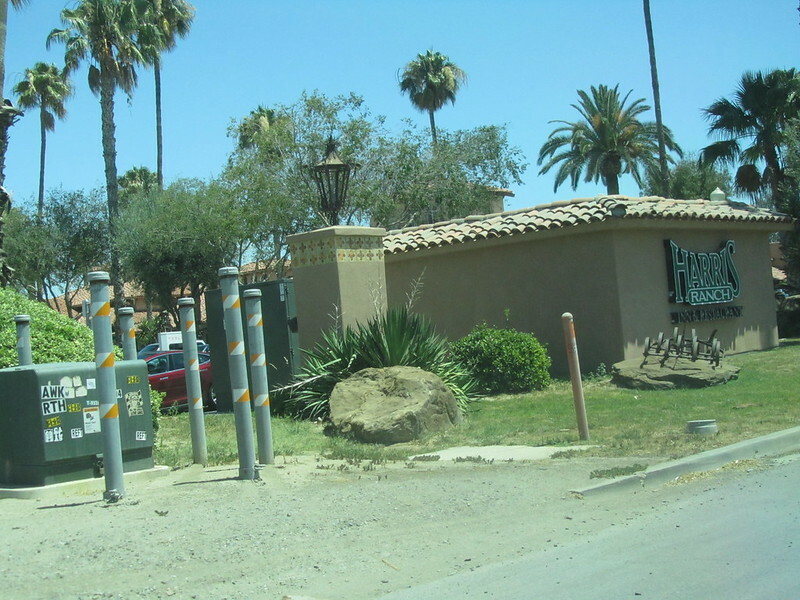 Public charging in 2012 was fairly plentiful and easy to use in Southern California. 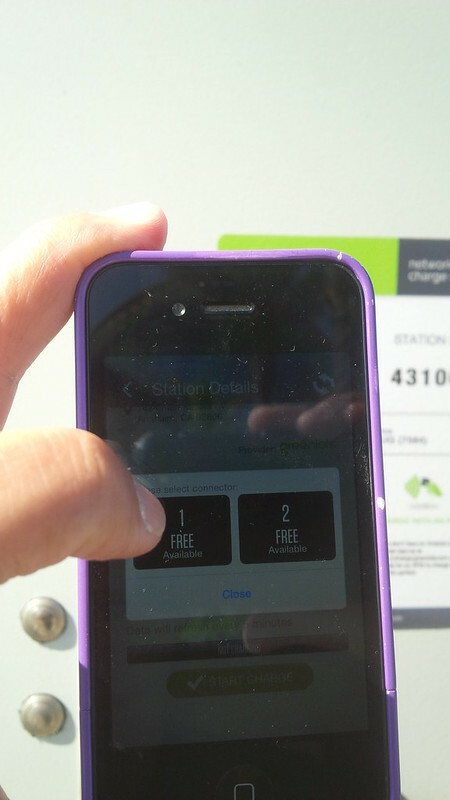 Rarely did I have to wait, and most of the places that I found to charge at Level 2 were relatively free. Things became relatively harder at 2013. One could say that projecting the pending difficulty in obtaining public charging with shorter range electric vehicles definitely helped contribute to the decision to get Tesla Motors vehicles. 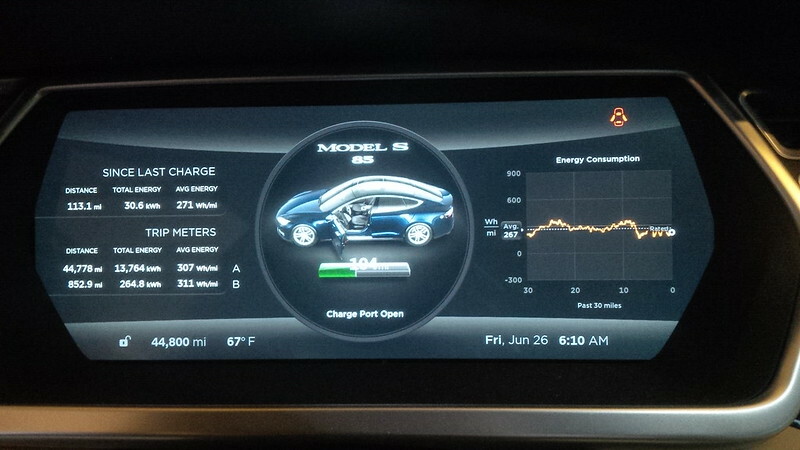 So, Range Anxiety with the Model S? Not really. One of the first things that I did when we first got our Model S and Roadster were to get some of the available charging adapters. Aside from J1772, we got adapters for NEMA 6-50 as well as NEMA 14-50. so that we could charge the car at up to 40A. 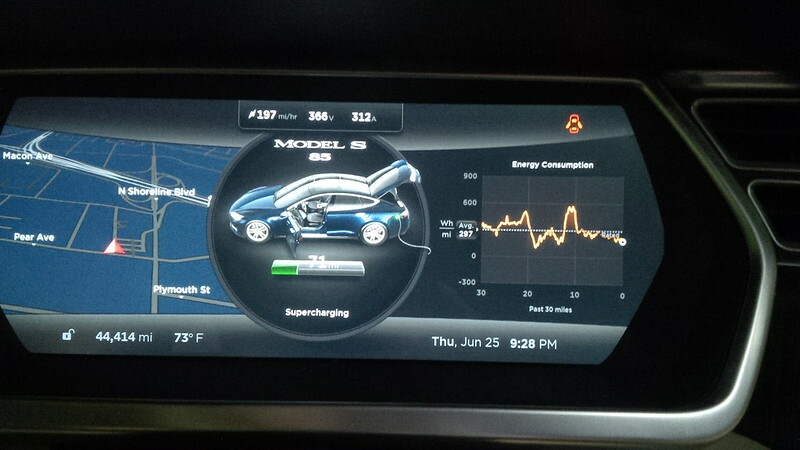 Though the Model S (with dual chargers) and Roadster can go to 80A and 70A J1772 if presented with that speed. 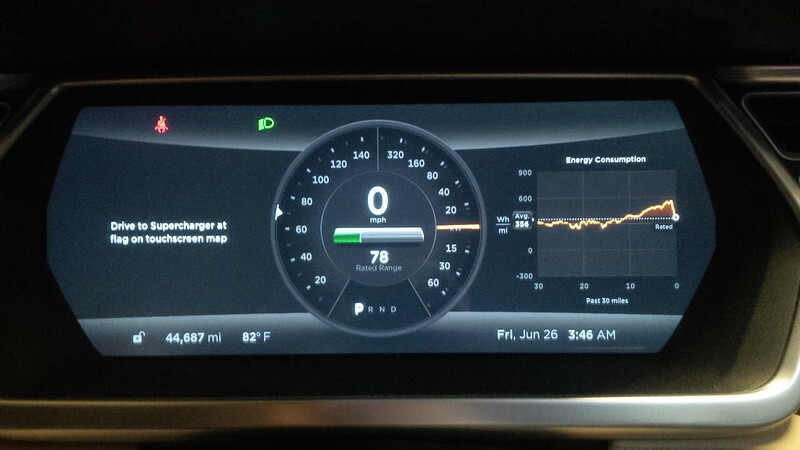 Plus, as I recently wrote, I just got CHAdeMO for our Model S, that’s a really respectable 130 miles per hour. Which brings me to hyper-miling and Elon’s announcement. 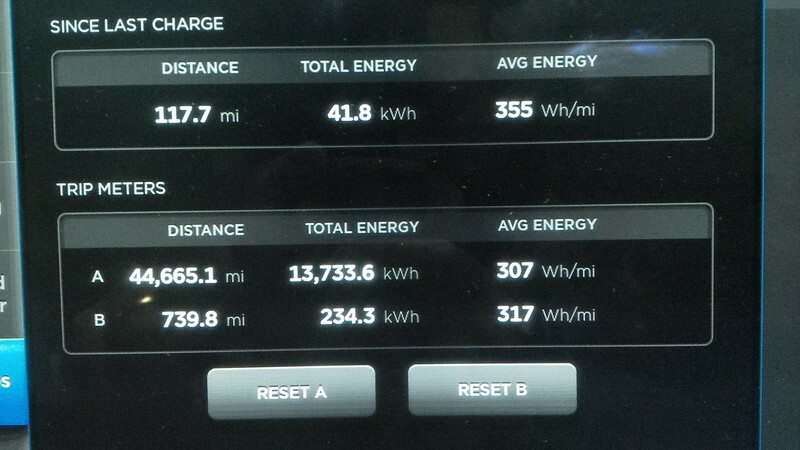 Hyper-miling is a skill that I learned about and learned to do when I first got the Active E. Getting the most miles per kWh was the goal (or consuming the least wH per mile as is the measure on the Model S, which I’ve measured at 307 wH per mile recently). 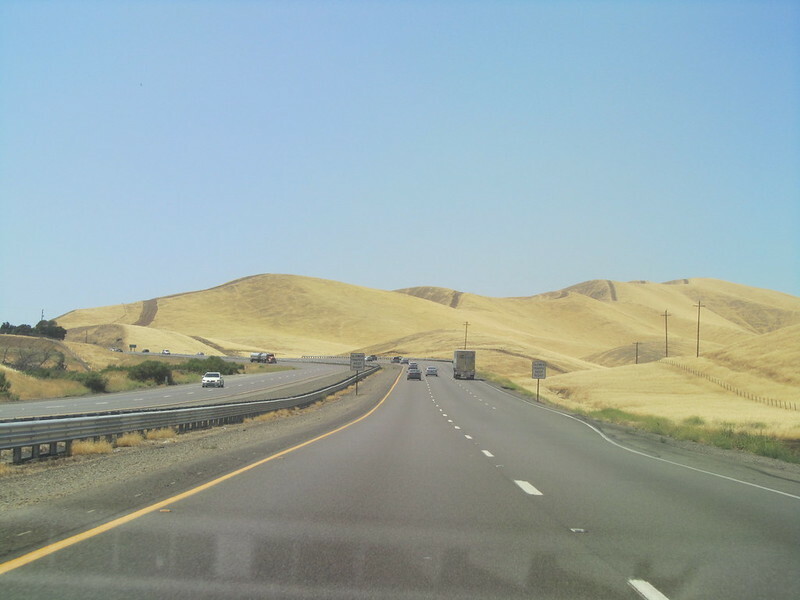 In a nutshell, hyper-miling involves driving at a constant speed, or motor use and using larger vehicles, trucks, etc. 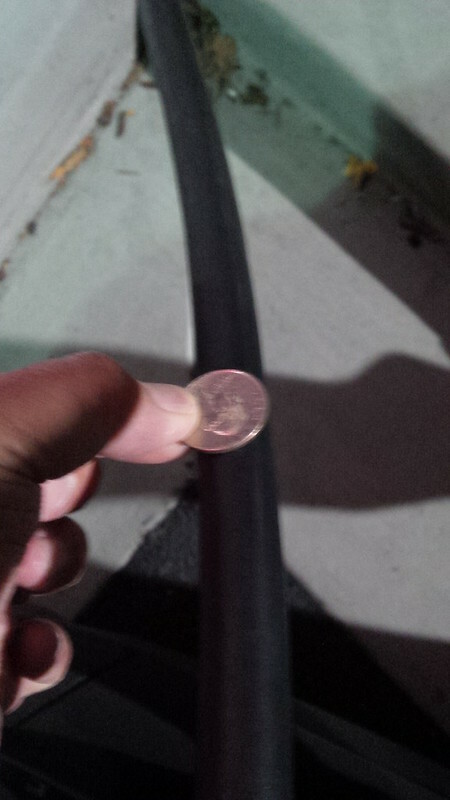 ahead of you to lower the wind resistance that impacts your vehicle. With the Active E and the size of the 1-series that it was adapted from, it was relatively easy to find vehicles that are “larger” than it to “drift” behind and it was noticeable to see the miles per kWh climb. 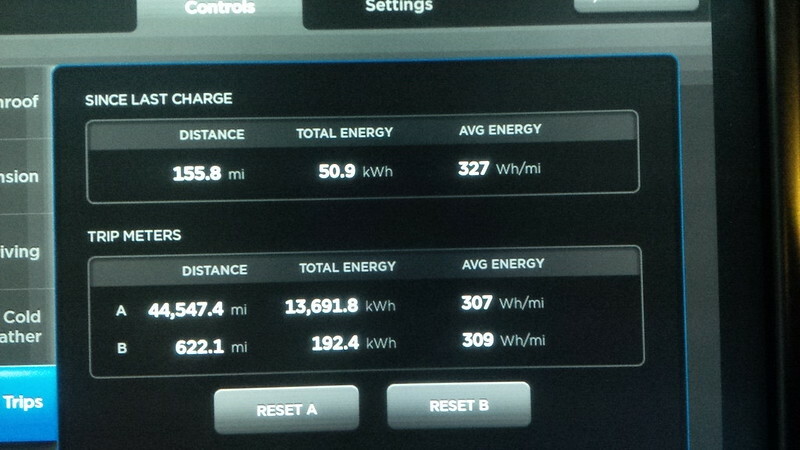 I’ve even hit a respectable 5.0 kWh (200 Wh per mile) on the Active E, as heavy as it is. My most recent trip to San Diego from Los Angeles County gave me a long time to ponder this thought and put a few things to test with the Model S. Since moving to the Model S, I really haven’t given hyper-miling any further thought. Until now. 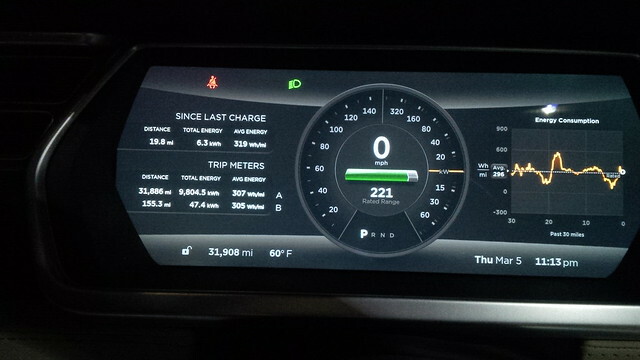 As more Model S roll off the factory floor in 2015 with Adaptive Cruise Control or Autopilot, I’ve been intrigued with the ability to set the number of car-lengths to the vehicle ahead of you (pictured below from a loaner I had driven a few weeks ago.) Figuring that such a feature really lends itself to hyper-miling. However, a more fundamental question presented itself to me. 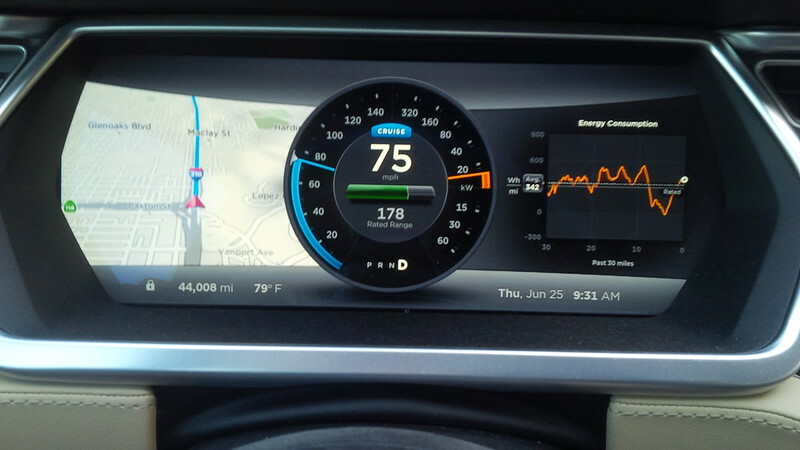 Can I even hyper-mile a Model S? So, during this same trip to San Diego, I followed a smaller delivery truck that was the ideal candidate for my test. I started the drive making note of my average 30 mile consumption that is constantly graphed on my dash (as a preference that I’ve set.) See the example below. 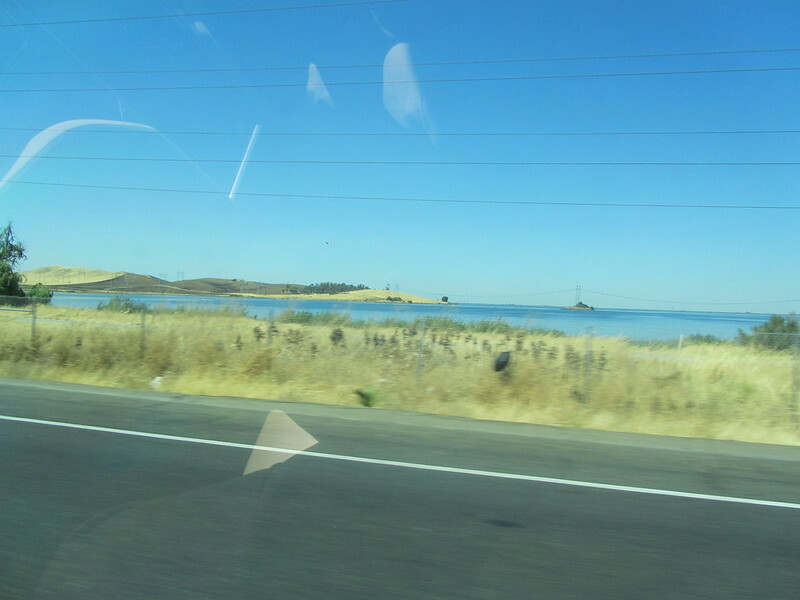 After getting my base (which, I did not record on photographs) I was in flowing traffic of around 75 mph at this point. I decided to see what the effect was if I implememented hyper-miling techniques behind smaller vehicles. As predicted, it didn’t really help much. 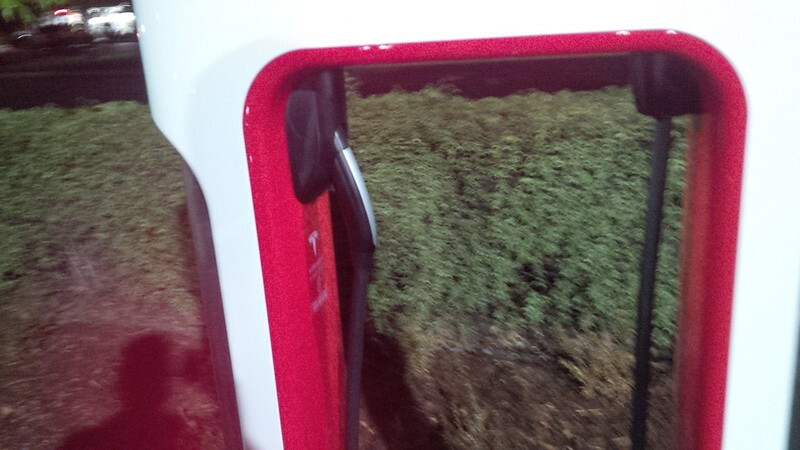 Too much of the wind resistance was not cut-down by the smaller vehicles. Which leads me to try the test with the aforementioned small truck. I decided to pace the vehicle for about five miles and my average Wh per mile consumption during that period dropped at least 20 Wh per mile at a driving speed that was constant with the speed I was following smaller vehicles with. Is that a lot? Well, every bit counts and this was for five miles. Physics doesn’t change, it’s just more difficult to find candidate vehicles to drift behind in a Model S. Next time, I’ll see if I can recreate the test using a loaner with Adaptive Cruise Control to see if I’m better than or if the Autopilot is at trying to hyper-mile. Granted, I have yet to set ACC at less than 2 car lengths for any distance, but that’s what I’ll have to do. 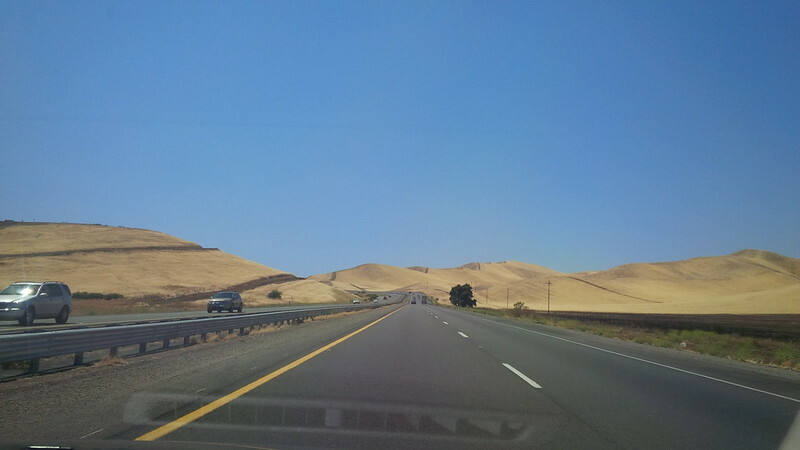 Oh and Range Anxiety, not really… I did that San Diego trip and back (220 miles RT) with no anxiety. 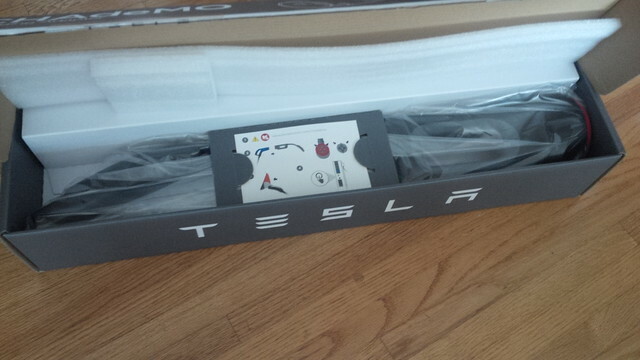 A little over a year ago, I put my name on the waitlist for the CHAdeMO to Tesla Model S adapter. At the time, I was unsure whether I would need it or want it, but thought it would be good to get the option. 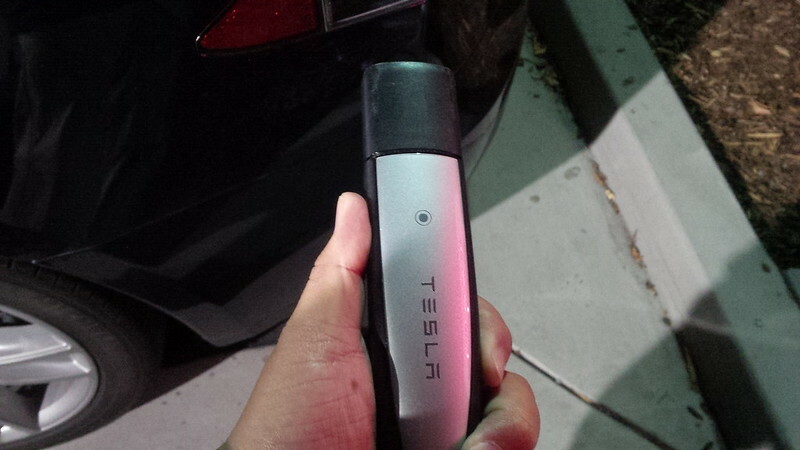 At the time, Tesla wanted around $1,000 for the adapter, and it was very pricey. I figured that I could always turn it down when my number came up. Well… Something happened between then and now. Being a technical person, I found these pictographs to be well done and quite easy to follow. Now, I’m unsure whether they’re great fro non-technical people, but between this pictograph and the one provided for the Premium Rear Console, I have to tip my hat off to Tesla for providing very easy to follow instructions. Step 1 is to order the product on the website. Be aware that (at least in the United States) there is a waitlist (as of March 23, 2015). When your number is called, you have to make the decision whether to order it or not. Step 3 is to open the box, it’s nicely packed with the pictograph instructions above. 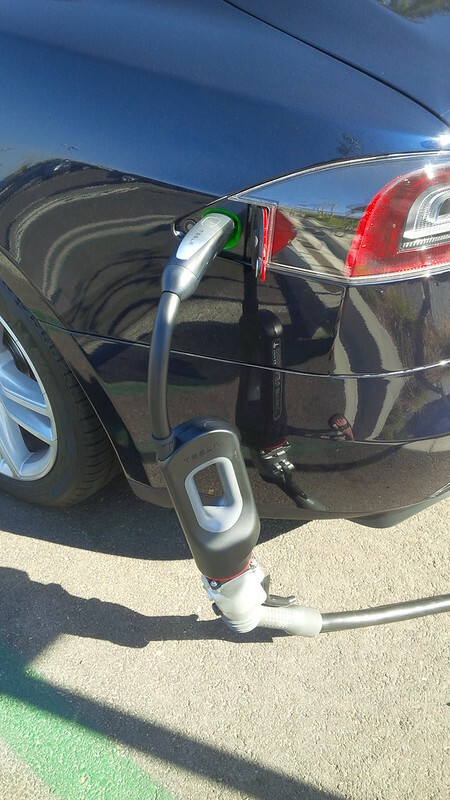 So, how do we use the CHAdeMO to Model S Adapter? Well, it depends on which CHAdeMO L3 Charger you’re using. 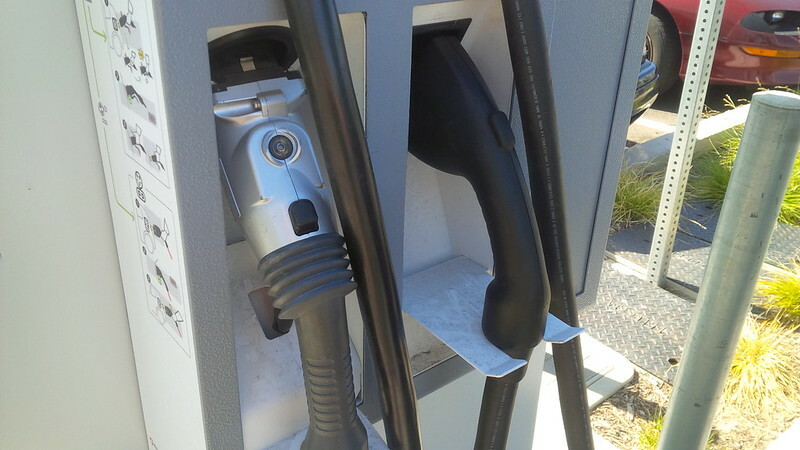 I chose to try the adapter with an Eaton CHAdeMO charger and a Nissan CHAdeMO charger because the two locations that I identified currently provide the charging without a fee. Many of the Nissan CHAdeMOs have been converted to a pay system and require an RFID and payment to charge. I have not yet used one of these. 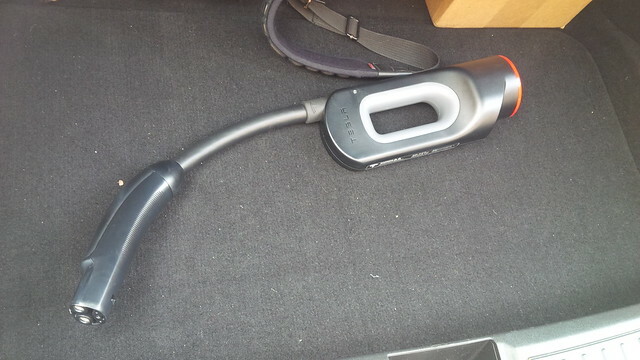 Step 4 Attach the CHAdeMO cable from the L3 charger to the Adapter. Make sure to align the notches appropriately, it won’t fit otherwise. 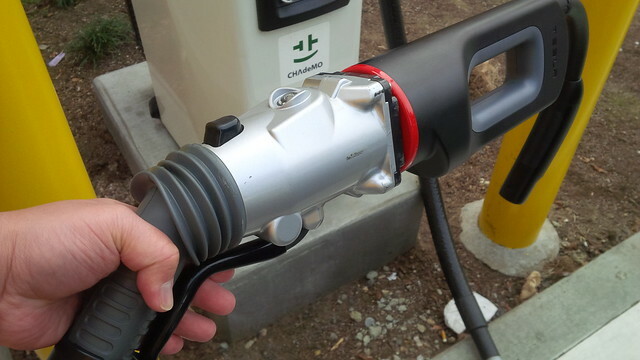 Seat the Eaton CHAdeMO to the Adapter and make sure that it is secure. 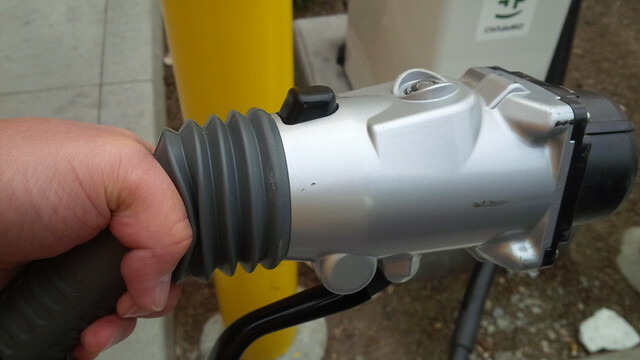 make sure to pull the trigger on the Nissan CHAdeMO to secure the piece to the adapter. 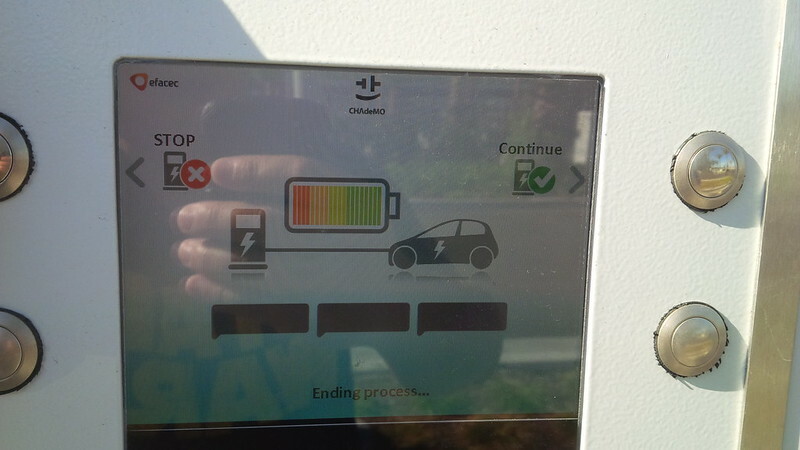 Step 6 is to plug the Adapter to the Model S.
Step 7 is to press start on the CHAdeMO Charger to initiate the charge. 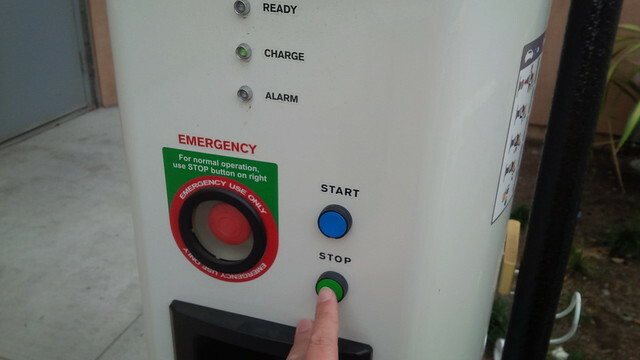 It’s the blue START button, I forgot to take a picture of me pressing the button. Step 8 Go back to the car or go about your business, but put a note on the car if you do leave so that anyone who needs to use the charger can contact you. Better yet, if you choose a note, let me recommend the EV Card from Plug In America or Jack Brown’s Take Charge and Go tags. Additionally, I would also recommend checking into Plugshare so that anyone looking at the location remotely will know that someone is charging, at the moment. 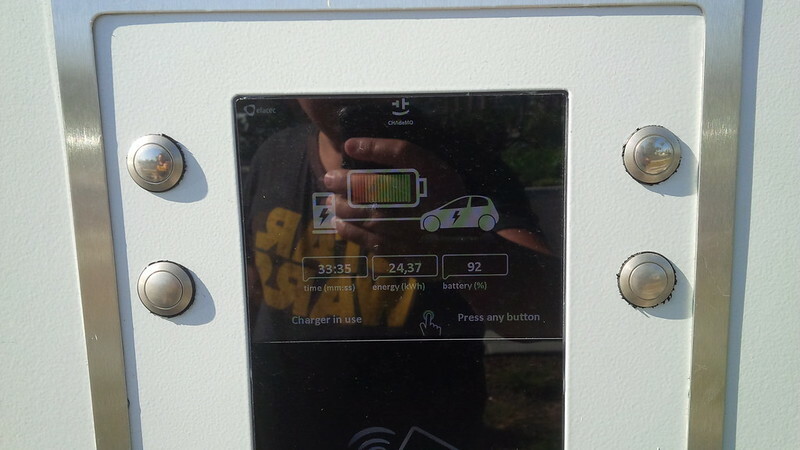 One of the things that you will notice that is different between the Eaton and the Nissan CHAdeMO station is that the Eaton provides an estimate of how long the charge will take to full. The Nissan one that I have found do not do the same. Step 10 Detach the Adapter from the charger’s CHAdeMO cable. Step 10B Press the black button on “top” of the CHAdeMO cable. 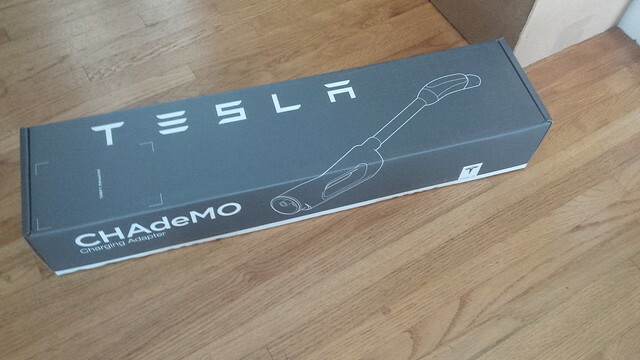 Make sure to be ready to catch the CHAdeMO to Model S Adapter. Step 11 Return the cable back to its proper location. 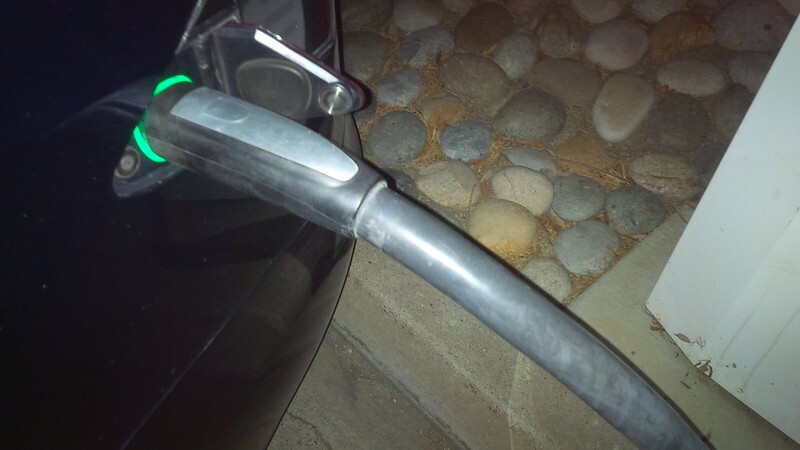 Step 12 Return your CHAdeMO to Model S Adapter back to your car and drive off. 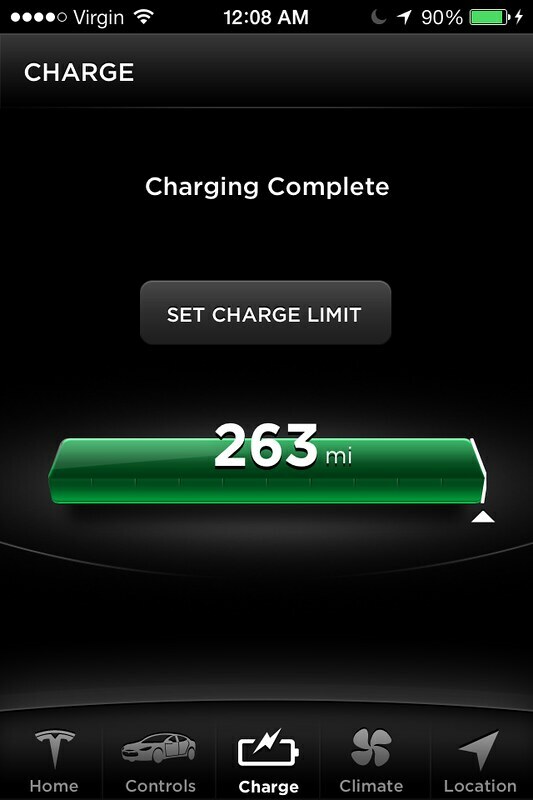 If you’re interested in more pictures of the CHAdeMO to Model S Adapter, here’s my flickr stream. So, is the adapter worth $1,000? I probably wouldn’t have bought it for that much. However, since they dropped the price to $450, it came down to a price that is less than Henry Sharp’s CAN Adapters for the Roadster. How useful is it? Well, on a recent trip to San Diego, I found a Nissan dealership (Pacific Nissan in Mission Bay) that allowed me to use their CHAdeMO. 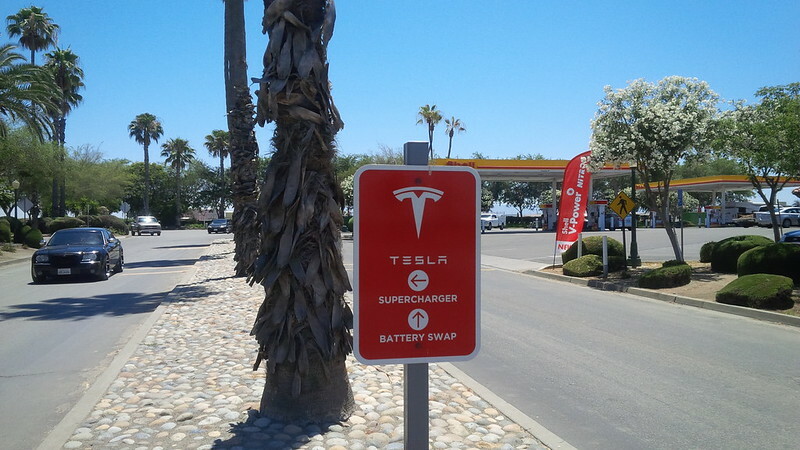 This is useful as Tesla has not completed the build out of the Supercharger down to San Diego. The nearest one is the San Juan Capistrano, one that is reported to be very busy with the seven SC stalls at the location. It was quite useful since I arrived in the Mission Bay area about thirty minutes earlier than I expected to. I’m not sure how often I will need to use the adapter, but at $450, it was at a price point that is intriguing. The product is well-built, well documented, and works. Charging adapters are priceless when you need them in an emergency. There’s nothing more embarrassing than running out of charge. Elon may think that the recently announced 6.2 firmware will end range anxiety, but I find the ability to charge at any rate is comforting. Even 110V at 3 miles per hour could work, in a pinch. 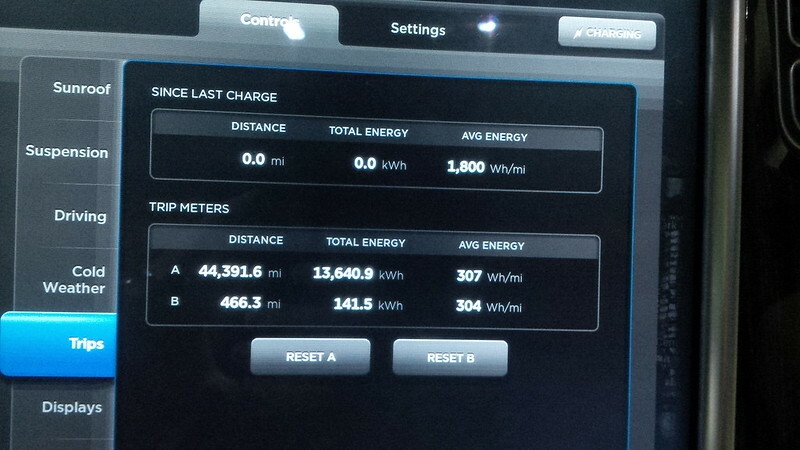 But 130+ miles an hour over CHAdeMO is a bit better than 3 miles per hour. In honor of Swingers… Vegas Baby, Vegas. A week ago was a rite of passage for my EV ownership experience. 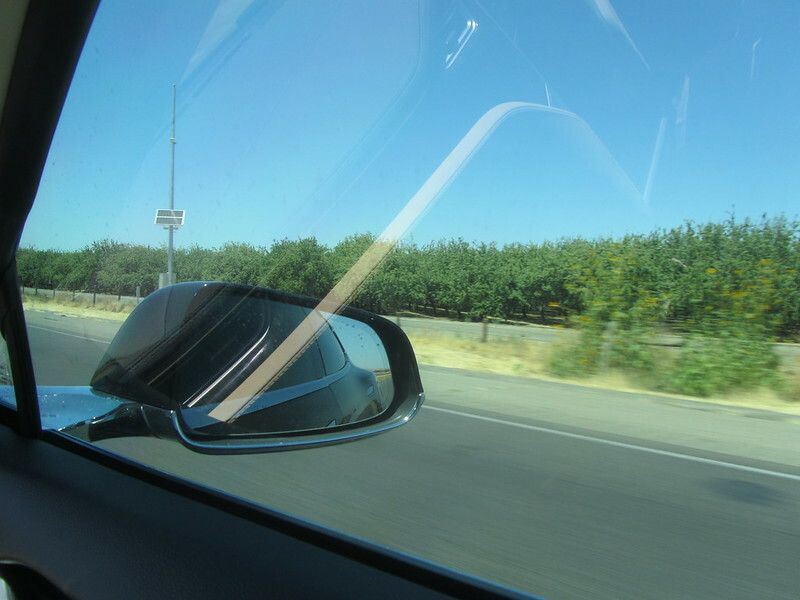 (Not that I’ve driven any longer than my first weekend with the Model S that I wrote about on my blog a few months ago (start here).) The first was our Model S just passed our Roadster for total miles on the odometer and the second is the somewhat of a Southern California driver tradition to “drive to Vegas” as a young adult. The Sin City drive is one that a lot of my contemporaries did as they turned 21 and most still do. As I’m not nearly as young as I have been, this was a trip I normally would have taken an airplane to, after all I’m about 300 miles from home to Las Vegas. 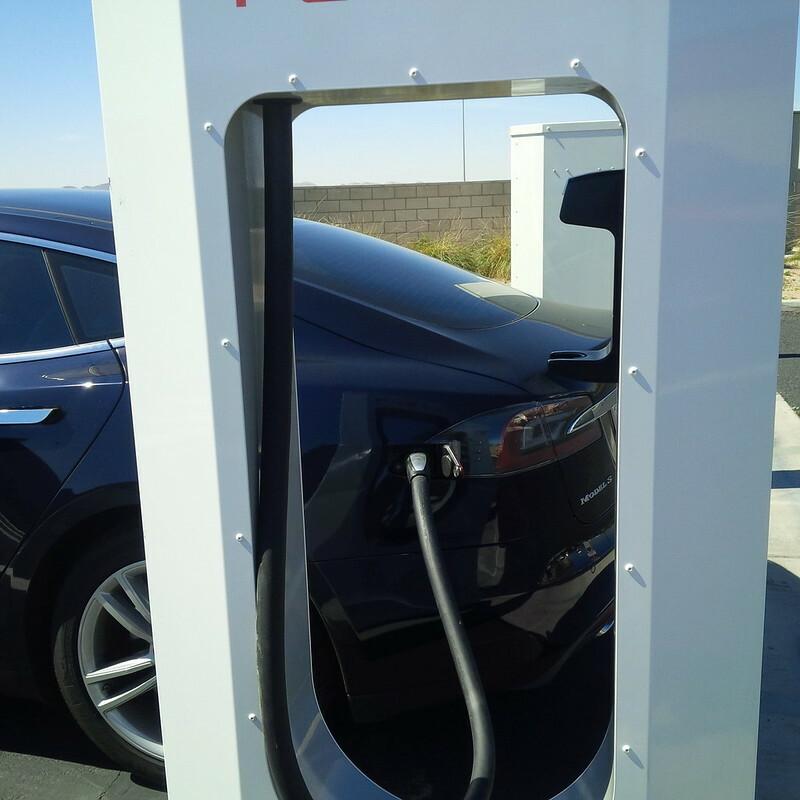 With some published reports of all these new chargers installed on the Las Vegas Strip coupled with hanging out with more environmentally conscious folks have provided me with a little bit of eco-conscience, so, I figured to try driving EV all the way to Vegas for this conference. 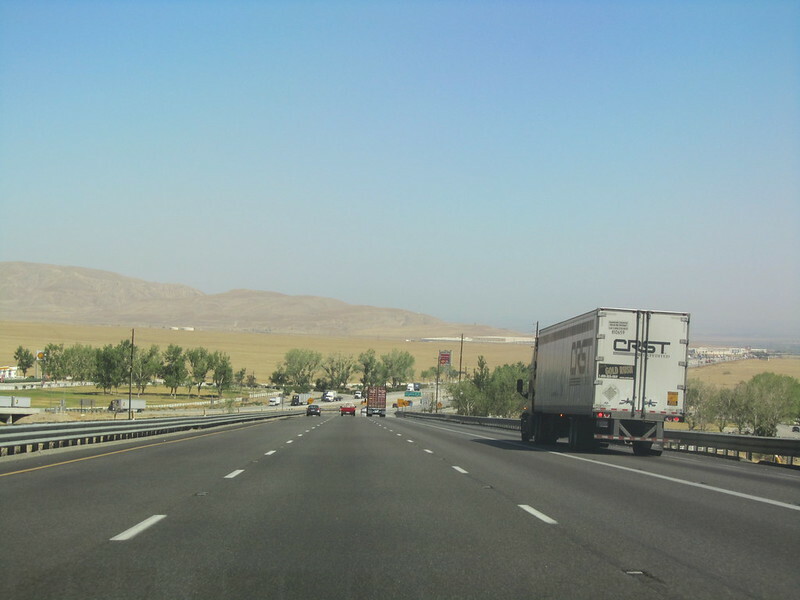 Besides’ there is nothing that convinces a Southern California driver more that a vehicle is a worthy one than a positive answer to the question “can I take the car to Vegas”. 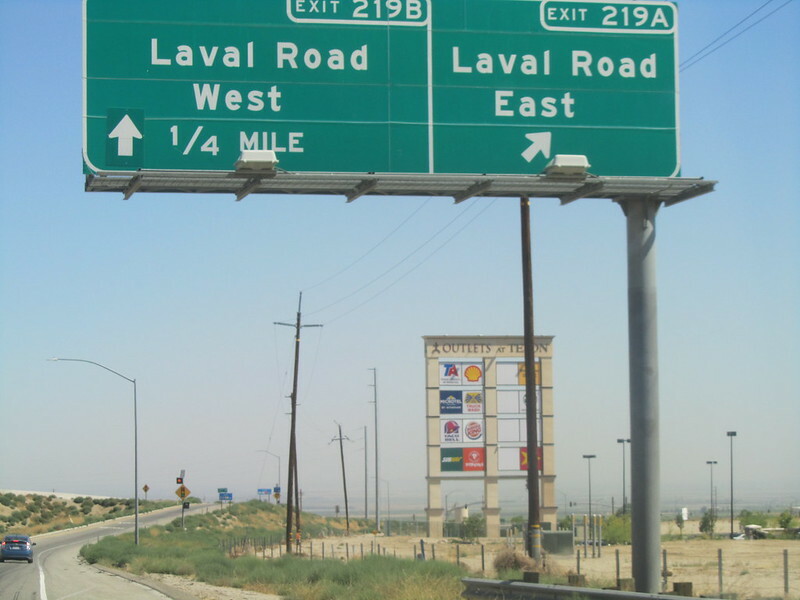 Basically, yes… You can take it to Vegas, and refuel in Barstow (like most do). 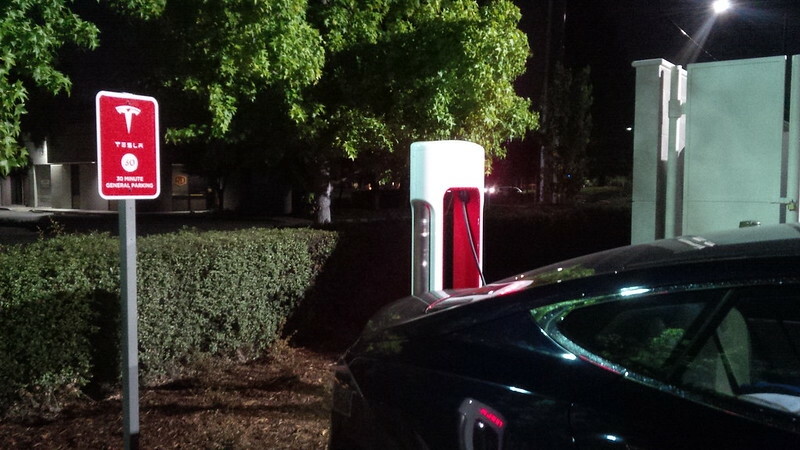 However, your “fuel” is free, courtesy of the Tesla Supercharger installed there. 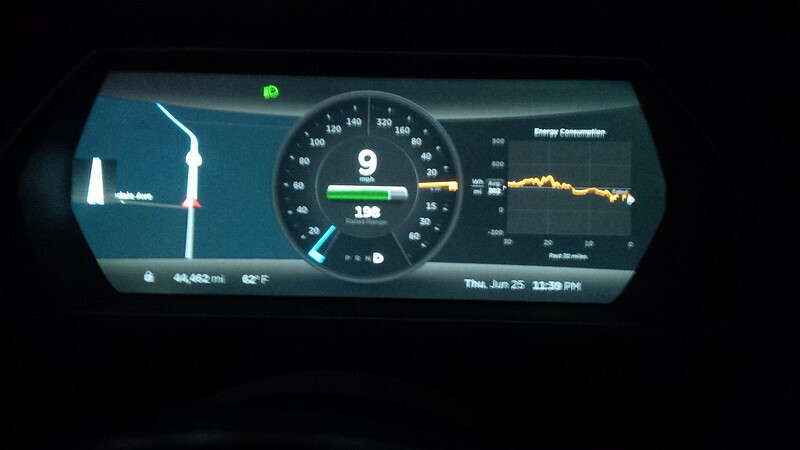 So, drove about 120 miles to Barstow with some wicked elevation changes that was the draining part on the battery. 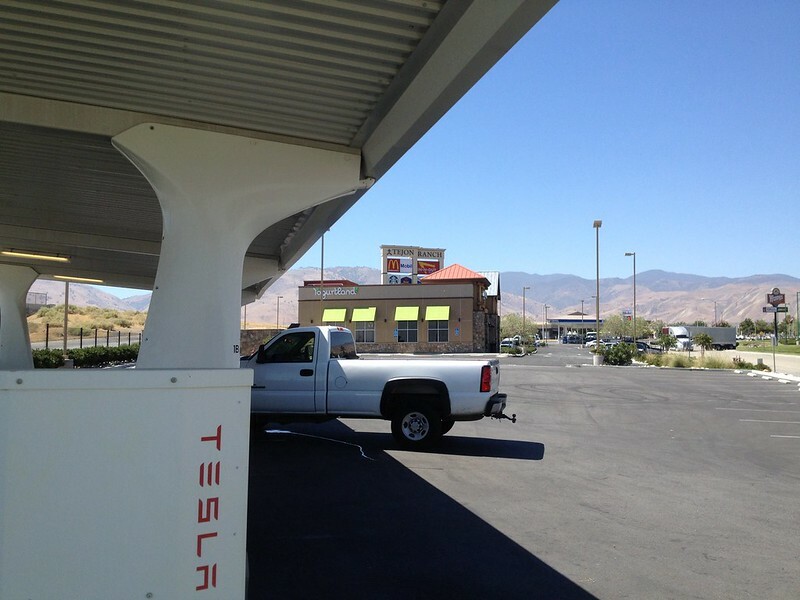 Barstow supercharger pictures in a beautiful sunny day in the California desert. 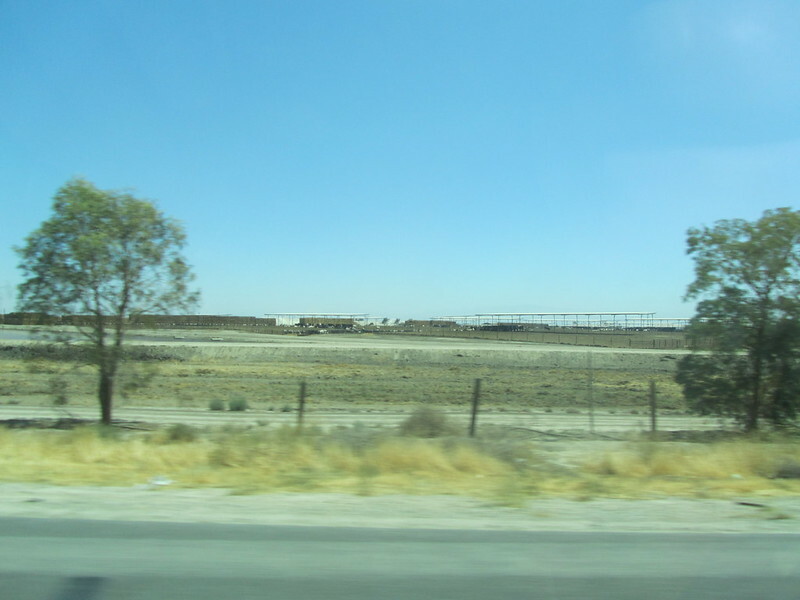 The location in Barstow, was tough to find, it’s behind the Chili’s Restaurant and beside a hotel. So, if you arrive there during a meal service, pop in and have something to eat. 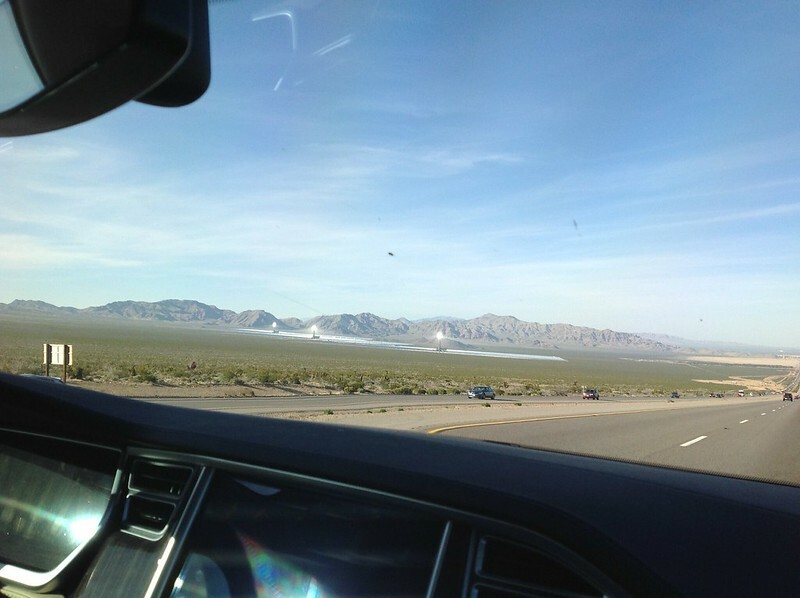 Since we did this drive during the day, we got to see the new Solar Plant that was installed on the California side of the border with Nevada. It’s a cool side-note to see the installation of this facility. 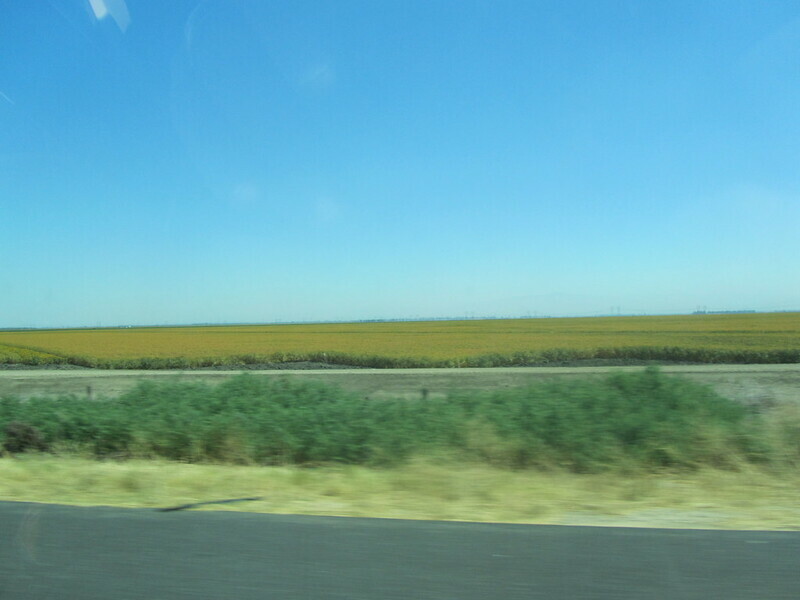 The last time I did this drive was approximately two years ago and did not notice these plants the last time. 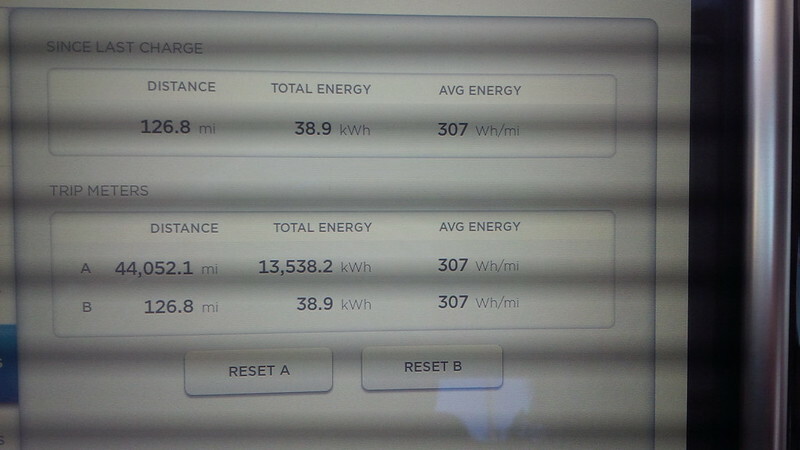 We arrived in Vegas after another 160 mile drive with even more wicked ascents (with consumption above 530 wh/mile) with corresponding descents that recovered some of the charge back with the regenerative braking. My back of the napkin calculation had me lose about 30 miles of range on the ascent and recover about 10 miles on the regenerative braking. 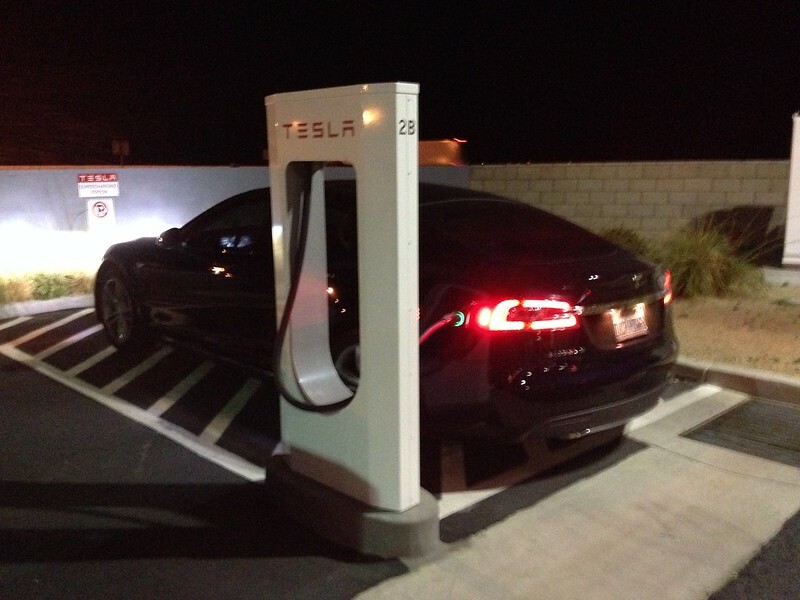 The superchargers in Downtown Las Vegas was in a covered garage in a commercial part of the city. No casinos close by, so saved money by not gambling. Here are the stats for the LA to Vegas portion of the trip. 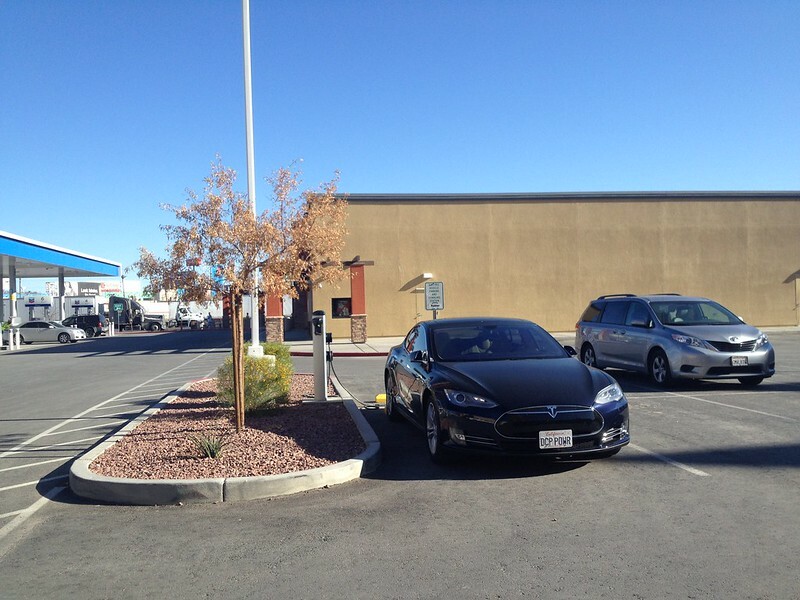 We decided to supercharge in Downtown Las Vegas because we arrived in town with only eighty miles on the tank and several days of Vampire Load ahead of us, figured to get some charge back into the car and let park the Model S unplugged at self parking. 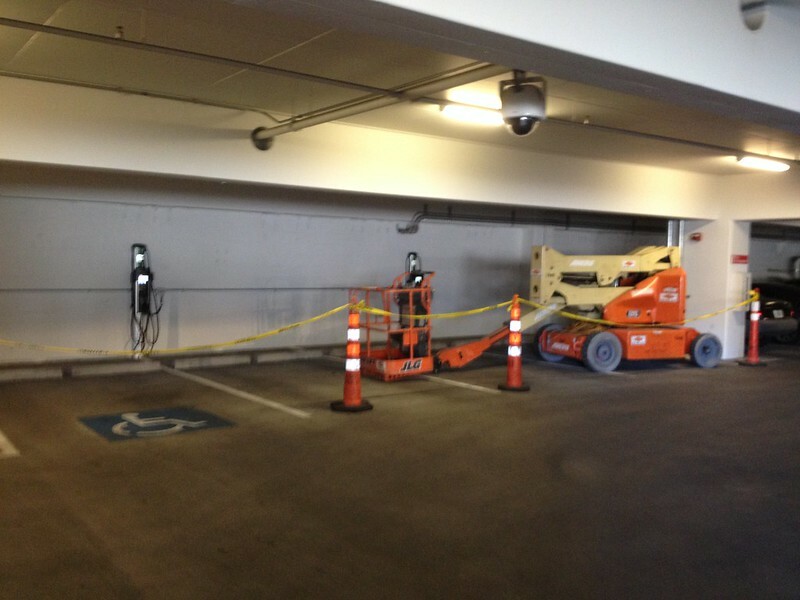 On the first day of check in, I didn’t notice that I walked by a construction site that was installing two Chargepoint J1772 EVSEs at my hotel. 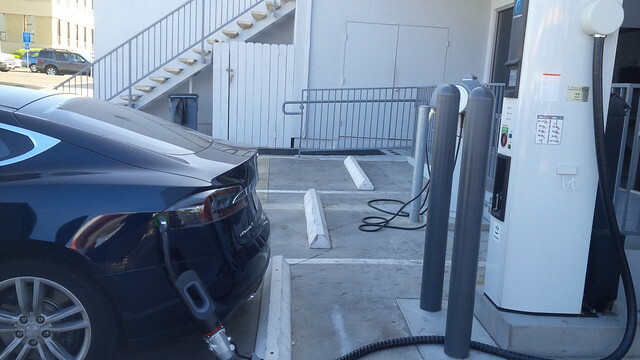 I was aware that Valet Parking had NEMA 14-50 outlets installed which are ideal for Tesla Roadsters and Model S to charge with (as well as any standard EV that decided to purchase a portable EVSE with this capability). However, I decided to park in self parking when we first checked into the hotel. On the second day, I had to get something from the car, and noticed the construction site that I obliviously walked right beside the previous day and took some quick snapshots of the installation of some new Chargepoint CT-4023 dual head/single circuit 6.67kw shared J1772 chargers. I remember reading about these new chargers from Chargepoint and this display clued me into the fact that these newer Chargepoint CT4000 series EVSEs split the power from 32A to 16A when both ports are used. In my experience, the older dual head Chargepoints, the power is 30-32A to each port. The next day, I decided to contact Aria Guest Services to see if I would be able to use the chargers and were told that I may. 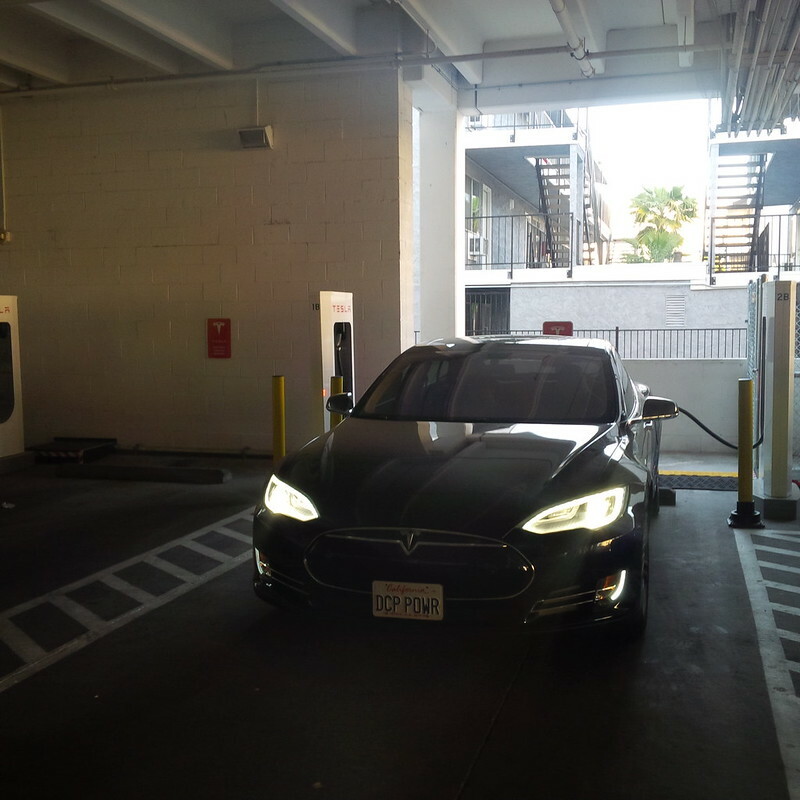 On my way to move my Model S and plug in, I met with the Manager for High Voltage services (in their Facilities group) and was in charge of all the EV facilities for the resort and he mentioned that he had a lot of NEMA 14-50 installed in Valet Parking for EVs to use. Most folks that pack their own NEMA 14-50 drive Teslas (Roadsters and Model S use the same port) or use the modified ones from Tony Williams (the JESLA) and now with the release of the Clipper Creek portable EVSEs, other EV drivers can as well. Since I’m a geek, and more importantly an EV geek, I figured to provide some assistance with testing out these Chargepoint stations. I first plugged into one of the units at full 30A draw and got GFCI a few minutes later. I moved the vehicle and plugged into the other one, and got the same error. I decided to do something that Teslas do well, but other EVs don’t seem to have readily available and drew down my Amperage request from less than what the pilot was sending. 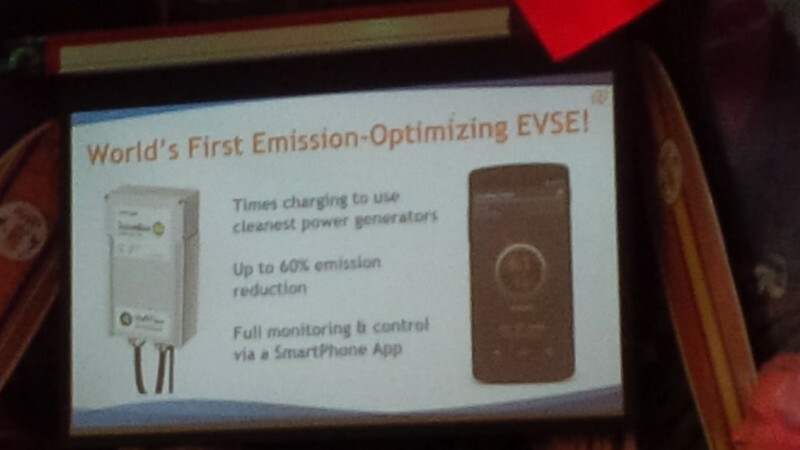 I started the draw at 16A and the EVSE began to work. It projected an eight hour charging session. So, I decided to kick it up to 24A and that continued to work. 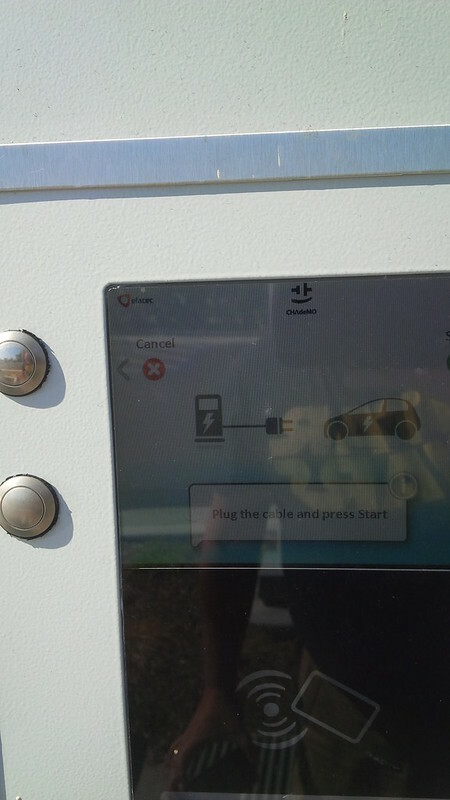 After I had successfully started the charge at 16A-24A, I did what any responsible EV driver should do and added the station on Plugshare. After my last meeting, but before the end of my charge station, I decided that I’ve had enough of being in one resort for a few days that I took the car out to see the rest of Vegas for my third evening in town. When I got back to the car I noticed that the car stopped charging and had a Red Fault on the unit and not just a soft GFCI fault (as was earlier) so I reported the fault to the Aria Facilities Manager. I gave him my telephone number. I also gave him as much detail as I could and went to the rest of the town. One of my other stops in my Vegas trip was to have dinner at the Wynn Hotel and Casino because I figured that the food would be good. 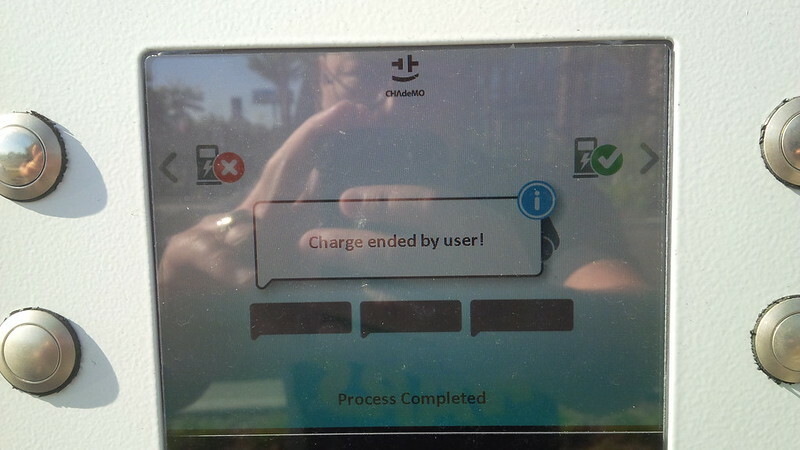 Additionally, it was reported that the Wynn Valet would also charge any EV as long as it had a J1772 outlet. 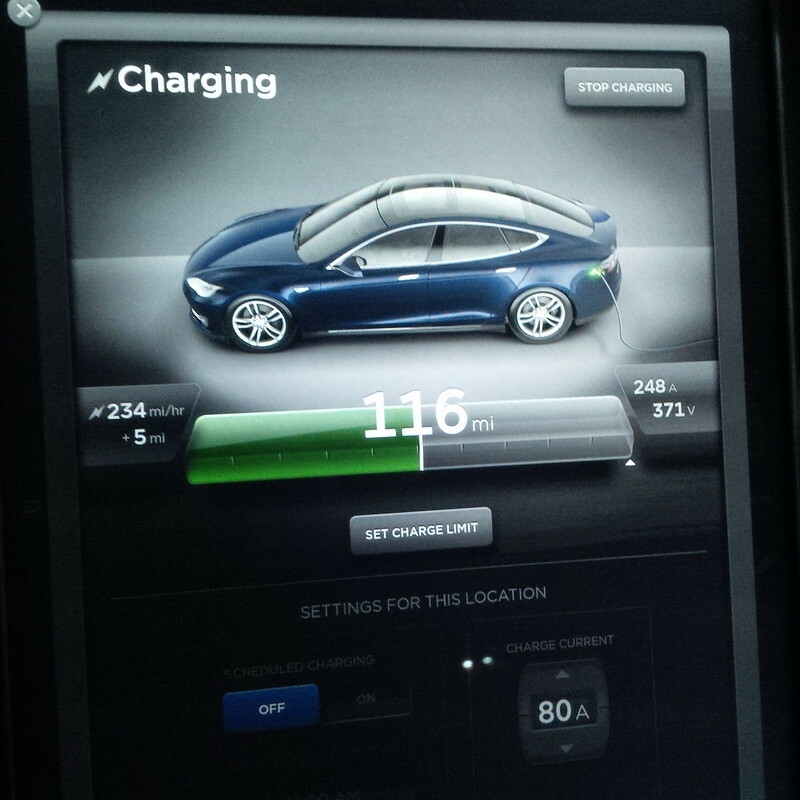 Luckily the Model S has an adapter for this and I decided to try them out. 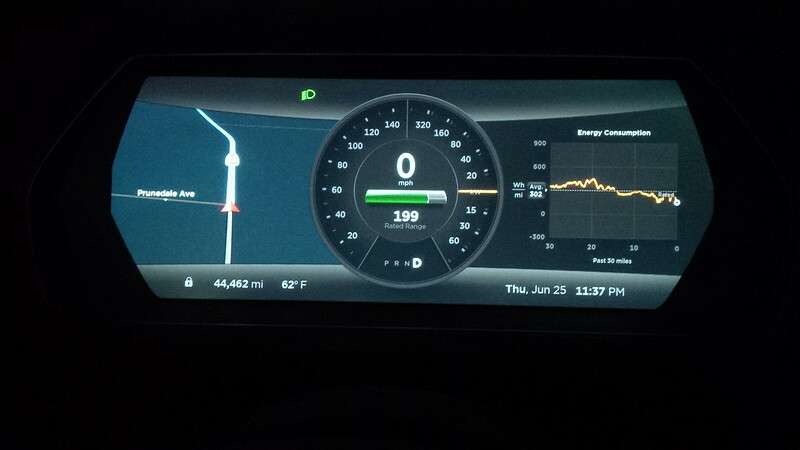 One of my favorite games to play with the Model S that the Active E didn’t do was collect “charging spots” on the Navigation. 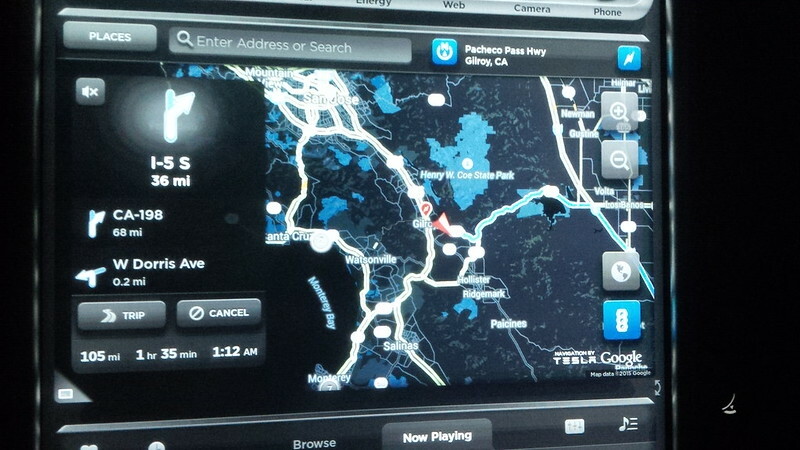 The Model S will put a dot on your Navigation map in all the spots that the car has stopped to charge. It also will store the profile of the type/speed of charge that it encountered at that location. I wanted to populate my Model S visited chargers map with multiple locations in Las Vegas and the Wynn did not disappoint. Though the chargers were J1772, they were full speed 40A ones that would help higher charge vehicles such as the Model S, Roadster, and 2nd Generation Toyota RAV 4 EVs. 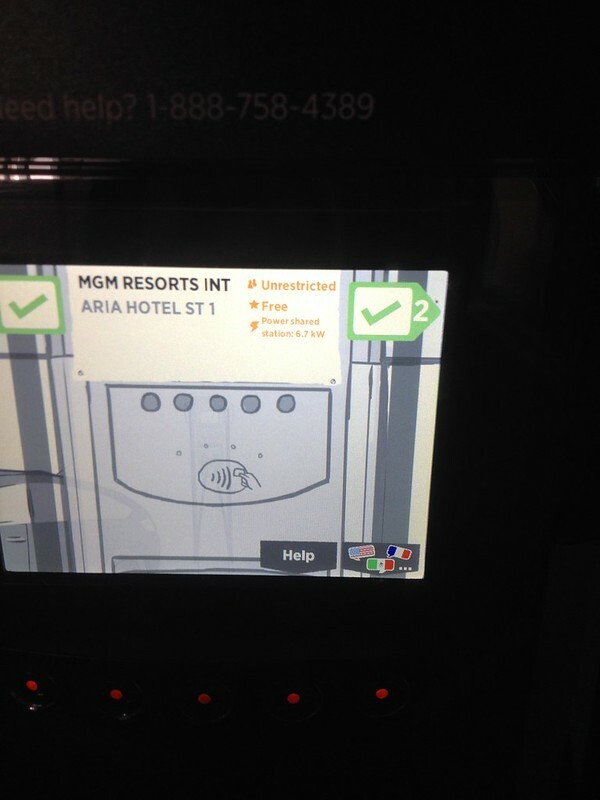 While I was out and about in Las Vegas, the Aria Facilities Manager called and told me that both he and Chargepoint needed to do some further testing and repair of the J1772 chargers in Self Parking, and advised that I should use the Valet parking facilities instead. 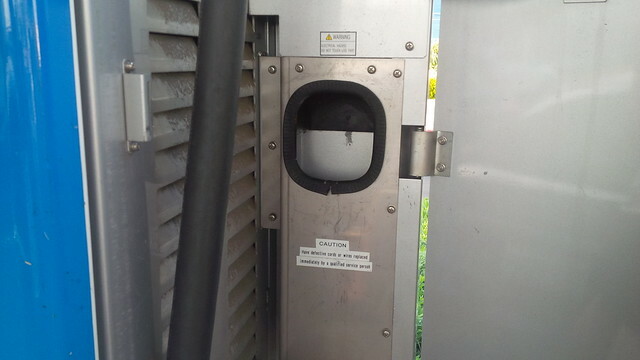 On the wire side of the chargers, he was seeing some “noise” and needed to isolate and clear it so that the Chargepoint chargers would be fully operational. Since we were leaving for home the next day, and wanted to maximize my charge, I did as he requested and parked the vehicle at Valet Parking. The attendants at the Main Valet knew of the Model S and asked if I had my charging bag in the car and I replied affirmatively. 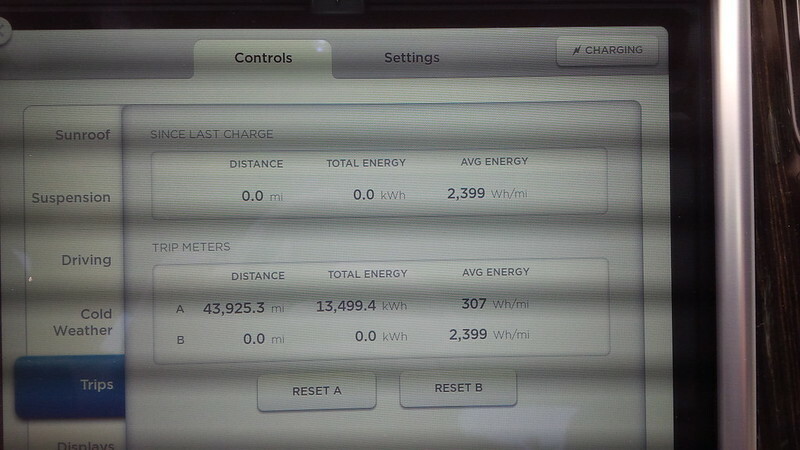 I didn’t actually park and charge the car myself, so I took screen shots of what my Tesla App showed. 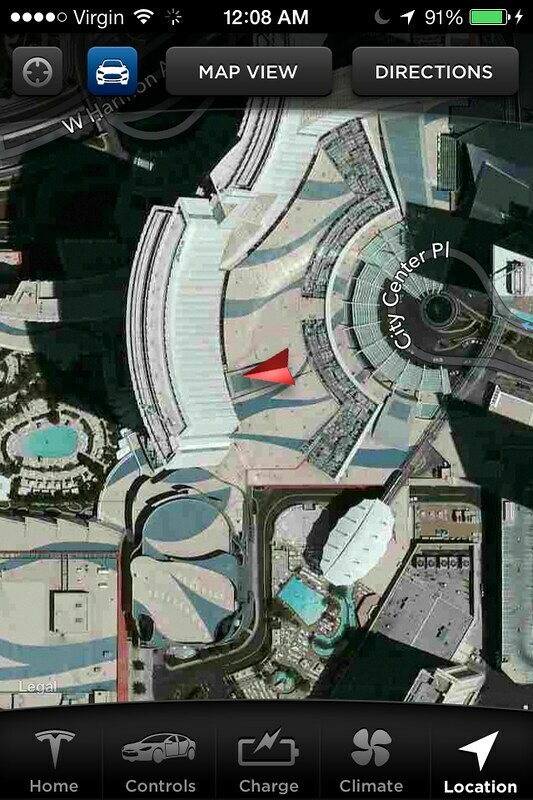 Apparently the Valet Parking is directly underneath the main casino complex. The last day of the conference was just a morning session, so around noon we left the resort and headed out of town. Since this was a travel Wednesday, decided to take a slower pace home. 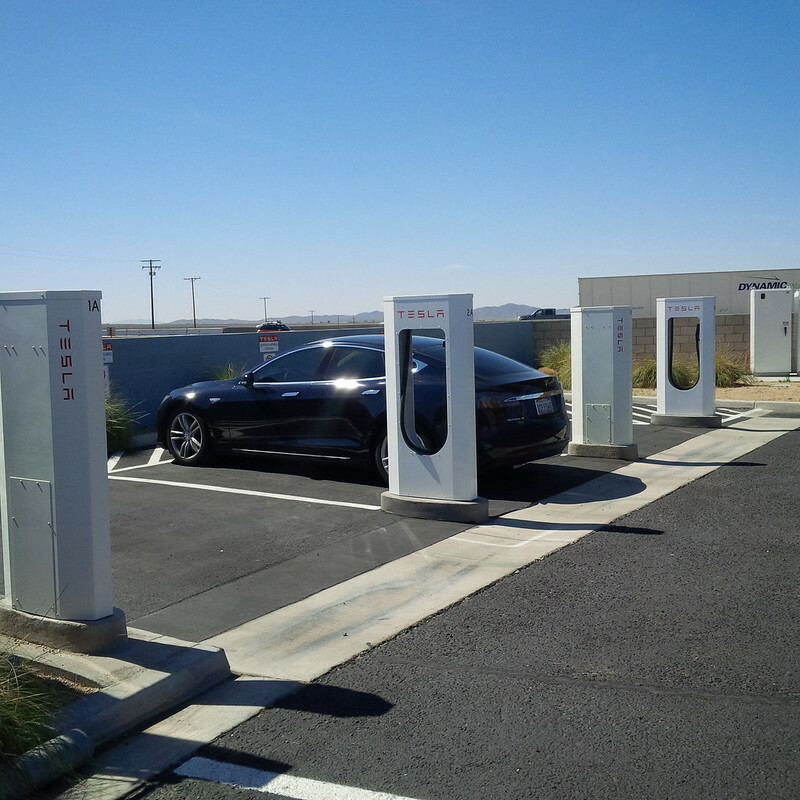 Stopped off at a few casinos that had no chargers (and thus won’t get a mention here) then made the “run to the border.” Both Chargepoint and Plugshare identified a 30A charger at Whiskey Pete’s at Primm, NV. 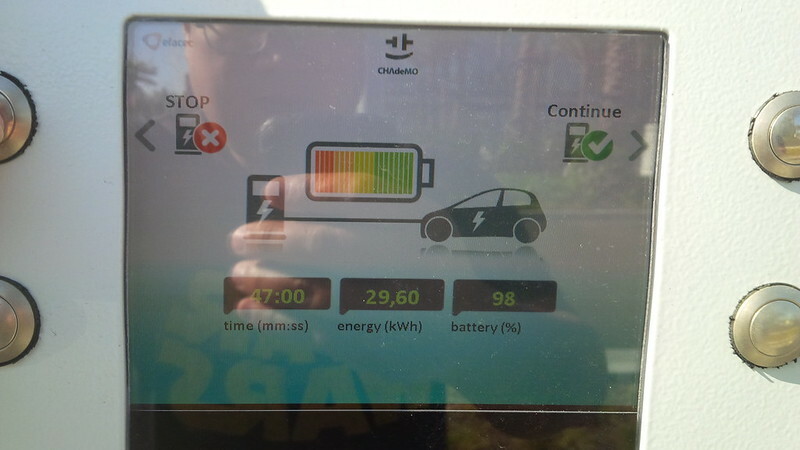 It was a legacy CT2000 Series dual head J1772 charger at 30A a side with the B side as constantly reported as “failed.” I was lucky enough to have been the only EV around, so I took the port and charged up the car for the drive home. The irony of having a Chargepoint charger located right beside the gasoline (petrol) station was not lost on me, and I took this shot because it illustrated this best. It was interesting to note that our rated range was within five miles of our home from the time that we left the border. 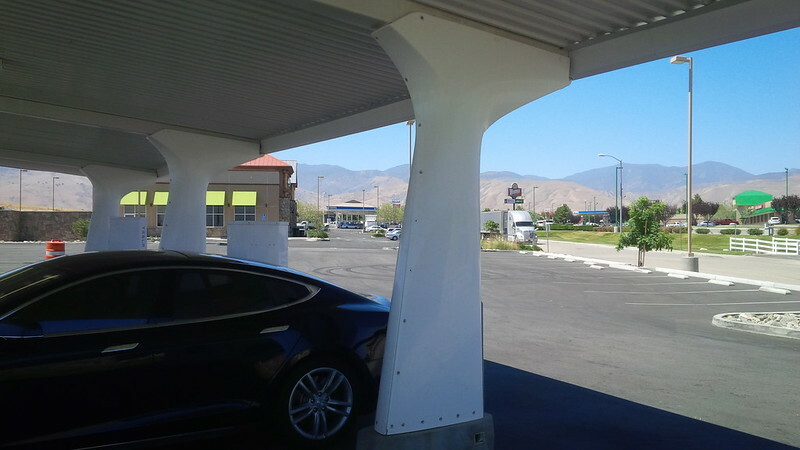 Understanding the elevation changes ahead of us in our trip coupled with my lead foot we made the decision to stop at the Barstow Supercharger again. The speed of the charge was enough for us to do a quick stop so that we can continue quickly. 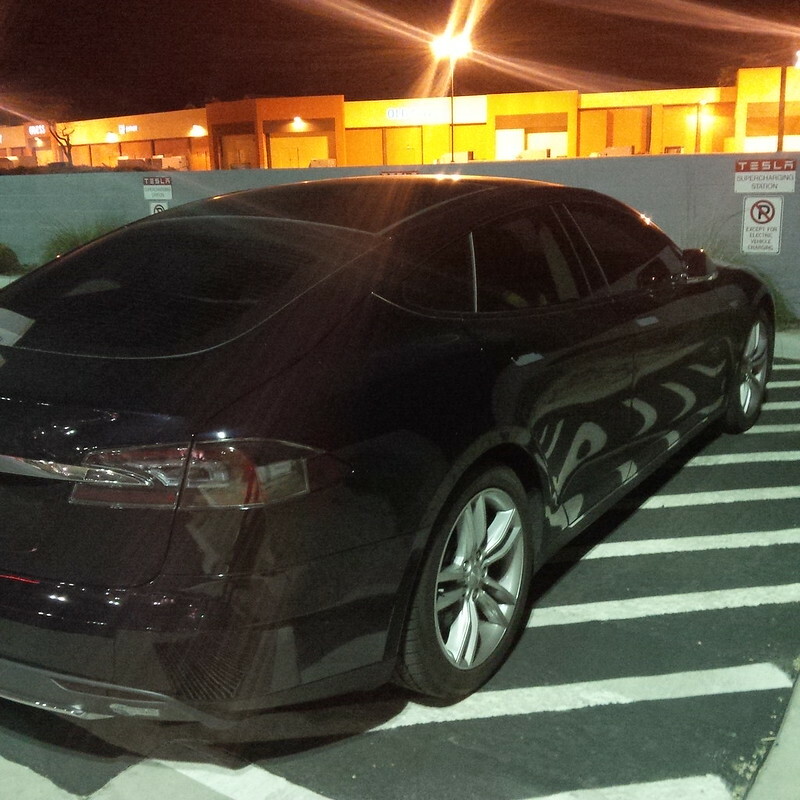 I tweeted this picture commenting how nicely the darkness makes the Model S look a lot cleaner than it actually was. 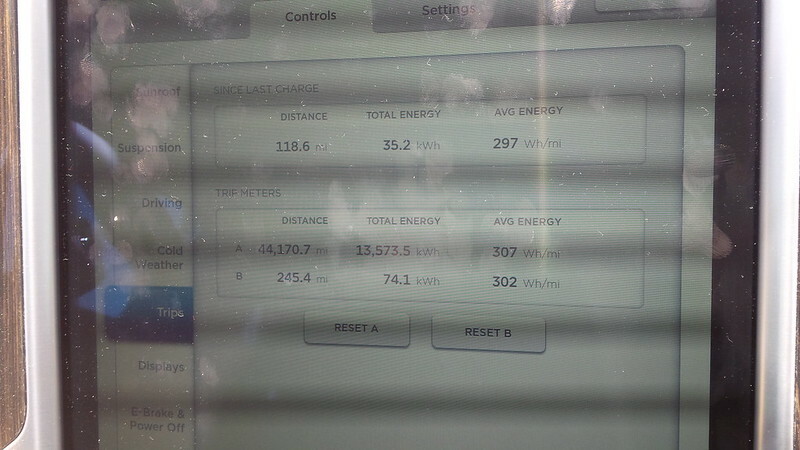 Our stats at the return stop in Barstow. 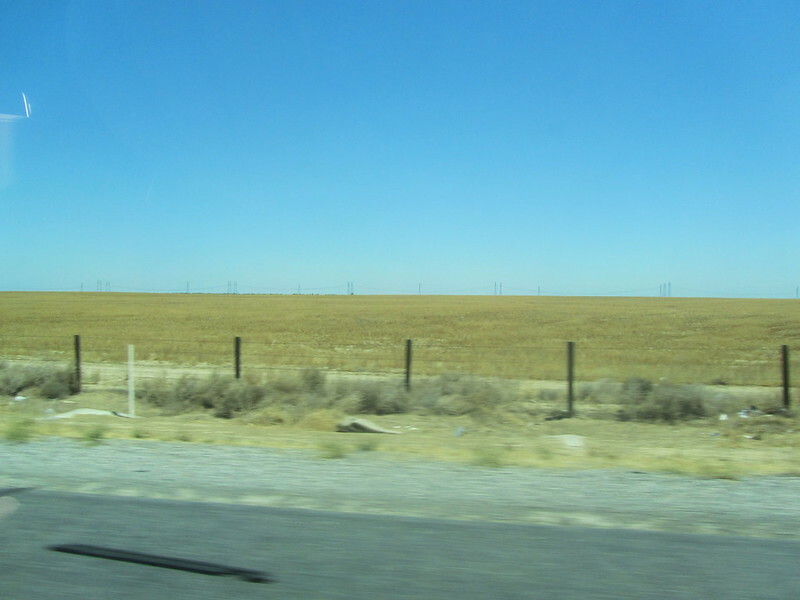 We headed back home from Barstow and the descents were definitely more than the ascents on the way to Vegas. Our ending stats for the entire trip. So, the Southern California native typical question of “Can you take the car to Vegas?” is a resounding “YES!” and the fuel cost is $0. One of the negatives of the end of year is that a lot of folks who have procrastinated are trying to fit as much stuff in before the new year hits. One of the things that affect Tesla owners during this time of year is the probability of being provided a nice P85 Tesla Model S for a loaner is less than at other times of the year. Why is that? Well. Tesla has provided the top of the line Model S for its loaner fleet in the explanation that they did not want any Tesla customer to be deprived of a vehicle that is less capable than the vehicle that they bought from Tesla. (of course the car they do provide is limited to 80 mph, but that’s a small point.) 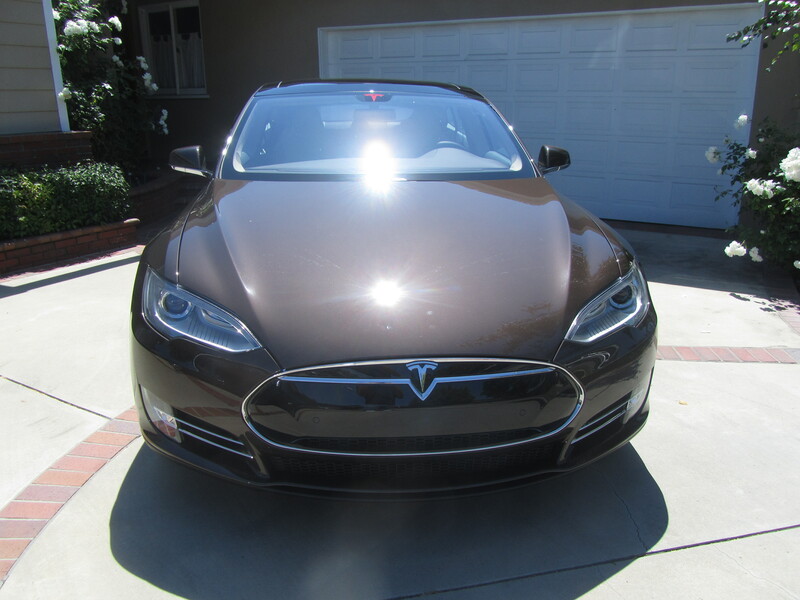 As a result, when the Roadster or Model S is in service, I have gotten a P85 loaner vehicle from Tesla. However, the last time I’ve had service done on my Model S, I was provided with an Enterprise Rental Car ICE Chrysler 200 or was it a Chrysler 300. Either way, it was no Model S. Now this was expected as we’re nearing the end of the year and Tesla makes its loaner fleet available for near immediate purchase from interested parties. When we finalized our Model S order in the summer, we could’ve picked up something similar to our configuration a week out from the time we finalized. I was, at the time, complaining about the increase in accessory prices and my contacts at the Tesla store in Costa Mesa could have provided a loaner purchase at a discount. Additionally, to cover the mileage that the loaner vehicles would’ve endured, Tesla credits so many cents per mile from the sales price. We decided against it, and thus I did not get the vehicle. So, back to the procrastinators and Tesla’s loaner fleet. People that want the full tax incentives and obviously won’t have their vehicles built and delivered by 12/31 still have an option to get into a Tesla and get the benefits due to a new EV purchaser. On a different note, other tax credits are set to expire this year. Namely the installation of an EV charging station. In the past, it would seem that Congress would renew the $1,000 residential credit for installing an EV charging station in one’s home. This year, apparently they did not extend this and as a result, if you, dear US based reader, are planning on purchasing an EV soon and need to install a charging station anyway, go ahead and do so prior to December 31, 2013. You may be eligible to have up to $1,000 credited back to you. If you’re a COMMERCIAL location, the credit is even more generous. It is 30% of the costs up to $30,000. However, it is now December 19, 2013 and seeing that commercial locations tend to get bogged down by such things as building permits, etc. I wonder how probable it would be to install these things by the end of 2013. 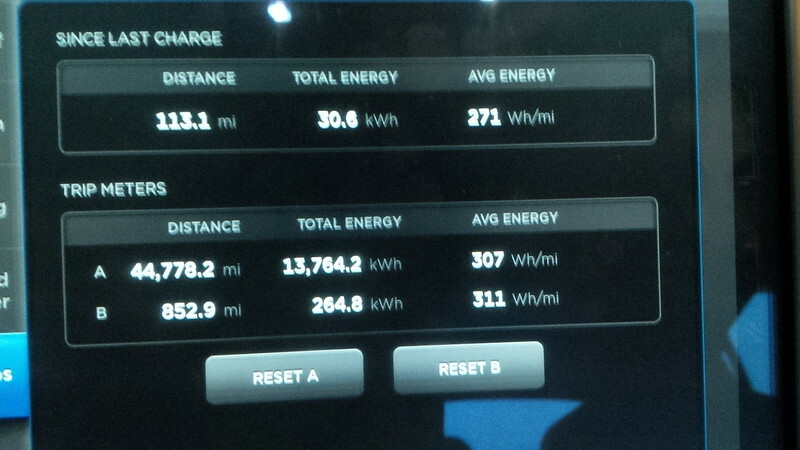 So… It looks like we’ve had the loaner Model S P85+ (hobbled) longer than our Roadster. Since the Tesla Model S loaners are hobbled in terms of speed (80 mph limit) I would like to state that I am unaware of what other features may be unavailable to drivers of loaner Model S.
Since I spend a lot of time on the road, I make full use of the speakerphone and entertainment systems of the vehicles that I drive. The large touch screen IS pretty cool, but what else? First point of comparison is the loaner programs between Tesla and BMW. Tesla loaners are cool vs. BMW ones in that BMW currently does not loan out EVs for Active E Electronuts. We have to go ICE. So, major points to Tesla for this. Additionally, loaner vehicles from BMW are limited to 100 miles a day included, there IS a charge for going over the miles; Tesla loaners have no such restriction. Additionally, you don’t have to “fill it up” to the same level as what you picked up. The P85+ loaner that I’m driving has firmware 4.5, so I’m not sure if some of the idiosyncracies are limited to that, but here are some of my observations. 1) No access to the Web browsing. It’s just blank. I can stream music, but nothing on the browser. 2) This has been previously reported, but a little irritating for me. I use both an iPod Touch and Blackberry for my services. So, when connecting the iPod Touch to the Model S USB port, it just charges the device. With the Blackberry, it can actually play music that is stored in your Blackberry folders. The Active E can connect to the iPod Touch over USB AND the Blackberry as a USB music drive. 3) Bluetooth connection is limited to ONE device. So, if my Blackberry phone is connected to the Model S, I can only stream from the same device. If I connect the iPod Touch over Bluetooth, the phone gets disconnected. The integration over bluetooth leaves much to be desired. The Active E can support a phone and a bluetooth music player over wireless. In fact, the Active E can support multiple phones (the primary and secondary) connected to the system. 4) This might be because it’s a loaner, but I can’t sync my contacts nor recent calls on the car. It is ALWAYS refreshing. I just disabled it. As a result, I have to dial by number or launch the call from my phone. Once again, the car IS a loaner. 5) The GPS doesn’t seem to adjust for traffic along the route. It’s great to show the traffic on the Google Map, but it seems to still route me through the most traffic. 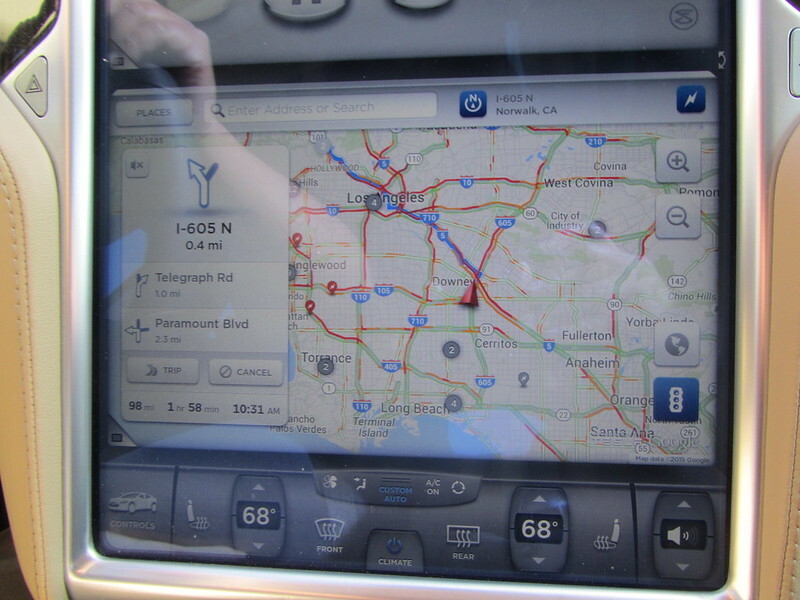 The Active E GPS adjusts for traffic. 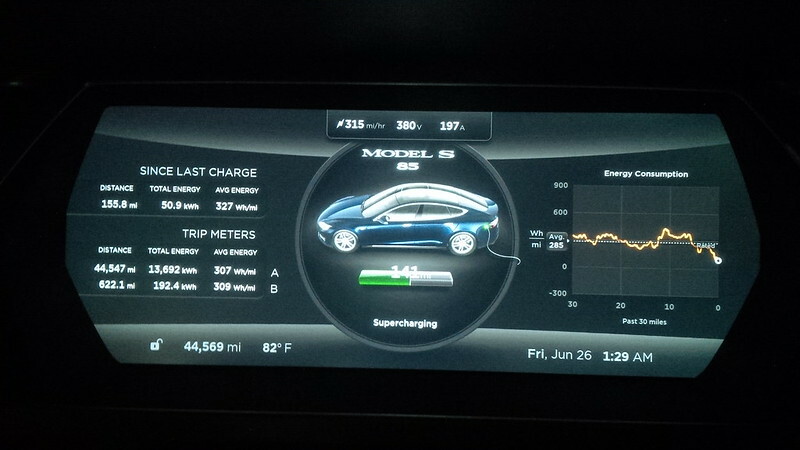 2) Supercharging. As I’ve commented on my new favorite forum, www.teslamotorsclub.com, though the superchargers are supposedly “running slowly” by some experienced types, compared to the Active E… It’s plenty fast. This is by no means a complete list, just some nits and the like. Not enough to cancel our order for our Blue/Tan Standard 85, just stuff to mull over. Dodger Stadium is going backwards on its commitment to being more environmentally friendly. So, the new Dodgers management has been exciting to watch in the moves that they will take to “win”. 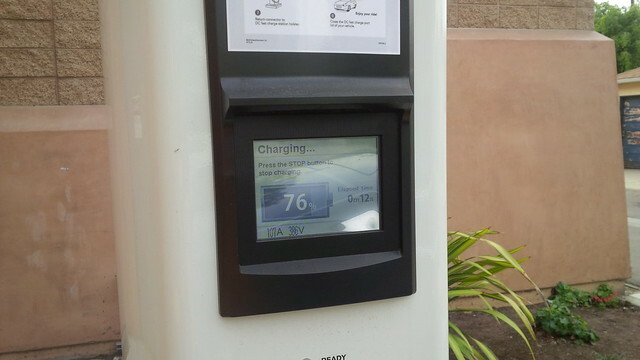 I was notified that after the disappointment that was the 2012 Season that the EV chargers in Lot N WERE going to be upgraded to J1772. That was at least positive. Blue to Green! Measures toward being energy efficient will be instituted- new water valves, flush fixtures, waterless urinals, etc. Wow. I thought. This is really going to happen! The Dodgers will definitely be upgrading the chargers in Lot N for EV Dodger fans (heck even EV Opposing team fans can plug in). Hope you’ve been well and having a Happy New Year! I had a note to contact you about Dodgers Stadium and the EV Charging stations . . . unfortunately we just found out that they are demolishing this site and accompanying infrastructure to make way for some new plans. New infrastructure won’t be available for some time, thus they’ll miss the grant deadline. Very sorry! But maybe the parking lot will be better in the future. Thanks again for all your efforts, we really appreciate it! So, rather than just complain, let me propose something else… a mix of 110V and 240V chargers in ALL Dodger Stadium Parking Lots. A Baseball game can go for 3-4 hours. Some of your PHEV like the Volt or plug in Prius can use gas and can be filled up over 110V just fine during the game. Those that need a faster charge (such as the Leaf or my ActiveE) and are pure EV can use the Level 2/240V chargers during that time to get their capacity back. 110V can do in a pinch to at least get enough juice to get to another 240V elsewhere. That would show that the Dodgers really are looking to go from Blue to Green! If you really wanted to understand your crowd, I would even suggest some higher capacity NEMA 14-50 for those Dodgers fans that are just now taking delivery of their Tesla Model S (I’m anticipating getting mine during the dog days of August and beginning of September.) C’mon Dodger Ownership! The Dodgers and practically any business can get some of its costs to install chargers back with grants that have authorized some reimbursement for installing public charging facilities. 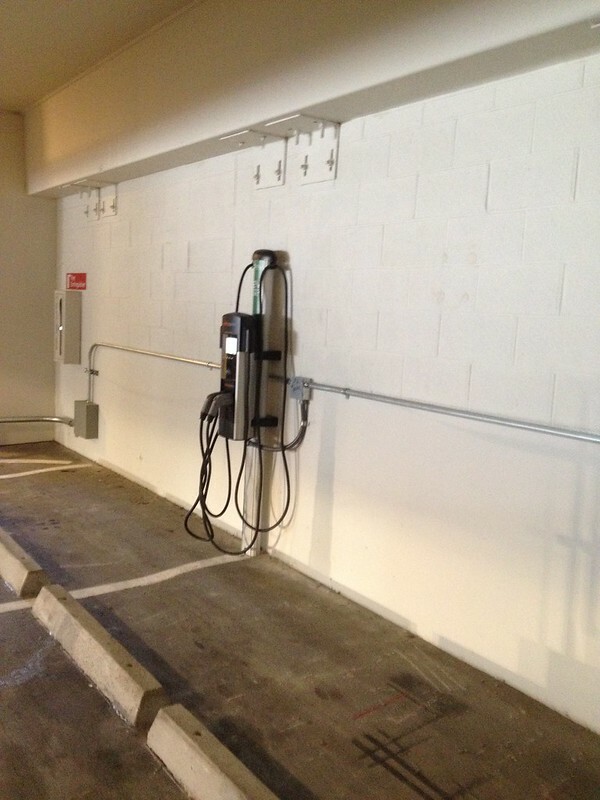 Did you install an EV home charging station in 2012 or have plans to install one in 2013? We have some great news for you. The recent fiscal cliff deal passed by Congress includes tax credits for purchase and installation of an electric vehicle charging station. 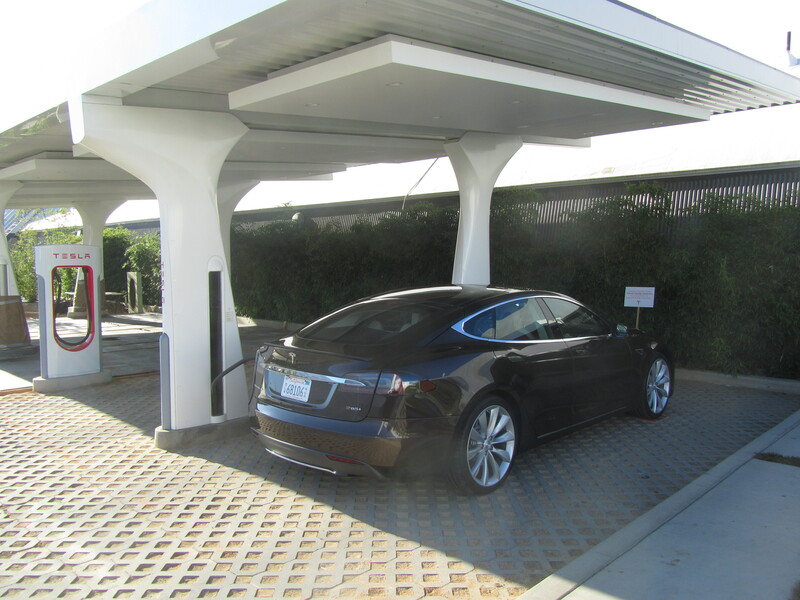 The Section 30C credit for Alternative Fuel Vehicle Refueling Property includes a credit of up to $1,000 for purchase and installation of a charging station for personal use. 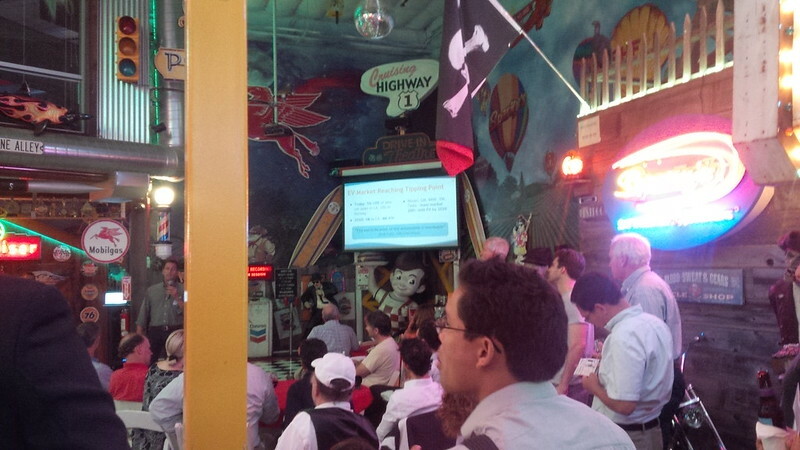 Additionally, Section 30C includes a 30 percent credit, capped at $30,000 for business/investment use per site. This means that any ChargePoint customer who installed EV charging stations in 2012 or who plans to install EV charging stations in 2013 may qualify for up to a $30,000 tax credit per site. So tell your employer or favorite retailer (hint, hint). Please consult with your tax advisor to determine your eligibility. Spread the EV goodness and share this email with people you know in the EV community so they can take advantage of this fantastic opportunity. To view this information on our web site, click here. Are you able to charge your vehicle at work? If so, are there enough charging stations available for you and your colleagues? 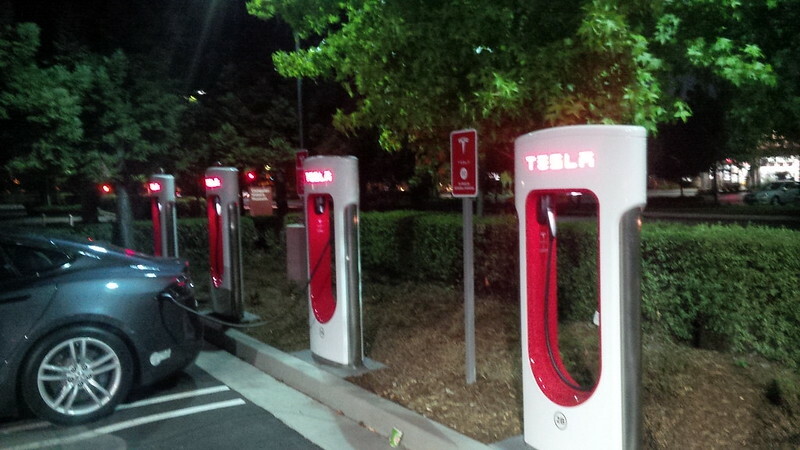 Does your favorite store offer EV charging? 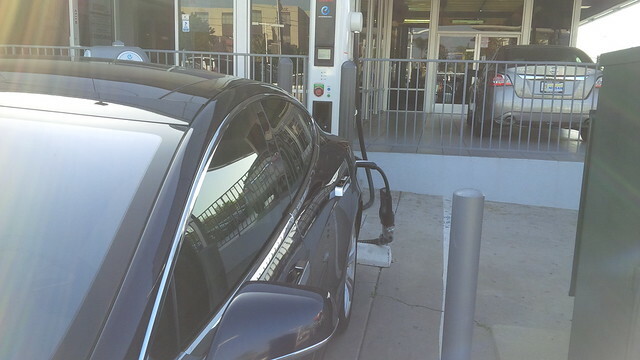 Are there parking lots you frequent that you wish had an EV charger? Oh, and one more thing… happy EV driving. So, between ReconnectCA and Chargepoint, Dodger Stadium could’ve been able to get upgraded for a lot less than it would’ve cost anyone else. Posted on January 17, 2013 January 17, 2013 Categories ActiveE, Public Charging Station, Things to do near EV ChargersTags Anti-Environmental, Bobby Patton, Charging, Clipper Creek, Dodger Stadium, Dodgers, EV Charger, Frank McCourt, Guggenheim Baseball Management, J1772, L.A. Dodgers, Lakers, Los Angeles Dodgers, Los Angeles Lakers, Lot N, Magic Johnson, Mark Walter, Peter Guber, Public Charging, Public Charging Stations, Re-connect California, Reconnect CA, Stan Kasten, Todd Boehly, Upgrade Electric InfrastructureLeave a comment on Dodger Stadium is going backwards on its commitment to being more environmentally friendly. 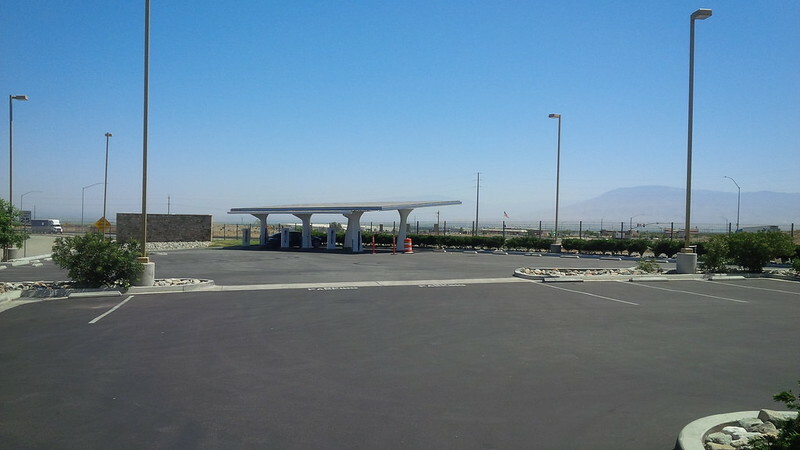 Thanks to fellow Active E Electronut Dr. Bob on the ActiveE forum, it looks like LAX will no longer be allowing parking and charging for free in Lot 6 and Lot 1 beginning March 1, 2013. Also, looks like Helen Chiu (@yesthisishelen on Twitter) posted the following, which looks like a scan of the notice. 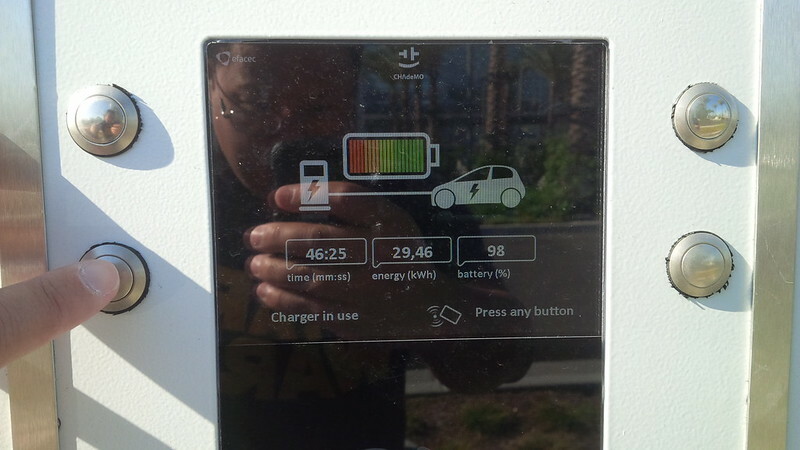 Needless to say, this was a nice benefit that was provided to EV and Plug-in Hybrid drivers that has been running at LAX for quite a while (especially since it was not until April last year that the chargers were upgraded to J1772). So, this leads me to believe that this benefit was at least around for when most people charged with the old SPI chargers (and therefore GM EV1 or the older Toyota RAV4 Electric (not the re-launched based on a Tesla platform). It was great to have this benefit out there, but seeing how California public facilities really need to be upgraded, I suppose it is to be expected that the LAX folks would be counting on increasing their revenue from ALL users of LAX Parking facilities. This just means that I’ll have to plan my trips in and out of LAX with off-site parking in mind and ensure that I have enough charge to get home before I park. LAX Onsite parking is pretty expensive. 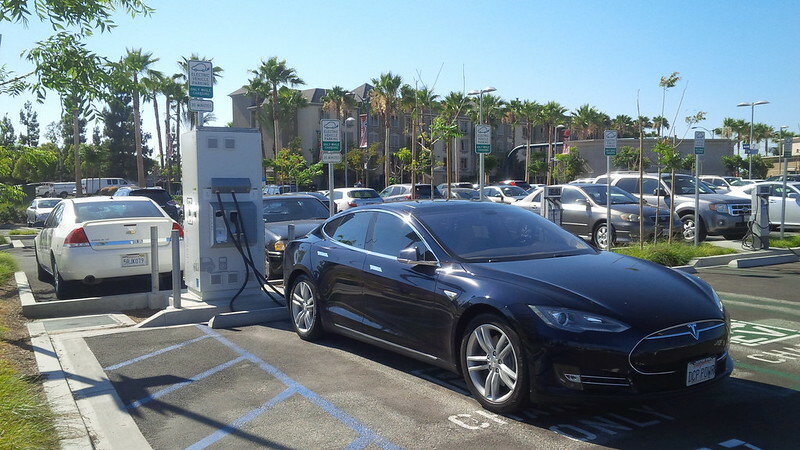 Though the charging will more than likely remain “free”, the charge for parking would mean that one will need to consider OTHER charging stations near LAX. I would suggest the Blink Network ones at Loyola Marymount University. 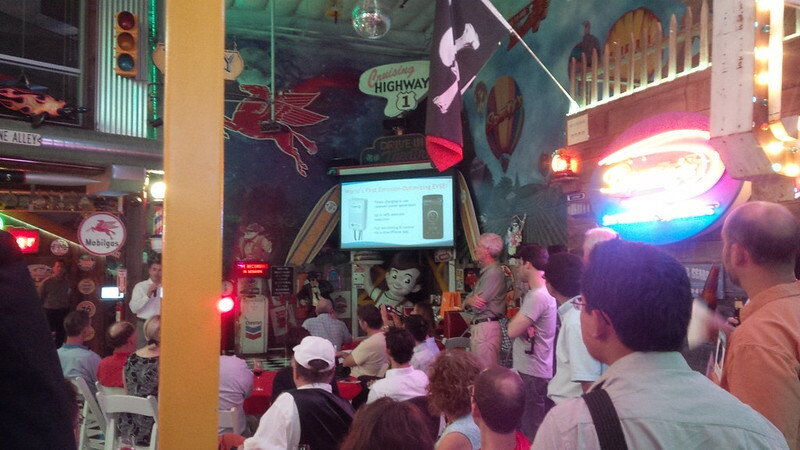 There are about fifteen that show up and cost between $1-$2 an hour to charge depending on the plan that you have. The address to LMU is 1 LMU Drive, Los Angeles, CA 90045. For those that want to appeal the decision – parking@lawa.org is the email address for the folks at LAX Parking.